The Dartmouth Chronicle printed the attached article for us in last Friday's weekly edition. The reporter says he will do a follow-up after the event. My daughter and I swam eight laps at Blackpool Sands yesterday by way of a practice for Saturday's swim of 10 laps, about 5 km. It was not easy as apart from the somewhat cold water giving you an ice cream head (water temp is about 13 degrees but it feels more like 0), there was a small swell and even worse a chop that ensured you got a bit of salty stuff on every breath. It did however abate a bit for the last couple of widths. 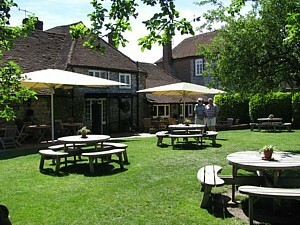 I have yet to get around the pubs to finalise the sponsor total (trying to stay out of the pubs until Saturday night!) but it must be in the order of £600/700. Hopefully, if Mick and I can stay awake long enough after the swim and BBQ we will rattle the bucket around town for a few £s. I thought we would put the bucket money to H4H as well as the Monument, as in the Windemere swim [By webmaster: see first entry for 18 May 10]. 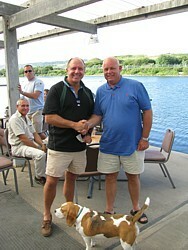 The swim is due to kick off at 1530 on Saturday at Blackpool Sands by kind permission of Sir Geoffrey Newman. This is the article Jim mentions. 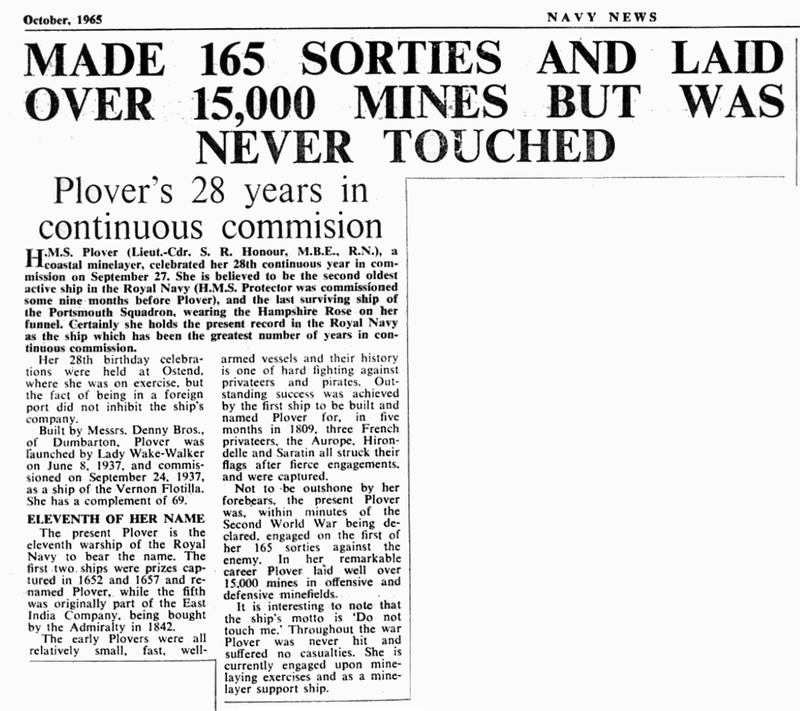 Despite the headline, it is stressed that the monument is intended to commemorate all those involved in HMS Vernon's minewarfare heritage (represented by the mine and its fouling sweep wire with cutter), as well as diving, and this fact will be fully explained on an accompanying plaque or interactive display. On Saturday 26th June 2010, in order to celebrate Armed Forces Day, MCM2 Crew 4 currently in HMS MIDDLETON, set themselves the “CHOKE POINT CHALLENGE”. 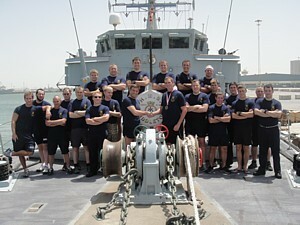 The aim was to run, cycle and row the 350nm distance of the Choke Points that HMS Middleton has sailed from Portsmouth to Bahrain. This includes the Strait of Gibraltar, Suez Canal, Bab el Mandeb and the Strait of Hormuz. The Ship’s Company took the challenge head on, both in terms of fund raising and training. Already seen as one of the fittest ships in the fleet, it was time to prove it. Fund raising began online with money beginning to flood in from all corners of the country, donations ranging from £5 to £100, soon the pot was heading towards the targetted £1,000. 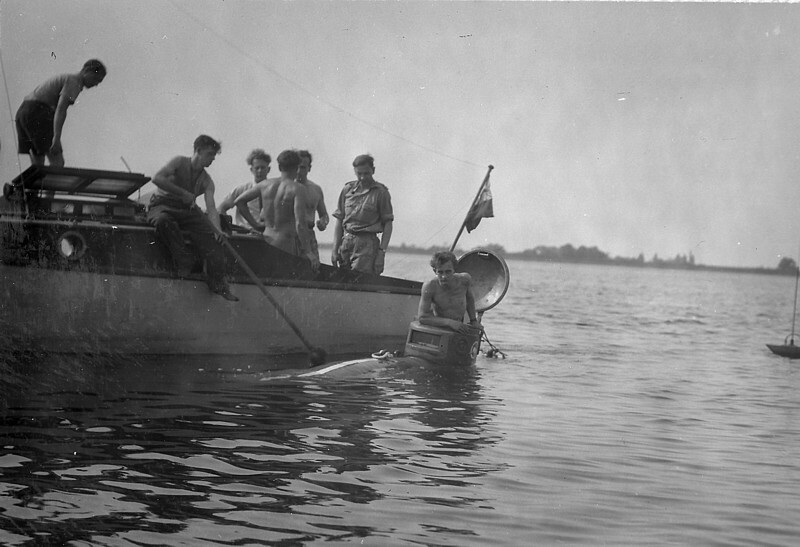 In terms of training, being at sea in a small ship sets its own challenges, with spare space at a premium an element of ingenuity is required with most people utilised the upper-deck rowing machine or undertook circuit training on the sweepdeck during their time off-watch during operations at sea. Although the upper-deck sounds a very pleasant environment for excercise, temperatures in the region at this time of year are regularly above 40 degrees C, providing a definite mental and physical challenge. It wasn’t long before MIDDLETON was alongside and the day of the challenge arrived. 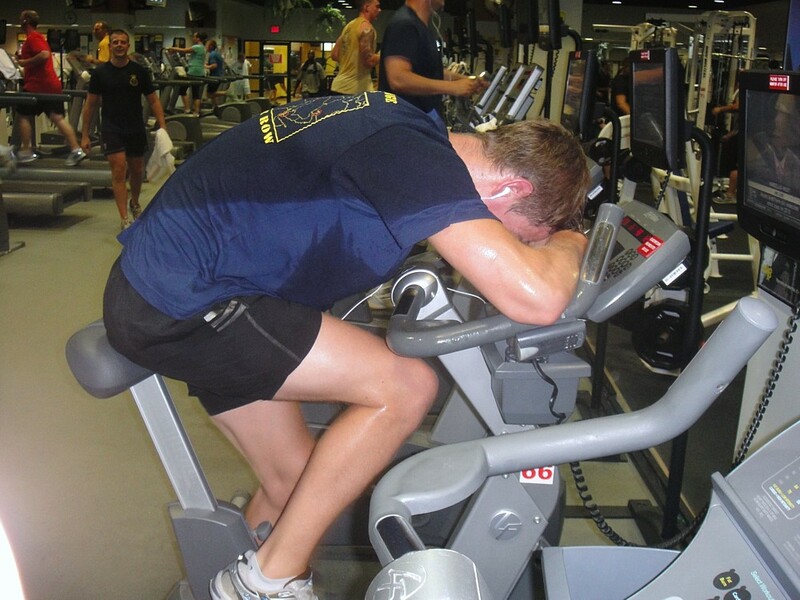 Nearly every member of the Ship’s Company signed up to take part in some way, from those who chipped away 30 minutes on the cycle, rowing machine or treadmill, to the 13 members of the Ship’s Company who challenged themselves further by completing all three events back-to-back. The day started strongly with the CO setting a high individual distance on the row of 7,762m in 30 minutes which looked strong to keep top spot untill AB(D) Penney pipped him with a 7,960m to begin his triathalon of events later that afternoon. By lunch time the challengers were 20 miles ahead of schedule and, despite several members of the Ship’s Company struggling to walk after the triathalon challenge, things where looking good with LCIS Peggie and AB(D) Whitney leading the race for the best total distance of the triathaletes. The final competitor, ET(WE) Cameron, began his challenge at 1800 commencing his triathalon with a strong 7,750m row. The trend continued, with him finally taking the top spot with a whopping total distance of 18.5 miles. In total MCM2 Crew 4 completed 417.4 miles and at the time of going to press, over £2,200 had been raised making this event one of the biggest fund raising events for the RNRMC this year, an unbelievable achievement, especially considering MIDDLETON has such a small Ship’s Company and is deployed on high intensity operations. HMS MIDDLETON is currently serving as one of the four OP TELIC MCMV units, safeguarding the maritime seaways within the Arabian Gulf, training with naval units from regional and coalition nations and conducting warm water training. HMS MIDDLETON sailed from Portsmouth in February conducting the first Operation Telic Hunt Class passage to the Middle East as an individual unit. She will remain based in Bahrain for the next three years, although MCM2 Crew 4 will be replaced by Crew 7 later this year when Crew 4 returns to Portsmouth to take over HMS Hurworth. 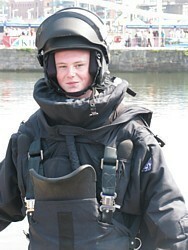 MIDDLETON hopes to raise as much money as possible for the Royal Navy and Royal Marines Charity. If you would like to make a donation please use the link provided. Many Thanks! MCDOA member Jason White, CO of the Northern Diving Group (NDG), says his team commemorated Armed Forces Day at Whitehaven in Cumbria last Saturday as part of the Whitehaven Festival. 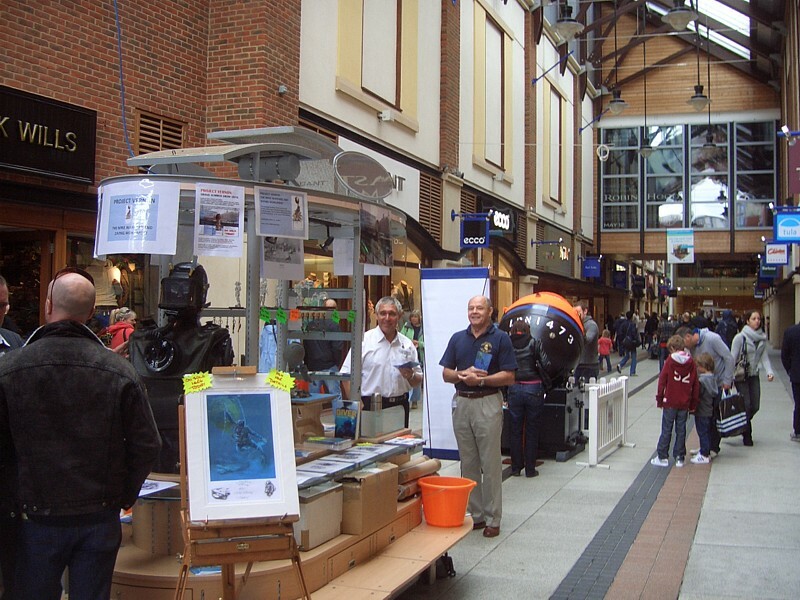 They organised a static EOD display, including dressing the locals in an EOD suit, and a diving demonstration alongside one of the Historical Diving Society's (HDS) Working Equipment Groups and Sellafield divers. 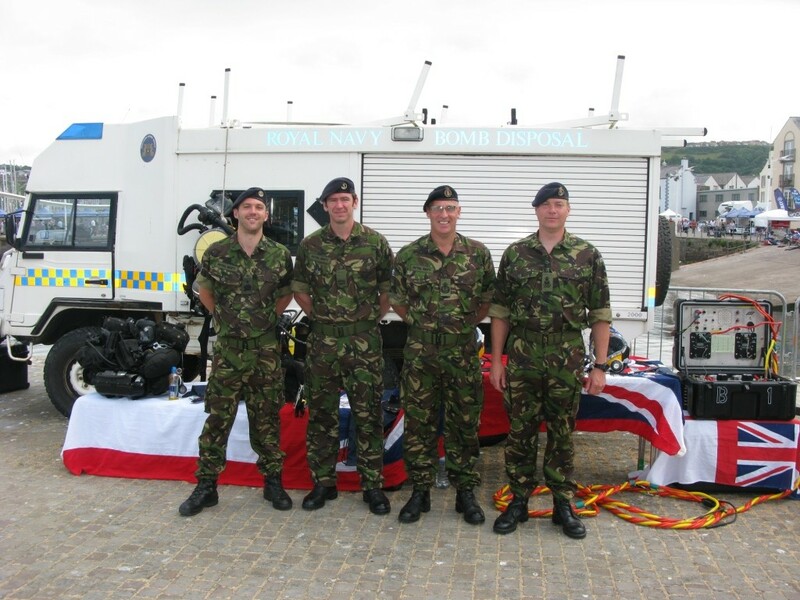 NDG was using the RN's new Clearance Divers Life Support Equipment (CDLSE) and this provided a fine opportunity for the crowd to compare old and new military and civilian diving equipment. Jason says the festival was a huge success, particularly in view of recent events in the town, and it was great for the team to be involved. 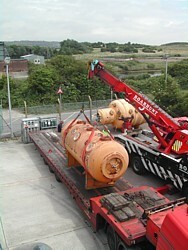 Here are a couple of pics taken during today's removal of the second chamber from ye olde RNPL (Royal Naval Physiological Laboratory at Alverstoke) to the Defence Diving School (DDS) on Horsea Island. 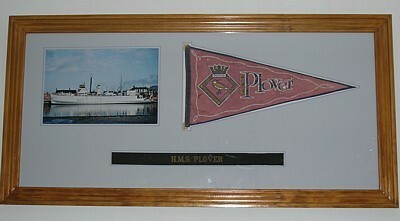 The rivetted chamber was the first RNPL chamber, installed in 1944, in which the essential WW II pioneering studies were carried out on oxygen tolerance and submarine escape by free ascent, amongst many more. The later 690-metre chamber broke a series of deep diving world records starting with 450 metres in 1970 and ending up with 660 metres in 1980. 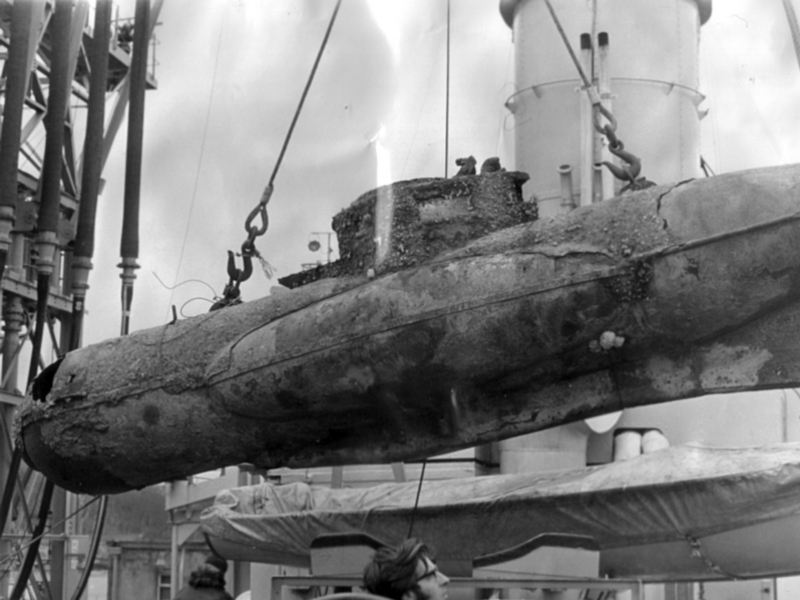 It also enabled the extension of submarine escape to very great depths. 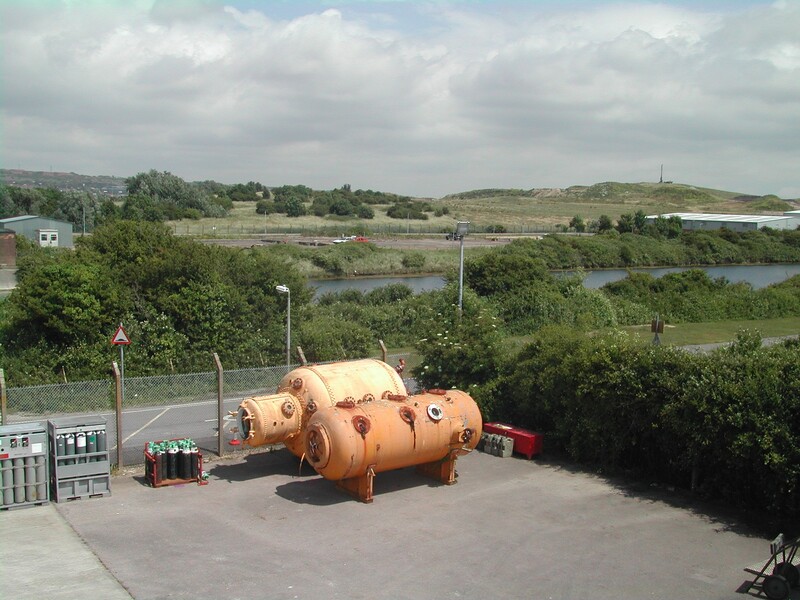 The Horsea location is a temporary store and it is hoped that the chambers will be refurbished and placed on public display at the proposed new Historical Diving Society Museum at No 2 Battery, Stokes Bay [By webmaster: see third entry for 16 June 10]. 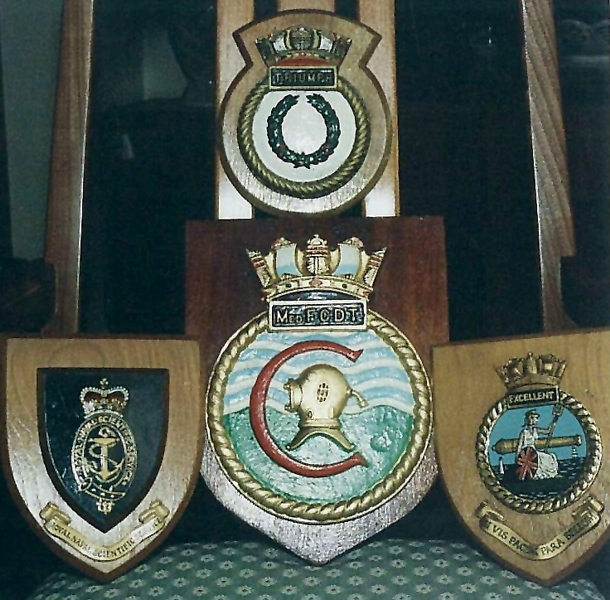 We should all be extremely grateful to MCDOA Honorary Treasurer Richard 'Soapy' Watson, currently SOO of the Fleet Diving Squadron (FDS), for his assistance in moving these artefacts and thus helping to preserve such significant pieces of RN diving heritage for posterity. Following on from my success at the recent SASB [By webmaster: Sea Appointments Selection Board], which you were kindly told about by Phil and Dave [By webmaster: fellow MCDOA members Phil Ireland and Dave Hunkin - see entry for 3 Jun 10], I can confirm that I'm pencilled in to be the next Commander MCM2, taking over from John Craig in May next year. Mark Atkinson (another MCDOA member - currently SO1 MCD in Fleet HQ) will be my relief. I've still got a few months to go up in town and there is lots of work going on to make the obvious case for the RN as the Strategic Defence and Security Review (SDSR) takes shape. It is a fascinating time to be in the MOD, but a real challenge as we deal with the current planning round and the financial constraints therein, the SDSR and the forthcoming Comprehensive Spending Review all being done whilst we are committed to operations. How the RN will look at the end of it all is anyone's guess at the moment. 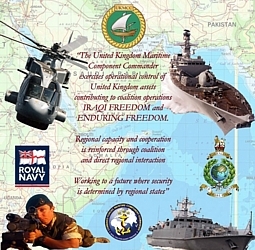 But, the maritime case is strong and MCM, a specialist area in which we enjoy a world leading reputation created in part by the hard work and sacrifices of many MCDOA members, will continue to play a key role in enabling maritime operations in the future. Many congratulations to Martin on his well-deserved appointment and I'm sure we all wish him the best of luck in the forthcoming SDSR battle. He also tells me that he is getting his head wet today (diver refresher training) at Horsea Island with fellow MCDOA members Kev Giles, John Herriman (RNR) and Angus Benton plus Nick Gwatkin (isn't it time you joined the Association too, Nick?). I am grateful to Sub Lt Ed Marsh RN of HMS Walney for informing me that MCM 1 Crew 2 took over the ship on 21 June 2010 under the Command of Lt Cdr Angus Essenhigh RN. 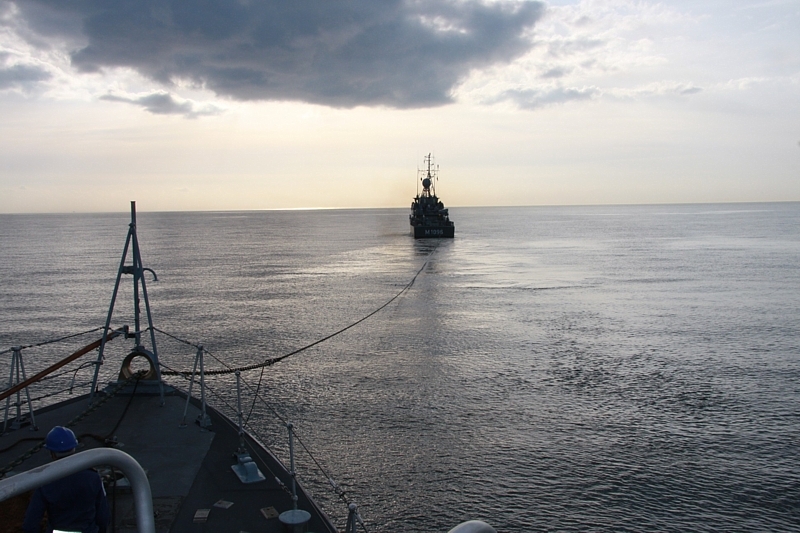 HMS Walney completed a six-month deployment with Standing NATO MCM Group 1 (SNMCMG1) earlier this month. 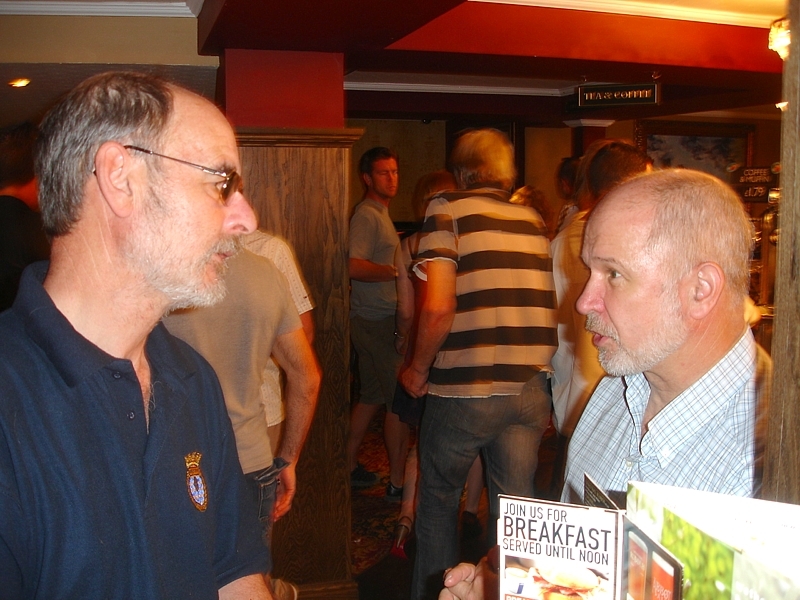 Last night's Minewarfare Association (MWA) Southern Area monthly dit session, held at The Crown in Fareham, proved an unusually lively affair. Apart from your humble webmaster, attendees included fellow MCDOA member Bill Kerr plus Bagsy Baker, Barney Barnett (who was given a 30 min extension of leave by his wife), Tony 'Fred' Bassett, Taff Davies, Dixie Dean, John Gunter, Wayne 'Pony' Moore, Taff Reader and Wishy Wishart (who travelled all the way from Scotland to be there). 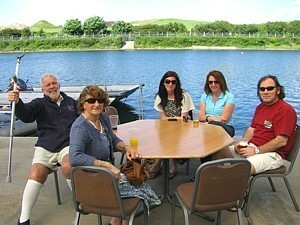 Left: The gang minus Wishy Wishart who took the photo. Right: All the gang together (Pony's obviously been polishing his halo). 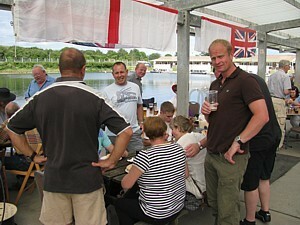 PO(MW) Steve 'Stirling' Moss was also in the pub with members of his Leading Rates Leadership Course (LRLC) in tow. I had a chat and snapped this photo of him with LS(D) Darren 'Daz' Carvell late of HMS Middleton, one of the students who has just completed the course at HMS Collingwood. Dixie Dean will be publishing more photos on the MWA website. 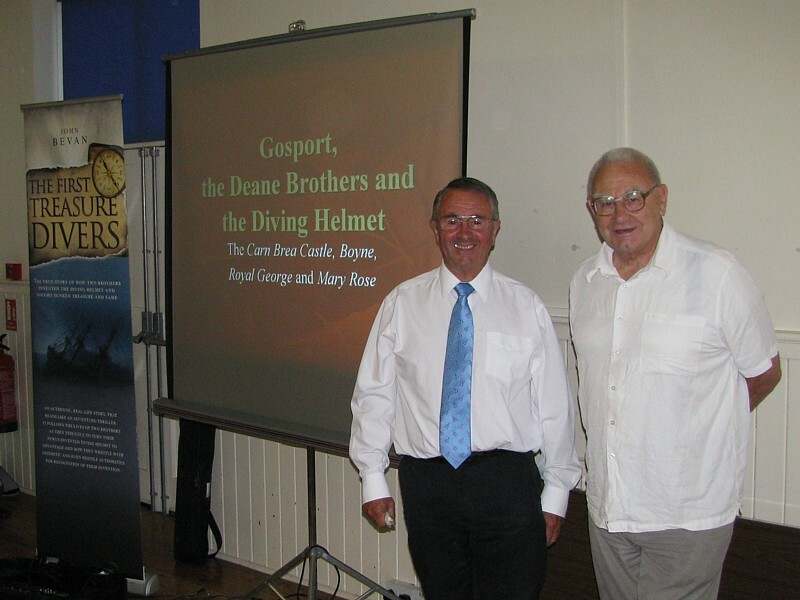 MCDOA associate member Dr John Bevan gave a splendid talk at Lee-on-the-Solent last night about the Deane brothers (John and Charles) who adapted August Siebe's smoke mask and used it as the first effective surface-supplied diving helmet. 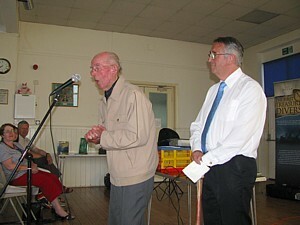 He was introduced by MCDOA honorary life member 'Uncle Bill' Filer MBE GM, now in his 93rd year. 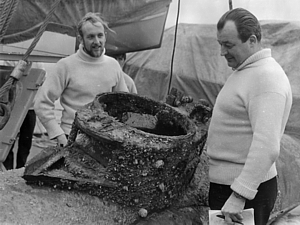 Bill ran the RN Physiological Laboratory (RNPL) at Alverstoke where John achieved a world deep diving record by reaching a simulated depth of 1,500 feet of seawater (457 metres of seawater) in March 1970 (see entry for 8 Jun 10). 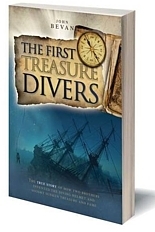 John explained the Deane brothers' local connections and took the opportunity to publicise his new book, 'The First Treasure Divers', which relates the story of their pioneering diving achievements. John also touched upon the inception of military diving by Colonel Pasley of the Royal Engineers and enlarged on plans for the country's first museum dedicated to diving, both civilian and military (see third entry for 16 Jun 10). 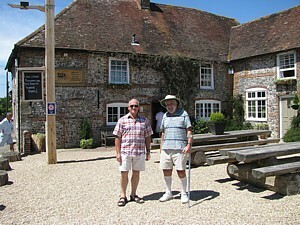 He was ably assisted by John Towse who relieved Bill Filer at RNPL. As a member of Southsea BSAC, John Towse was also heavily involved in the relocation and recovery of the Mary Rose. There was a packed audience and I was delighted to see ex-CPO(D) Clive Egginton who has recently returned from Honduras. He shared digs with John during the 1970s. 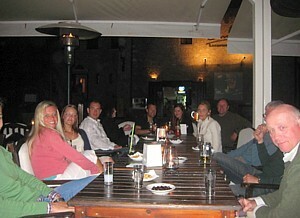 Afterwards, several of us adjourned to 'The Bun Penny' to continue what was a highly informative and enjoyable evening. 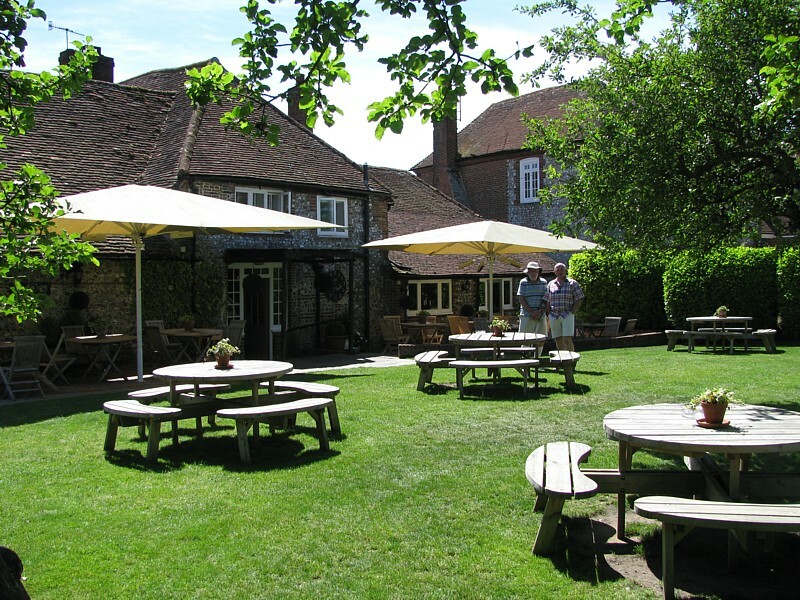 Continuing the MCDOA website's occasional Good Pub Guide, our 'Not Quite the Last of the Summer Wine' trio of Barlow, Holloway and Hoole visited The Fox Goes Free at Charlton near Goodwood in West Sussex today. 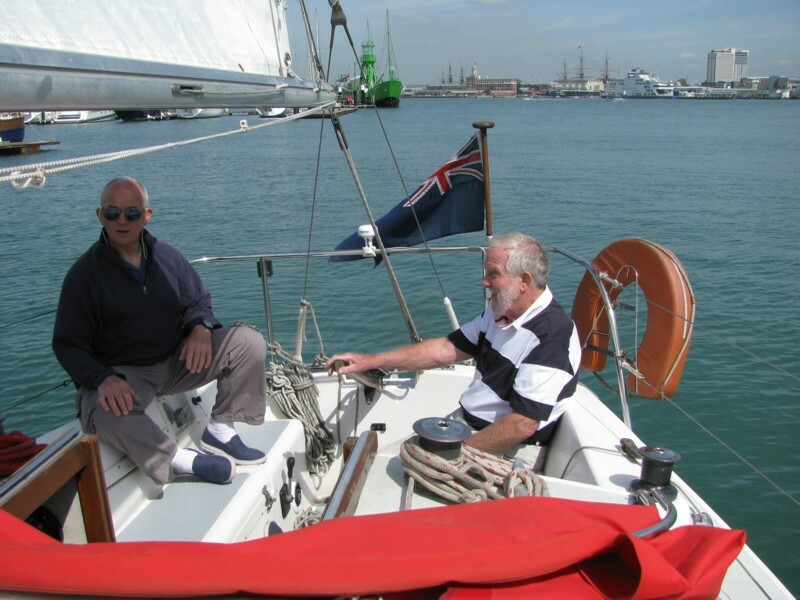 We would normally have taken advantage of the glorious weather by having a sail in Barlow's yacht 'Dougout' but he is still 'running in' his recently replaced knee. We therefore thought it wiser to engage in a country pursuit instead. In our case, it's the pursuit of the perfect pint of beer! 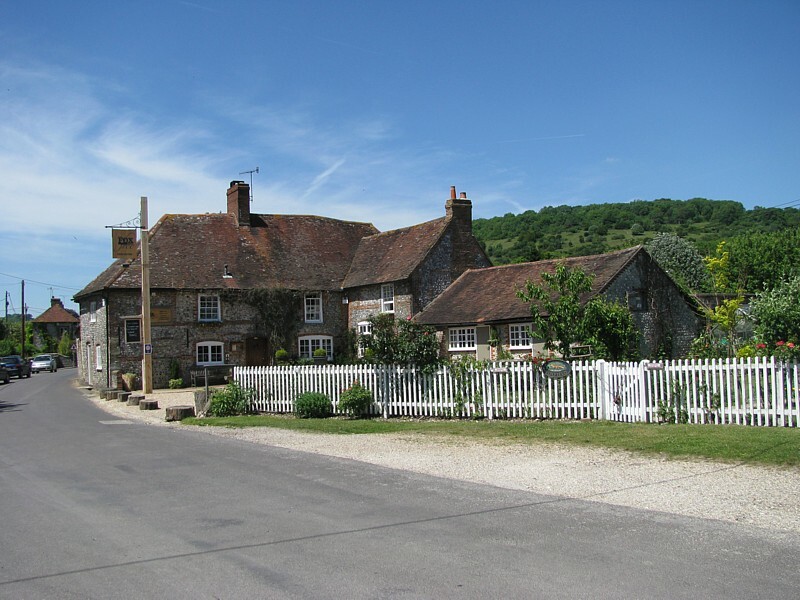 Holloway did the driving, relying on his satnav to guide us along winding lanes through the spectacular scenery of the South Downs. 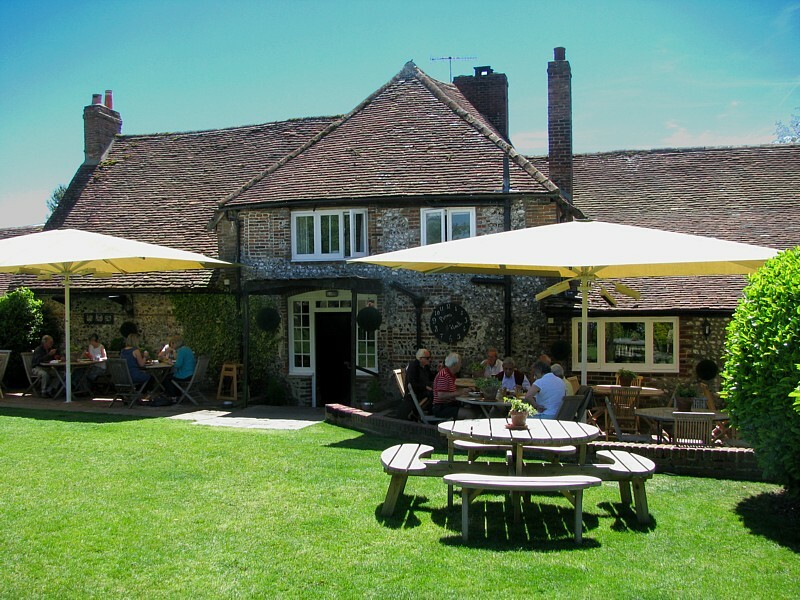 We had never visited this pub before and were impressed from the start. It looked idyllic and a large area adjacent to the pub provided ample parking. 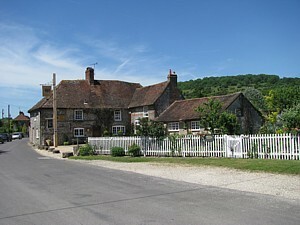 Left: 'The Fox Goes Free' in its beautiful setting. Right: Holloway and Barlow pose for the traditional 'been there' piccie. 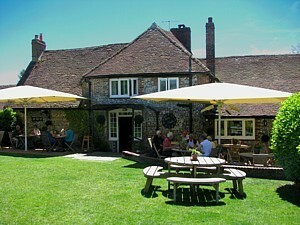 The interior of the pub is spacious, well-appointed and welcoming with a wide range of cider, lagers and ales on tap. However, we couldn't resist sitting in the large, pleasantly landscaped beer garden at the rear. The standard of maintenance, cleanliness and attention to detail was impressive; I haven't seen so many potted plants on tables since I was on the bridge of the QM2! 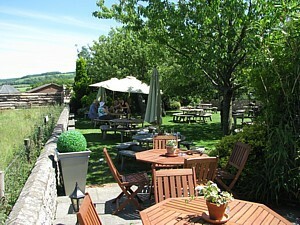 From here, we were able to enjoy the fabulous rolling backdrop of the South Downs in all their sunlit glory. Barlow got the first round in and, having taken our pints to our table, the usual courteous discussions ensued. Left: Barlow threatens Holloway with a deadly Thai Fu 'fork hand' strike during a disagreement. Right: Things calm down after Barlow moves around the table and looks suitably contrite. Holloway and I chose the Grilled Brie and Tomato Baguette from the imaginative and reasonably priced bar menu while Barlow opted for the King Prawns in Garlic Butter. Our meals arrived promptly and were served with crisps and a rocket salad garnish. Holloway and I enjoyed our well-filled and tasty crusty rolls immensely but Barlow found his king prawns were not quite what he had expected. However, they looked delicious. As usual, everyone left the pub before us. I hope it's not something we say or do. The brilliant sunshine may have affected my vision but not my taste buds. I could find no fault at all with 'The Fox Goes Free' and would recommend it to anyone. I therefore award it an unprecedented five diving helmets (or mines) out of five. The Regiments have confirmed details of the Open Day on Saturday 3rd July at Carver Barracks [By webmaster: Home of 33 Engineer Regiment (EOD)]. It runs from 10:00 - 16:00 (there is no evening do on account of the footy). Entrance is £2 (to cover the cost of the programme). 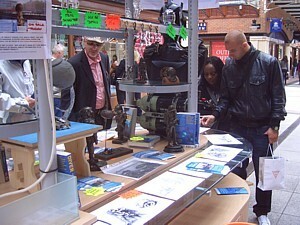 The plan is to cover costs, but any profit will go to the PRIs and Regt Charity. 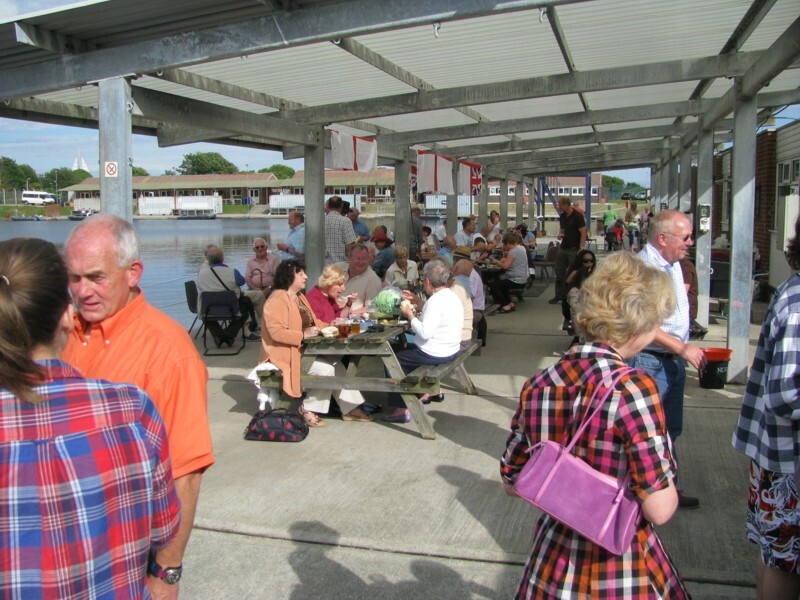 There will be a beer tent, "try your hand" type military stalls, military & local charity stalls and an arena with displays and competitions (including a MGOB building competition). Car parking will be on the airfield (through a separate gate, not the main entrance) and the Regts hope that the old & bold will attend as well as the local civilian population. I do hope to see some of you there. Thought I’d send you a little news. For those that saw my last photo of MY Mirgab V in St Tropez, I have attached a replacement – MY Mirgab VI (The Naming Committee spent months working that out – honest, they did). Terrible job, I know, but someone has to do it. MY Mirgab V went to the US at the end of the last Med season (Boss said “we’d never go to the US”) to attend the Fort Lauderdale International Boat Show (FLIBS). Well, despite lots of interest she didn’t sell, so the Boss decided to bring some friends and cruise the Bahamas. I liked that plan as I’d never been there. So having hired some short-term crew we spend two weeks cruising in 3.2m of crystal clear water – problem was my draught was 2.4m – so it concentrated the mind somewhat. We returned to West Palm Beach in Florida to do some maintenance and await more interest from buyers. I was looking forward to Christmas leave, but the Boss decided that a Caribbean cruise was in order (Boss had said that “we’d never cruise in the winter”). So having cancelled Christmas flights and bought an extra large present for 'She Who Must Be Obeyed', we planned the 1,500 nm trip and proceeded to Grand Bahamas to fix an outstanding mechanical problem and then directly to the US Virgin Islands. The weather was horrendous with seas up to 5m. The three-week cruise around the US Virgin Islands, British Virgin Islands, St Barts and St Marteen went without mishaps and the weather was glorious. In mid Jan, whilst we were in St Marteen, the Boss decided that I should move to the new yacht and prepare her for the summer season. So I handed MY Mirgab V over to Captain David Cherrington and flew to Monnickendam in Holland where the ice was 16cm thick and the temp -12C. Brass monkey weather indeed. 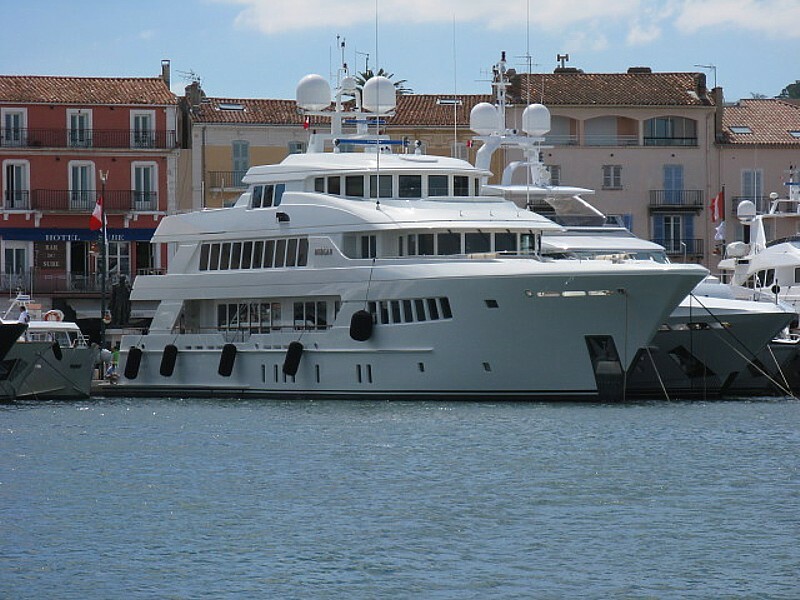 The builder, Hakvoort, is a well known builder of custom yachts up to 50m in length. The previous Engineer from Mirgab V had been standing by Mirgab VI since Nov 09 so my first task was catch up with where we were and to hire new crew and sort out owner supplied items and get the yacht fitted out with everything that did not involve the owner – a huge list and a large amount of money, and then solve the perennial problem of where to stow it (Designers and Owners never provide enough space (according to Captains)). As is the norm with most yachts the stated delivery date came and went with us still in the yard. Not that we could get out anyway as the ice refused to melt, but we finally launched in early March. In the meantime, MY Mirgab V participated in the Miami International Boat Show (MIBS) and was sold. When most things had been completed, Mirgab VI moved to Amsterdam for final fit-out during April and May. 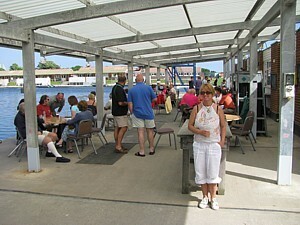 The yacht was purchased on 7 May and I assumed Command. We moved to Ijmuiden on 11 May to conduct sea training for the new crew – it was just like doing a work-up but without the warfare stuff or a FOST staff. 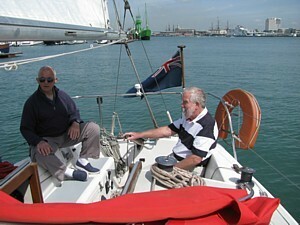 On 17 May we departed from Holland and sailed to Cannes via a fuel stop in good old Gib. Not even time for a postcard or haircut run. 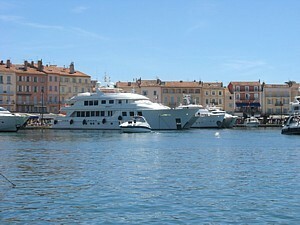 We arrived in Cannes on 28 May. 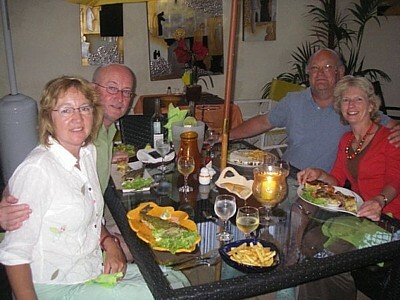 More work was done by the team from Hakvoort and we received our first guests in June. We will be cruising the Med for the summer. 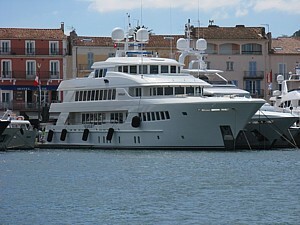 For those that like statistics, MY Mirgab VI is 48.9m long, 9.1m beam, 2.9m draught, 585 tons displacement, 686 gross tons. She has 11 crew and can take 16 guests. She is privately registered although she is built to LY2 rules (with some exceptions) and she is Lloyds Class. She has a maximum speed of 13.5 kts and a range of 4,200 nm at 12 kts. Clive, had I known you were getting shot of the old yacht, I might have asked for first refusal. I have been sorting out some diving pictures and thought you might like to see some of them. 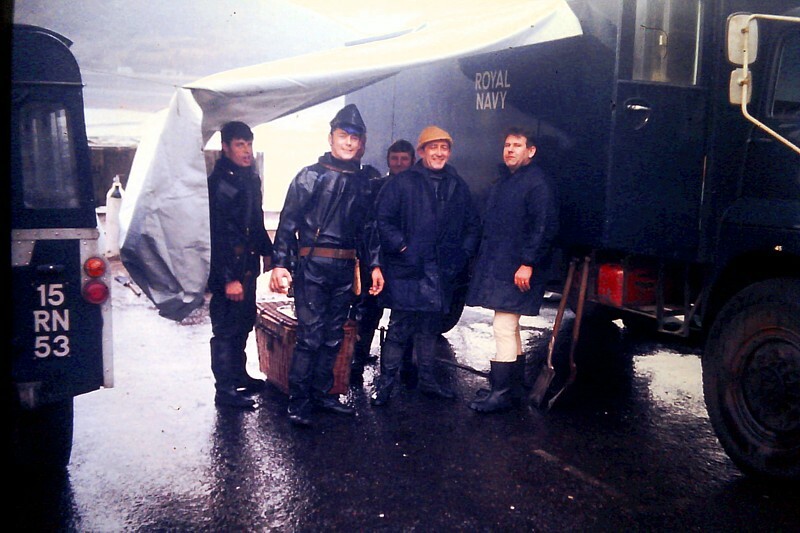 This is when Lt Cdr Ed Thompson and CPO(D) Ted Rose led the Plymouth Deep Diving Team by air up to Fort William for a 90 metre work up in January 1971. Thanks Clive. Lovely weather. It makes you want to join up all over again, doesn't it? Today's Portsmouth News contains this article describing the completion of CD course by AB(D) Darren Marshall. 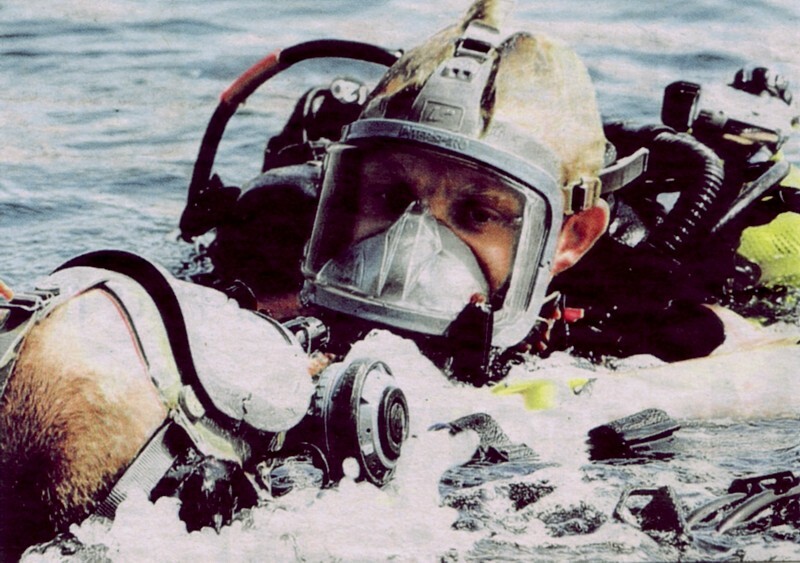 The article also features MCDOA member Tom Russell, CO of the Defence Diving School (DDS). The Navy News website contains this article describing the replacement of HMS Walney (MCM 1 Crew 1), sadly due for premature disposal this year, by HMS Penzance (MCM 1 Crew 6) as a member of Standing NATO MCM Group 1 (SNMCMG1). 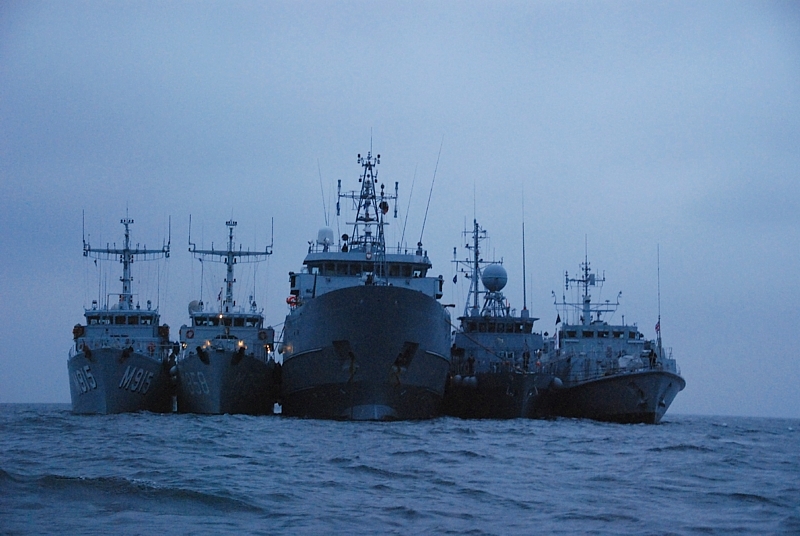 The change-over took place in the Polish port of Gdynia in the Baltic. Just to say HI! Seems ages since we spoke and we have now returned from our trip to join Simon and Jeanette Nicholson travel on the Rhone to the Med - pic attached. So sorry to have missed the Zodions!! Speak soon. HMS Middleton is currently serving as one of the four Operation Telic Mine Countermeasures Vessels, safeguarding the maritime seaways within the Arabian Gulf, training with naval units from regional and coalition nations and conducting warm water training. On the 26th June 2010, in order to celebrate Armed Forces Day, HMS Middleton has set the CHOKE POINT CHALLENGE. 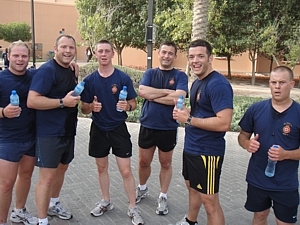 In the quickest time possible, MCM 2 Crew 4 aims to run, cycle and row the 350nm distance of the Choke Points that HMS Middleton has sailed from Portsmouth to Bahrain. This includes the Strait of Gibraltar, Suez Canal, Bab el Mandeb and the Strait of Hormuz. HMS Middleton sailed from Portsmouth in February conducting the first Operation Telic Hunt Class passage to the Middle East as an individual unit. HMS Middleton will remain based in Bahrain for the next three years although MCM2 Crew 4 will be replaced by Crew 7 later this year when Crew 4 returns to Portsmouth to take over HMS Hurworth. 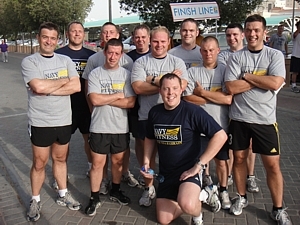 "With over 30 competitors signed up across all ranks/rates and branches it promises to raise funds to support the RN’s number one charity, the RNRMC, and be the source of much interdepartmental banter over the next coming weeks and months! If anyone would be so kind as to sponsor us any amount it would be greatly appreciated. Even the equivalent of a pint of ale (£2.80?!) 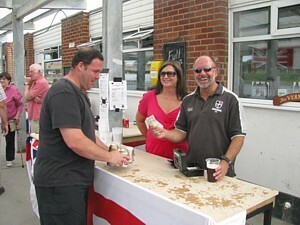 or Gin and Tonic (£3.50?!) would help make a difference so be proud of your forces and support the Mighty Midd’s Choke Point Challenge!" 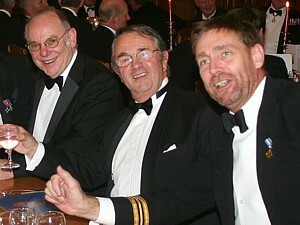 The Northern MCDOA Dinner for 2011 is announced. Traditionally held on the Friday closest to the birthday of the MCD Branch, next year’s Dinner coincides exactly with that date: 25th February. 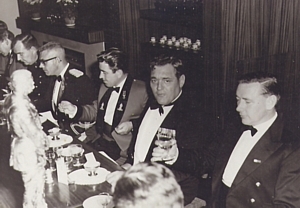 This year’s postponed and ultimately cancelled Dinner had been attributed as one of the 12 available ‘Mess Functions’ attracting contractor support and thus much reduced costs; it is hoped that the 2011 Dinner will be likewise attributed and this will be taken forward by CO NDG, Lt Cdr Jason White QGM at the next Mess Committee meeting. Meanwhile, the Dinner is booked for 25 Feb 11, whatever the outcome of the committee deliberations, and all members up North should plan their diaries accordingly. Lt Cdr Bob Hawkins MBE is reprising his role as the event organiser, ably supported by Lt Cdr Matt Offord, Jason (and his relief – Lt Cdr Kev Stockton), and other local worthies. Attendance proforma etc. 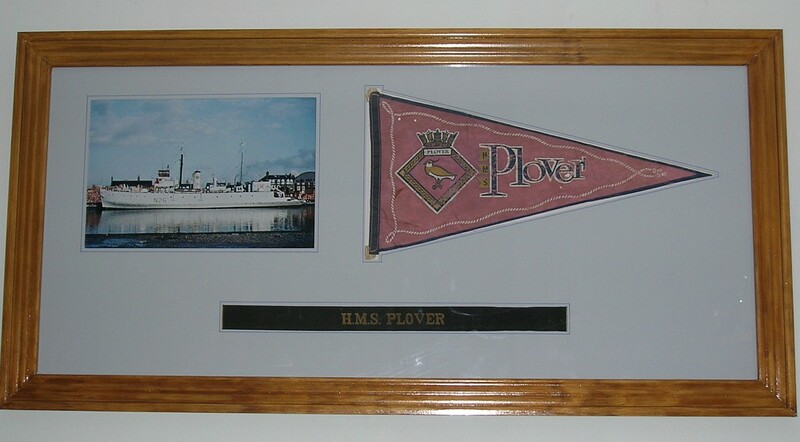 will be forthcoming, however, should anyone wish to register their interest now, or to seek more details, they can contact Bob at: FLEETFASFLOT-PBSCO@mod.uk; 01436 674321 x 4209, or on his private mobile: 07796 390725. Watch the 'Forthcoming Events' page for updates. ZOO becomes a Navy diver! The RN website contains this article providing a flavour of a double-page spread about the CD Branch in the lads' mag, ZOO. The whole article can be read here. The Portsmouth News contains this article describing the establishment of a diving museum in No 2 Battery at Stokes Bay to the west of Portsmouth in Hampshire. 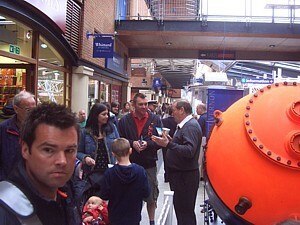 The museum will be run by the Historical Diving Society (HDS) of which I am a member. 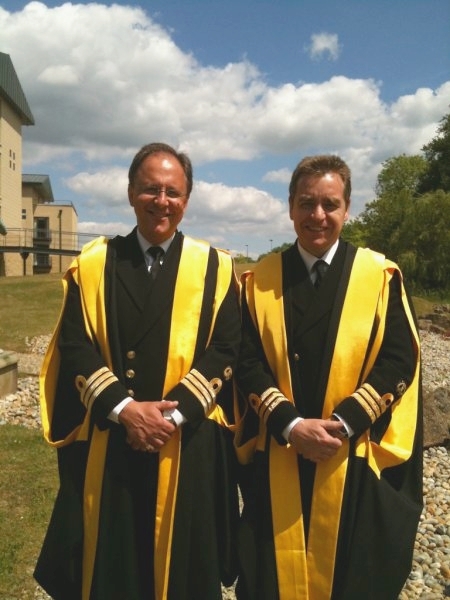 The President of the HDS is diving medicine specialist Vice Admiral Sir John Rawlins KBE, FRCP, FRAeS, an honorary member of the Association of RN First Class Divers (AORNFCD), and its Chairman is Dr John Bevan, an associate member of the MCDOA. 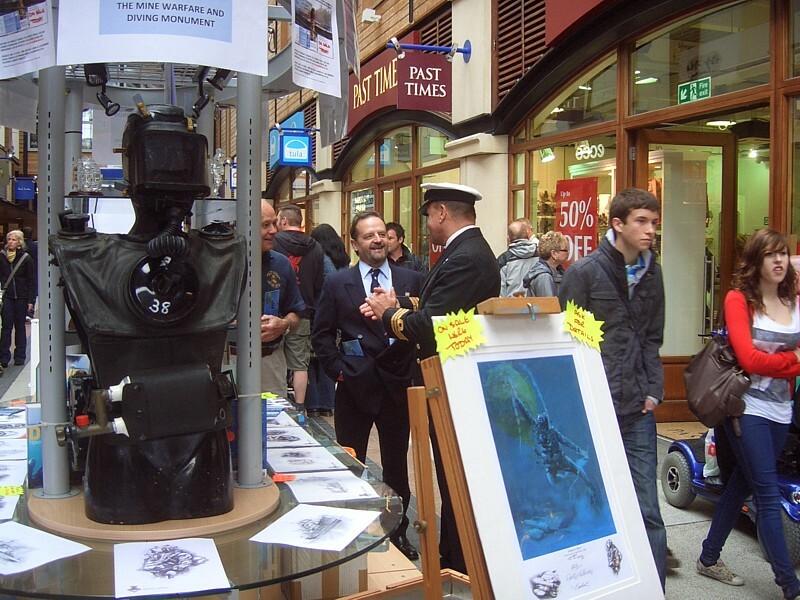 I have been campaigning for a Naval diving museum for some time and will investigate the possibility of collaborating for our mutual benefit. 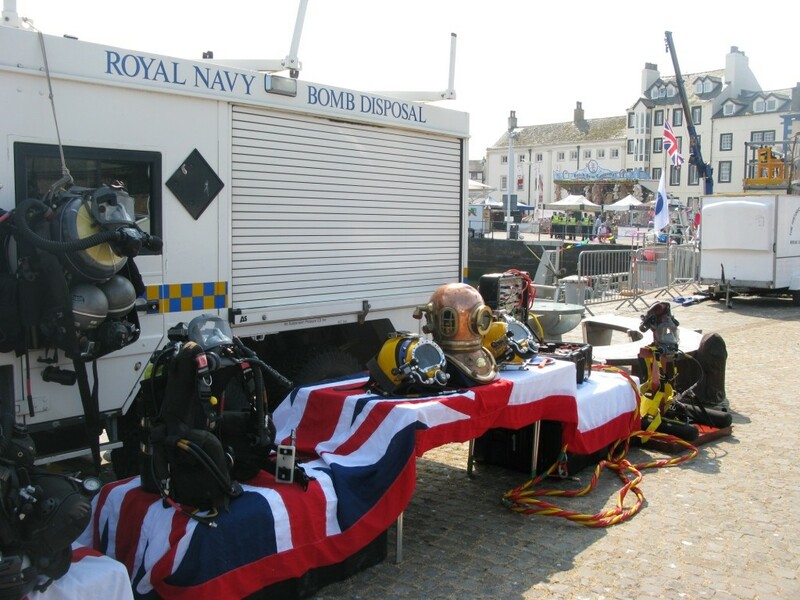 I had to smile at the headline for this article on the Hoylake Junction website describing an EOD task in Liverpool Bay on 30 May 2010, presumably performed by Plymouth-based Southern Diving Unit 1 (SDU1). The BBC website published this article about the same incident. It has been quite a weekend for Minewarfare and Diving Branch reunions and, once again, we were lucky to be blessed with fine weather. 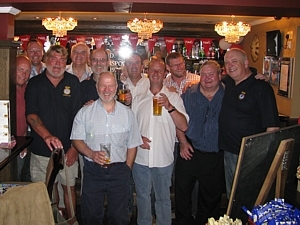 I didn't attend the Association of RN First Class Divers (AORNFCD) AGM and subsequent 'Boys Night' on Friday but AORNFCD Secretary Troy Tempest has posted these photos on the RN CD website. 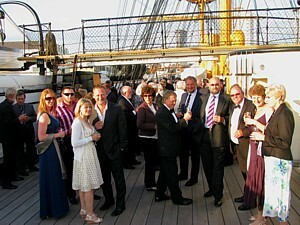 On Saturday, around 130 divers and their guests attended the dinner on board HMS Warrior and it was a great success, mainly thanks to the organisational skills of Troy Tempest and Tim Sizer. I took Mrs Webmaster along and she thoroughly enjoyed herself, even posing for this photo before we embarked. The evening started with Bucks Fizz on the upper deck before we moved below to the gundeck for a buffet dinner, raffle in aid of Project Vernon and dancing. 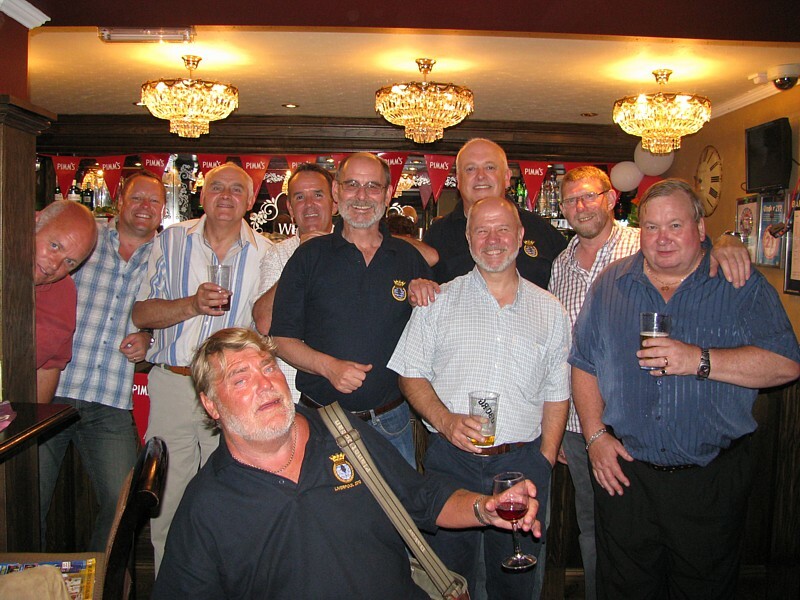 MCDOA members present included Mick Beale, John Bevan, John Grattan, Vice Chairman Rob Hoole, Chairman Paul Jones, Paul McDermott, Mike Stewart, Howard Trotter and our Honorary Treasurer, Richard 'Soapy' Watson. 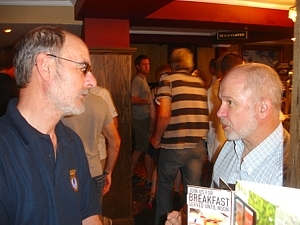 However, other illustrious attendees included Vic Anderton, Chris Bairstow, Cris Ballinger, Steve Bielby, Jimmy Bond, Donkey Bray (the younger), Alan Broadhurst, Albert Chapman, Chris Christie, John Cobb, Mo Crang, Mick Curtin, John Dadd, Paddy Doonan, Ian Fleming, Terry Gosling, Don 'Jimmy' Green, Gabby Haines, Mike Handford (who sold a ton of Project Vernon Summer Draw tickets), Mike Harding, Hughie Harrison, Mike Jackson, Chris Page, Phil Kearns, Colin 'Scouse' Kidman, Paul 'Dhobey' Lines, Derek 'Maggie' Lockwood, Joe Maher, Ron Maitland-Flanagan, Ted Mangion, WW II 'P' Party veteran Ray 'Brum' Maries, Mike 'Pincher' Marten, Bill McGovern, Dave McKenna, Iann Morrison, Harry Neave, Steven 'Peggy' Neil, Roy New, Mike O'Leary, Mike O'Meara, Mick Openshaw, Andy Owen, Ted Setchell, Les Sharpe, Stew 'George' Sissons, Tim Sizer, Jim 'Tommo' Thomson and Troy Tempest. I hope those I have left out will forgive me. I was too busy chatting to note everyone who attended or take more photos of the evening but Troy Tempest has published these pictures on the RN CD website. If anyone would like to contribute more, please e-mail them to me via my webmaster address. 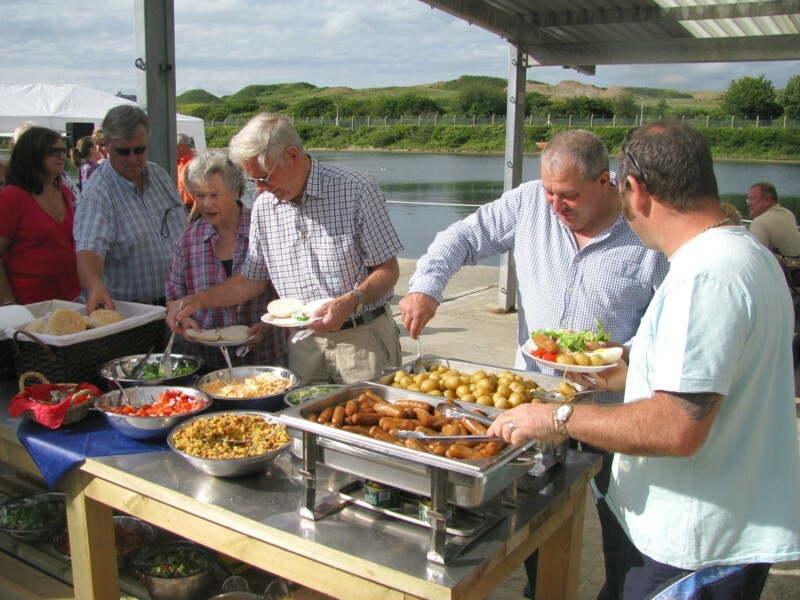 Sunday afternoon saw around 70 people of all ages attending the second combined associations (MCDOA, AORNFCD and MWA) barbecue at the Defence Diving School on Horsea Island, brilliantly organised by MCDOA Honorary Treasurer Soapy Watson. MCDOA Chairman Paul Jones, Hon Secretary Tony Griffiths and Mick Beale, plus their respective wives Yvonne, Debs and Vicky, threw themselves into setting up, 'manning' the bar, running events and clearing away afterwards and we owe them all a huge debt of gratitude. 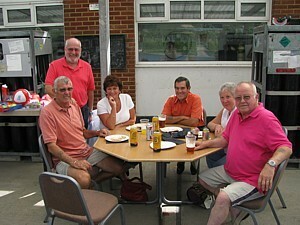 Other MCDOA members present included Doug Barlow, Stu Harper, Martyn Holloway, Rob Hoole, Mark Savage and Howard Trotter. 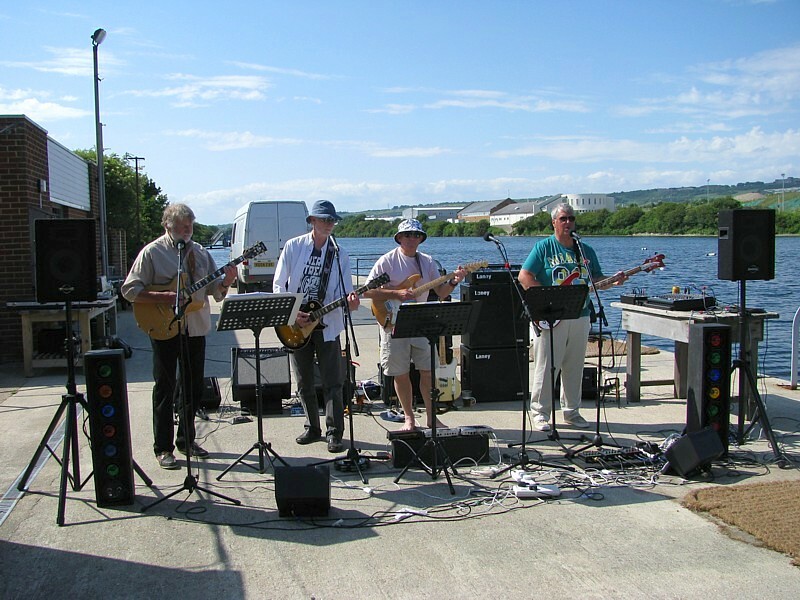 As last year, The Zodions, comprising MCDOA committee member Martyn Holloway and his old school friends, provided live music and we are grateful to them for opting to forego their gig at the Isle of Wight Festival in order to entertain us. 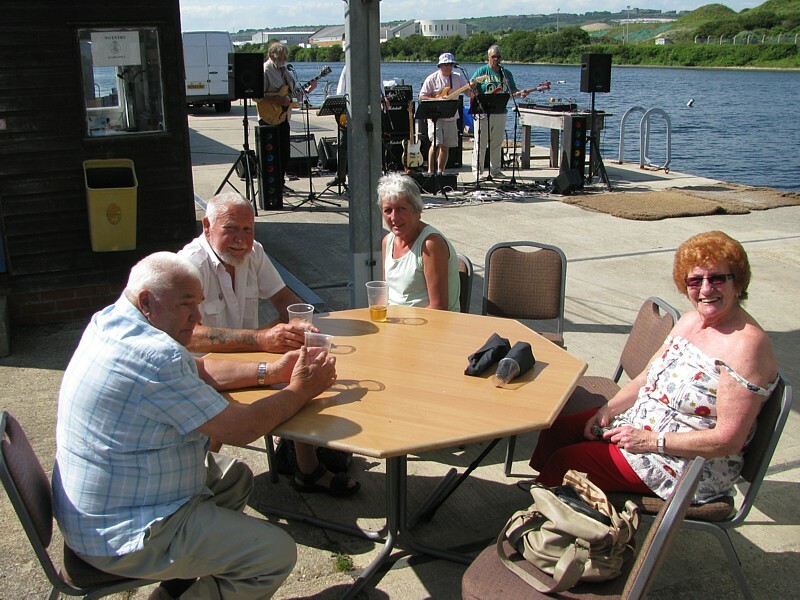 The weekend events raised several hundred pounds towards Project Vernon, the campaign to erect a statue in Gunwwharf Quays commemorating the minewarfare and diving heriitage of HMS Vernon which previously occupied the site. I am grateful to everyone who contributed in one way or another but wasn't it fun, too? I can't remember meeting Lt Cdr Stuart Honour MBE RN, universally known as 'Jazz', but I have learned enough to know that he was a deeply admired and much-loved member of the MCD fraternity. 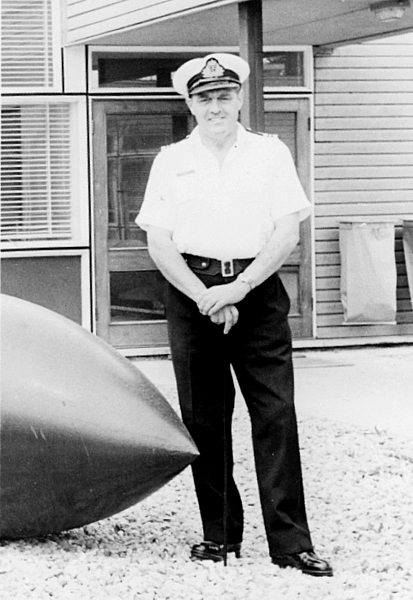 He was confirmed as a Commissioned Gunner (SD Sub Lt equivalent) on 5 March 1951, promoted to Lt on 1 Jan 1957, promoted to Lt Cdr on 1 April 1963 and placed on the Retired List on 3 July 1972. 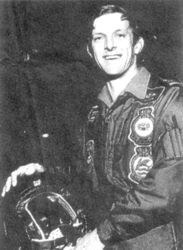 However, he continued to serve as a Retired Officer until his untimely death from cancer, induced during diving trials, on 13 June 1977. Some of his contemporaries and family members have passed me their memories of him and I have pieced together the following pen picture. Stuart did not wait to be told twice and set off aft. 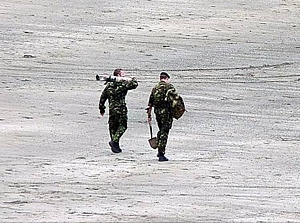 As he neared the Captain’s cabin, his way was barred by the Royal Marine Sergeant Keyboard Sentry. “Boy, where are you going?” asked the Sergeant. “Commander says to get him the Captain,” said Stuart. “I hope you are right,” said the Sergeant, and followed Stuart aft. His way was then blocked by the Captain's Chief Petty Officer Steward. "Boy, where do you think you are off to?” asked the Chief. “Commander says to fetch the Captain,” replied the Boy. “I hope you are right,” said the Chief Steward and tapped gently on the Captain’s cabin door before ushering Stuart into the Captain’s cabin. The Captain, who Stuart described as 'dear old Captain Sir Archibald someone or other', was having an after-lunch doze in his leather armchair. His shoes were slipped off and his jacket was undone. "Commander says to fetch you,” said Stuart bravely. “Oh,” said the Captain. “I hope you are right.” He did up his jacket, put on his shoes and told Stuart to lead the way. They set off forward, the Boy, the Captain, the Chief Steward, the Sergeant Sentry and probably a couple of others, maybe carrying buckets, who just wanted to see the fun. As Stuart said later, “It pays to get your facts right.”"
MCDOA member John Grattan has told me that Stuart was the star Gunnery Instructor (GI) at HMS Excellent, Whale Island when he was selected by the Captain of HMS Vernon 1946-48, Captain 'Jock' Hughes-Hallet (a feared man known as 'Hughes Hitler' or 'Heil Hitler' behind his back), to smarten up the parade ground performance of Vernon's officers. The CD branch very quickly seduced him away from the Gunnery branch which accounted for the quite awful GIs sent to Vernon thereafter! Thus Stuart always felt obliged and amused to get as many recruits into the Branch as possible, provided they were amiable hooligans. 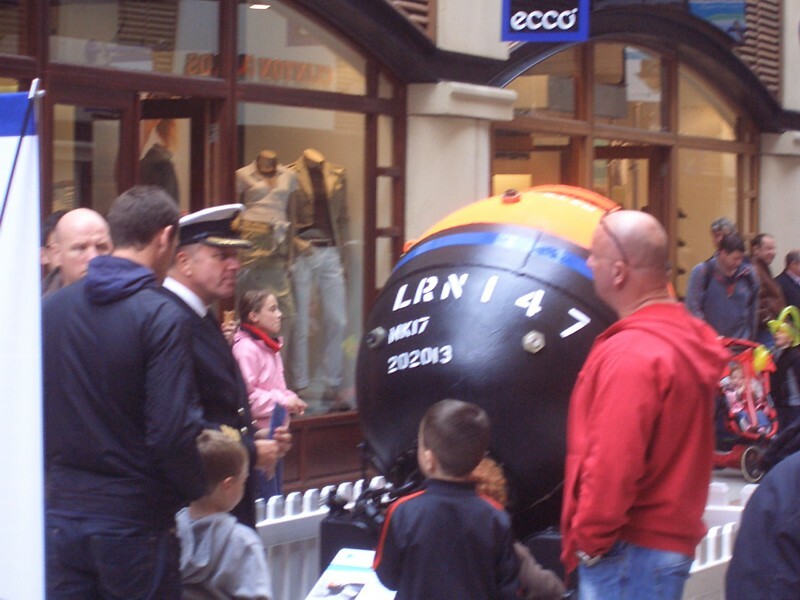 MCDOA member Mike Gillam first met Stuart in October 1954 when he was the Plymouth Command Bomb & Mine Disposal Officer at HMS Defiance, the Torpedo, Anti-Submarine and Diving school in the West Country. The school was situated in a straggle of war-built huts called Willcove Camp, perched high on a Cornish hillside just across the River Tamar from the Naval Base at Devonport. Up until that time, the school had been housed on board three old wooden hulks anchored just below the camp, one of which was HMS Defiance. The hulks had just been sold to the Paulsgrove Tin and Metal Company for some £12,000 and this had caused Stuart some distress. Although the hulls were made of wood, he told Mike that at least one of them had both a solid copper ring main and gunmetal torpedo tubes. Being a clearance diver, he well knew the current value of scrap metal - the company made a small fortune in very quick time. 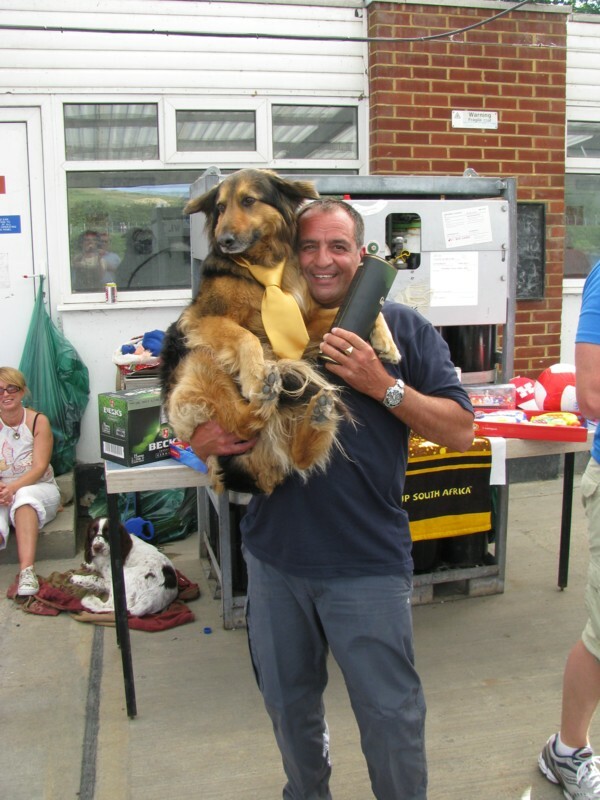 Stuart was responsible for dealing with all the unexploded explosive ordnance found underwater or below the high water mark (MHWS) from North Wales round the coast to somewhere between Portland and Plymouth. 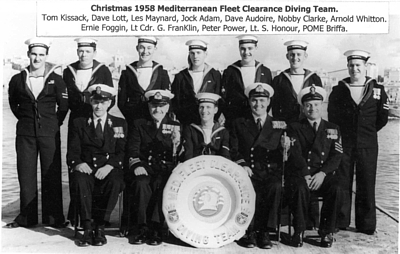 To help him, as Mike recalls, he had a Leading Seaman CD2 (Clearance diver 2nd Class) and a civilian driver; Mike does not remember him having a Petty Officer CD1 although he may well have done so. 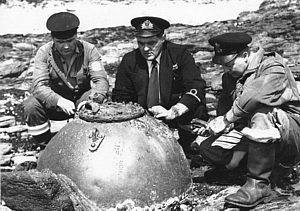 It was a busy time with many bombs and mines from both World Wars being trawled up or washed ashore throughout the year. The winter gales brought them up the beach and the summer visitors found them. Consequently, Stuart spent much time on the road dealing with the incidents as they arose. 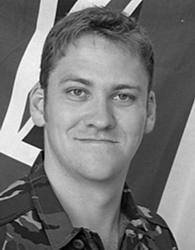 By the time Mike arrived, Stuart was living by himself in the wardroom mess, his wife and young family having returned to their home in Scotland. 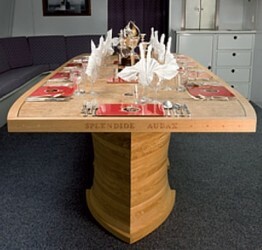 The wardroom mess with dining table and bar was situated in one of the brick built huts together with about four cabins separated from each other by some flimsy partitions. The hut also contained a bathroom with three jumbo size naval baths side by side and another room with some toilets of the thunder-box variety, there being no main drainage on site. The School’s commanding officer lived in solitary splendour in a house next to the camp, also without main drainage. There were only a few other officers on the staff who all lived out as did most of the ship’s company; the students on course were all accommodated in the naval barracks across the water and were shipped in daily. So it was all very quiet in the evenings and Mike reports that Stuart was delighted when he arrived to keep him company. 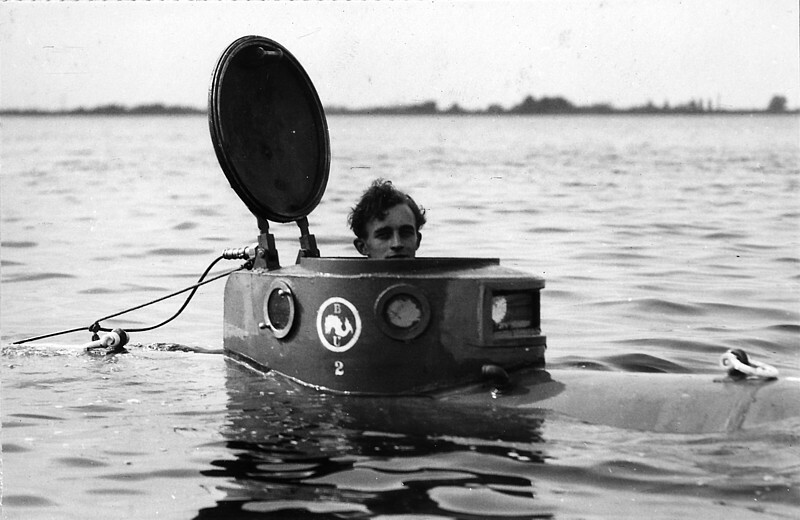 Mike had been appointed for three months to organise and run the first (and only, as far as he knows) NATO Clearance Diving Course. Willcove camp was a very strange place. The authorities wanted to close it down to save money but the Navy found it far too useful and used every means to keep it going. The camp’s allowance for repairs and domestic items such as cleaning gear, toilet paper and light bulbs had been stopped, and so a market garden had been started within the camp and the produce sold locally to raise the necessary finance to keep the school running. The garden was tended by the ship’s company under the direction of the school’s second-in-command, the Executive Officer. Mike says that Stuart was an easy man to like and they got on well right from the start. 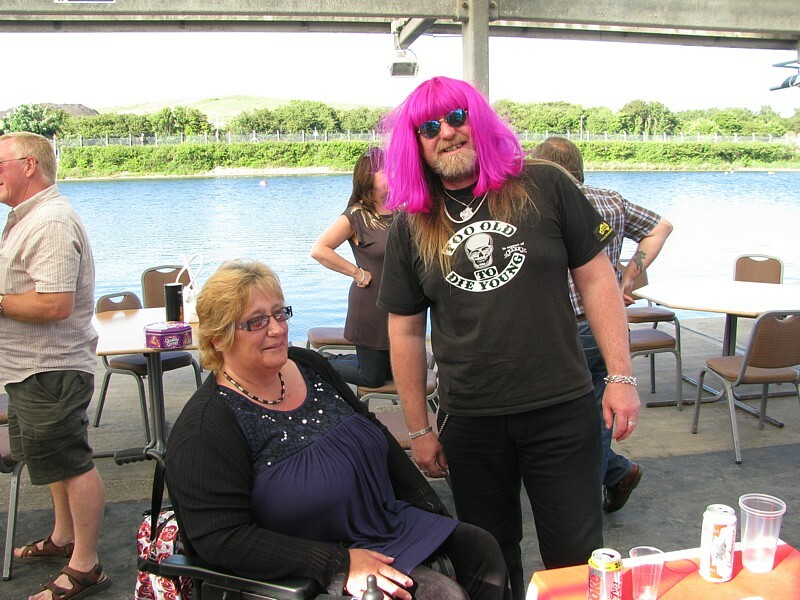 He was very sociable, great fun and loved a party. He was a big man – not in height but in width and in character. His very broad shoulders only just fitted into his underwater swim suit and he always needed a hand in putting it on. He had a big smile and a very loud laugh – his voice carried a long way – presumably the result of his time as a gunnery instructor on the parade ground of HMS Excellent, the naval gunnery school on Whale Island at Portsmouth. He was good-humoured and even tempered. Mike once asked him why he never drank brandy and ginger ale (known as a Horse's Neck), a very popular drink in the wardrooms of HM ships at that time. Stuart replied that it was because brandy made him aggressive but Mike cannot remember him ever being aggressive. On the contrary, in troubled times, he was always a calming influence. He was an efficient officer who enjoyed his work and took great pride in it. Mike believes that he was appointed an MBE in the 1959 New Year Honours list as a result of his successful tours of duty in B&MD. He told many stories of the various operations in which he had been involved; adventures like the time that he attended a buoyant mine that had been washed up in some West country cove. By the time it had been reported, some adventurous children had removed the top plate and thrown rocks at it so that the detonator placer had been crushed over the detonator. It was in a highly dangerous condition and so he countermined it in situ. Those children were lucky. On another occasion, a winter storm had revealed an old WWI buoyant mine half way up a sand cliff on a remote Welsh beach. He was removing some of the sand away from it to get a better view when it started to move. In a short space of time he found himself bounding down the cliff with the mine in hot pursuit. Mike accompanied Stuart on one of his regular trips to the Welsh coast to check on a number of ‘suspicious objects’ that had been found by the police. Most of them were not dangerous but Stuart usually blew them up to impress the locals and to demonstrate to them the importance of reporting everything of a suspicious nature. The press were always pleased to learn about such events to fill a few column inches and occasionally provide a dramatic photo. One such photo in the Western Morning News caused a different sort of explosion in the Commander-in-Chief’s office. A smiling Stuart was pictured close-by a large mine that he had opened to expose the explosive prior to steaming it out, a technique used on dangerous mines which would have caused damage if countermined in situ. The problem was that Stuart had a lighted cigarette in his mouth! During the trip when Mike accompanied him, they stopped for the night in a pub in a remote Welsh village. Stuart was spinning yarns to the locals in the public bar around a large open fire when his eyes fell upon an object on the shelf above the fire. 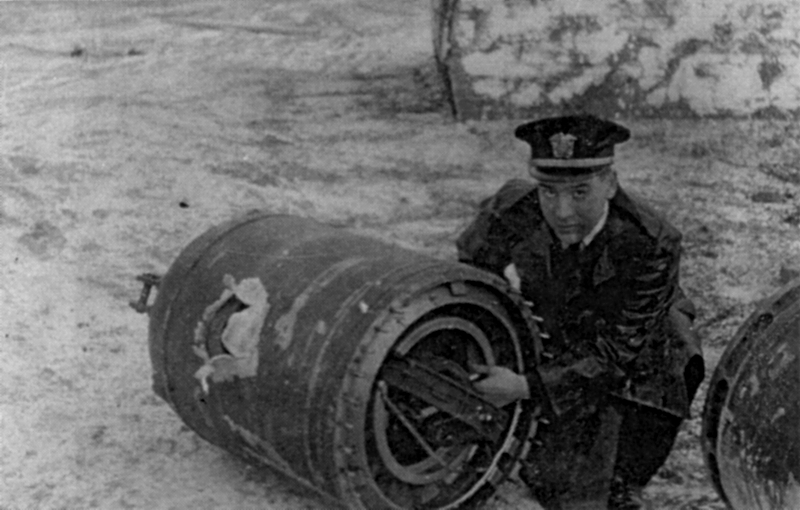 After being told by the landlord that it was a dud incendiary bomb from a war time air raid, Stuart pointed out that it was only the igniter that had failed, the incendiary material was contained in the bomb casing and still fully serviceable. The bar was cleared in an instant and the landlord was so grateful to Stuart for taking it away that it was drinks on the house. 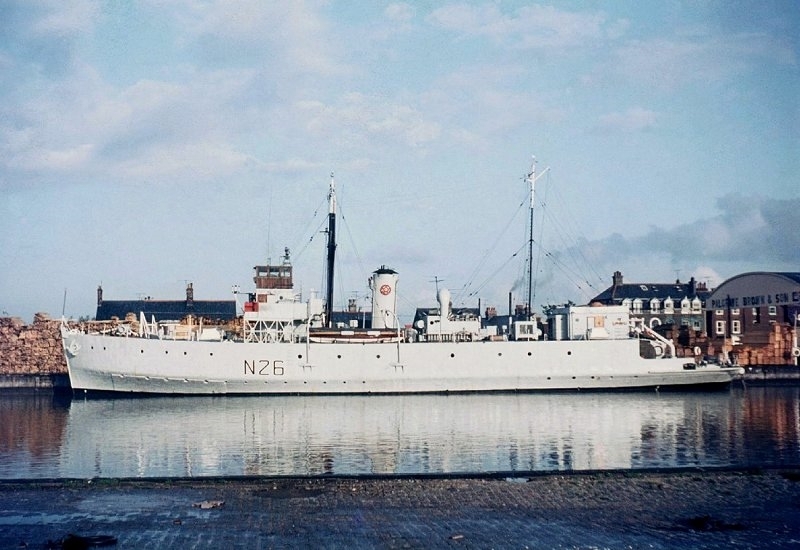 If Stuart was not away disposing of something explosive, the routine once the students had all been ferried back to Plymouth for the night was for him and Mike to retire for tea to the Wardroom Mess and watch children’s hour on TV. 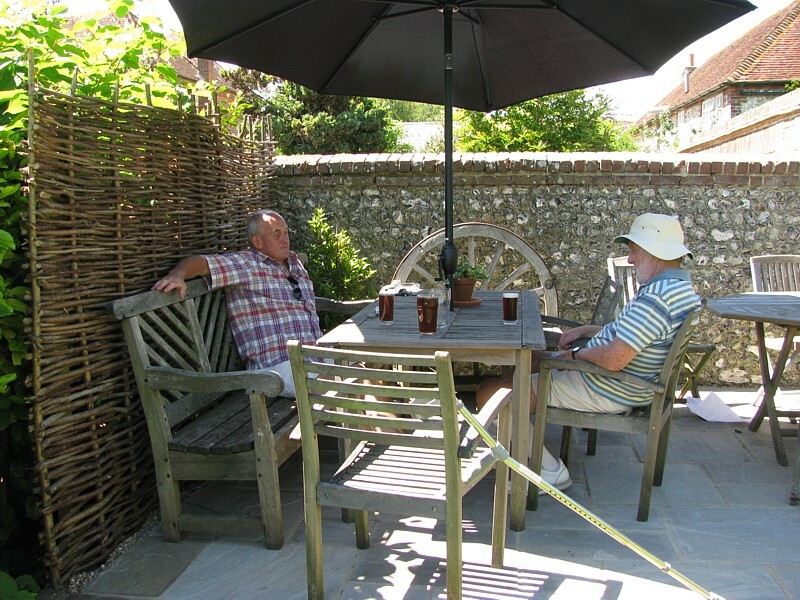 The bar was then opened for a glass of the standard Defiance tipple of vintage cider and gin in time to watch the news at 6.00 pm. TV was still in its infancy at this time and the one programme available would then close down for some three quarters of an hour. So they would replenish their glasses and repair to the bathroom for a long luxurious bath and a chat about their plans for the evening. Almost inevitably, this would be what in naval parlance was called a run ashore, meaning an evening on the town where they would meet up with chums in the officers club or one of the more public hostelries in Devonport. This was planned in advance as Stuart was permanently on call and had to leave his whereabouts with the naval telephone exchange. Oh for a life on the rolling sea." He was a great romantic. 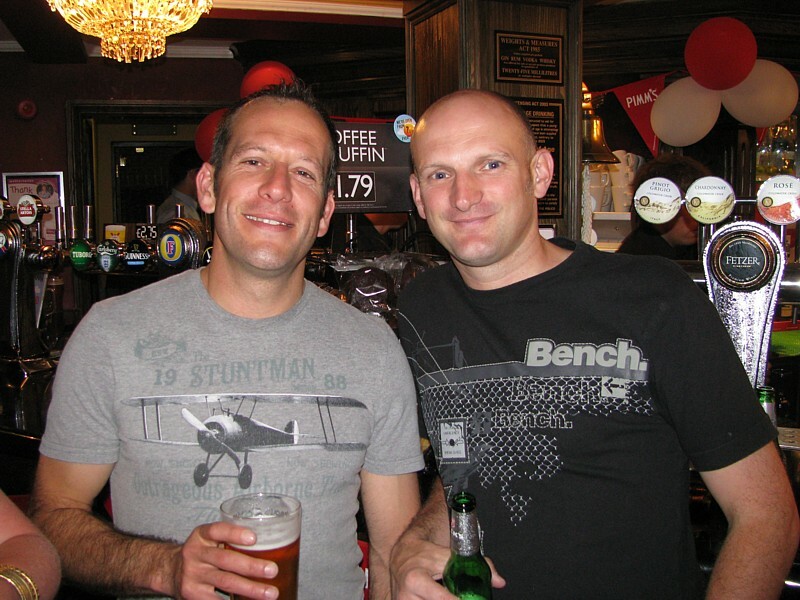 Mike says this was the only occasion he and Stuart served together but they met up from time to time in succeeding years and remained good friends. 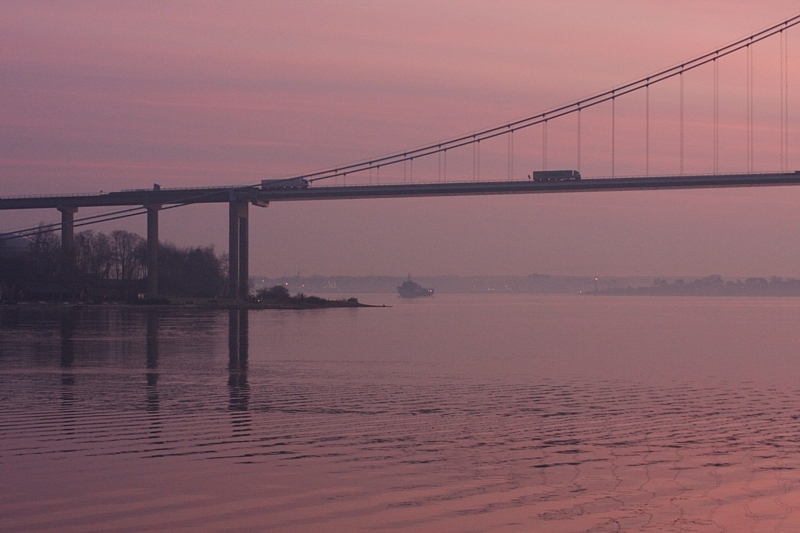 His last memory of him in the service was at Port Edgar on the Firth of Forth, the legacy minesweeping base from WWII. 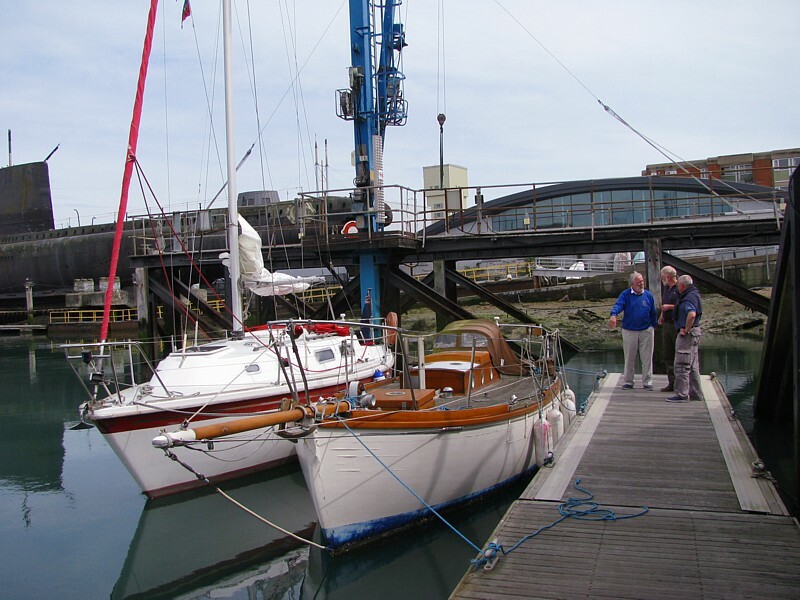 Mike was trying to bring HMS Reclaim safely alongside against wind and tide – she only had a single screw and Stuart was there on the jetty to welcome the ship. 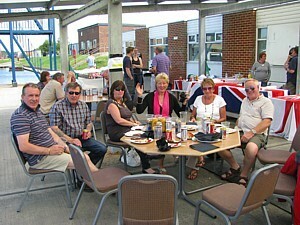 All went well and it was another great party. 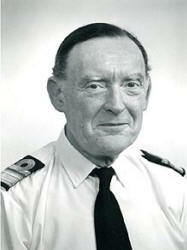 During the Suez crisis in late 1956, John Grattan was serving in the fast minelayer, HMS Manxman. He remembers the Mediterranean Fleet Clearance Diving Team arriving at Port Said with MCDOA member Phil White (now Philip Balink-White) as the OIC and Stuart Honour as the 2i/c. 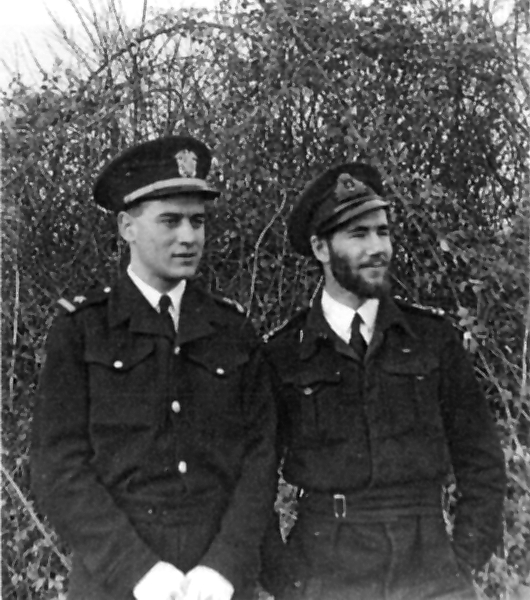 Although the team was tasked to deal with unexploded ordnance and wrecked block ships, when John Grattan met Stuart ashore, he had been hijacked by the Chief Pilot of the Suez Canal Company to be his personal bodyguard and was armed with a sten gun. According to John, it amused Stuart enormously when a terrorist threw a grenade at their jeep but it bounced back off the front tyre and exploded in his face! That was the end of that but the next incident left Stuart with disturbed memories. They entered some large room and Stuart had an extraordinary uneasy feeling, looked towards long drawn curtains and just knew someone was behind them. He opened fire and virtually cut an armed man in two. Some months later, Stuart shared John Grattan's cabin and demonstrated his great kindness and consideration. John admits to having been going through a very low patch after a spinal injury had made him unfit for Naval flying, his ambition ever since abandoning the idea of being a 'red indian' at the age of six. They were in Cyprus together when Stuart told him to buck up and accompany him for a dip. This they did and John's eyes were opened to a new and wonderful world of diving. On a visit to Tunis, Stuart again shared John Grattan's cabin and was horrified to wake one afternoon, after a very good run ashore the night before, to find his socks being removed by brown arms through the scuttle from his own half asleep feet. 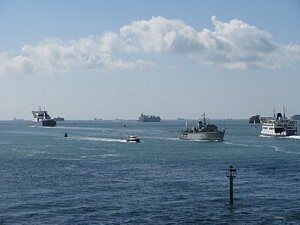 The ship had embarked a famous regiment for the guard of honour at the War Memorial Service scheduled at Medjez-el-Bab. The battalion doctor had ordered that anyone who had engaged in sexual activity ashore must put his name into a little box at the top of the brow when he came back on board. This was too much for 'Jack' to resist - Stuart's and John's names were in the box 34 times! 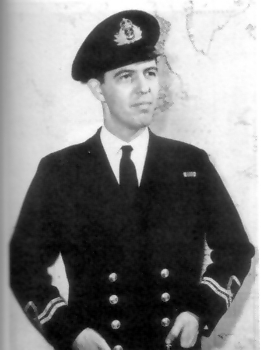 In mid-1960, Stuart became John's First Lieutenant (relieving another great character 'Aussie' Len Graham) when he was driving HMS Dingley and the Home Station CD Team. They had the most fantastic experiences at both work and play but one of the real highlights was their trip to Copenhagen, accompanied by their wives. John says that all four of them were present when Stuart caught the falling but naked Miss Australia upside-down in the 'Atlantic Palace' and beat hell out of the Tivoli gardens. John and Stuart saw a lot of each other over the next few years including another great trip to Copenhagen when John commanded HMS Reclaim. US Navy diving officer Jim Bladh, an MCDOA member, was also present at the time. 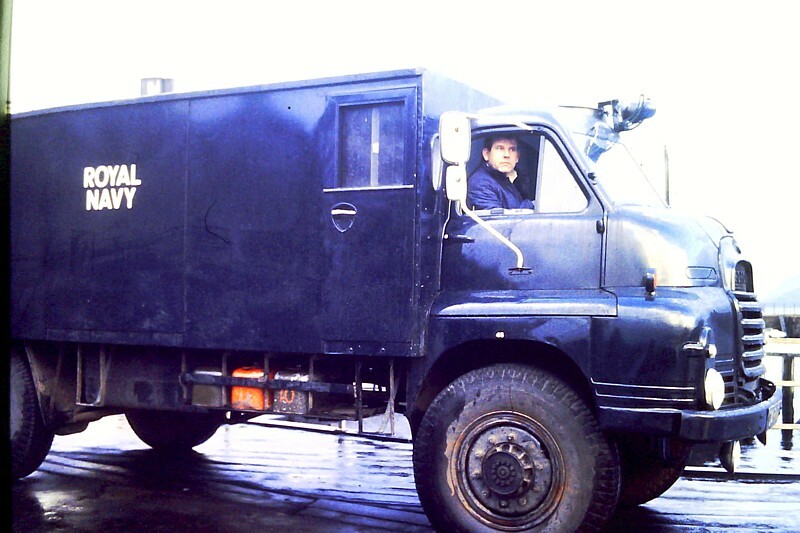 Stuart Honour served as the RN Training Officer at the Joint Services Bomb Disposal School (JSBDS - later DEODS) at Chattenden, Kent in 1968. When he departed JSBDS, he was towed away in a Gemini dinghy. "Jazz had a very elderly motor car. One felt that it was incomplete without the man with the red flag. We used to tell him that the reason it didn't have a cigar/cigarette lighter among its equipment was that it had been made before Sir Walter Raleigh got back from the tobacconist. 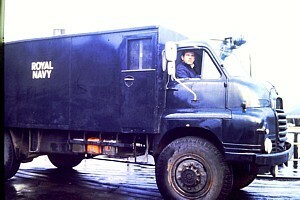 Four of us, all students of the Long Tactical Course used to travel to and from London on this vehicle. [By webmaster: In those days the Tactical School was still in the stable block of the old Military Academy at Woolwich, aka ‘The Shop’.] Two of the team are now Rear Admirals, Jazz and me, well we're much as we were then, but we'd read our horoscopes many years before and had shrewd ideas about what the stars foretold. Driving back to London one Monday morning, we had got just beyond Hindhead when Jazz slowed right down to a crawl: he appeared to be studying the 'clock' intensely. There was a loud cry of joy from him and we all had to join him in singing 'Happy Birthday to You'. All of the numbers on the 'clock' had changed. I told you that it was an ancient piece of hardware." 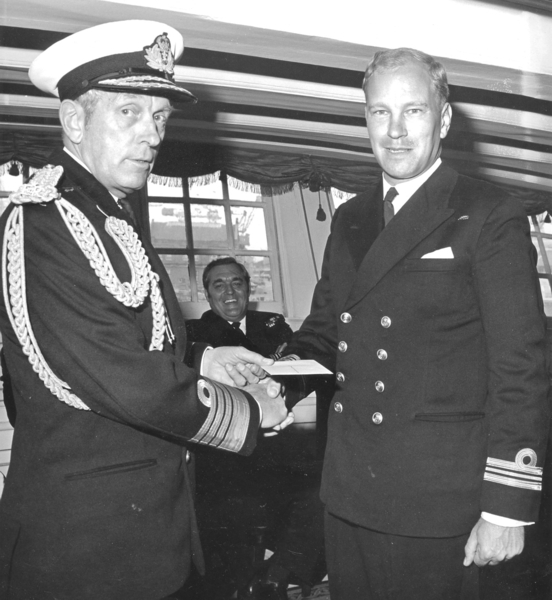 Stuart Honour represented the Captain of HMS Vernon in June 1971 when MCDOA member Brian Braidwood was presented with the Queen's Commendation for Bravery by Admiral Sir Horace Law in the great cabin of HMS VICTORY. In 1975, Stuart was faced with a particularly nasty but very rare type of bone cancer. 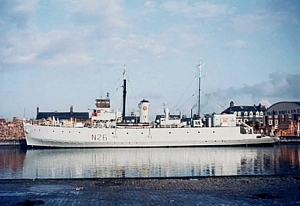 He had incurred it several years earlier as the result of a mine investigation trial involving HMS Dingley off Alderney. The shutter door of the Mine Radiographic Outfit's (MRO's) cobalt 'bomb' stuck open and Stuart kicked it closed: sadly, however, it had touched his shin and this was the source of the primary cancer. This cancer was so rare that the diagnosis took ages by which time his leg had to be taken out at the hip thus exposing terrible secondaries. 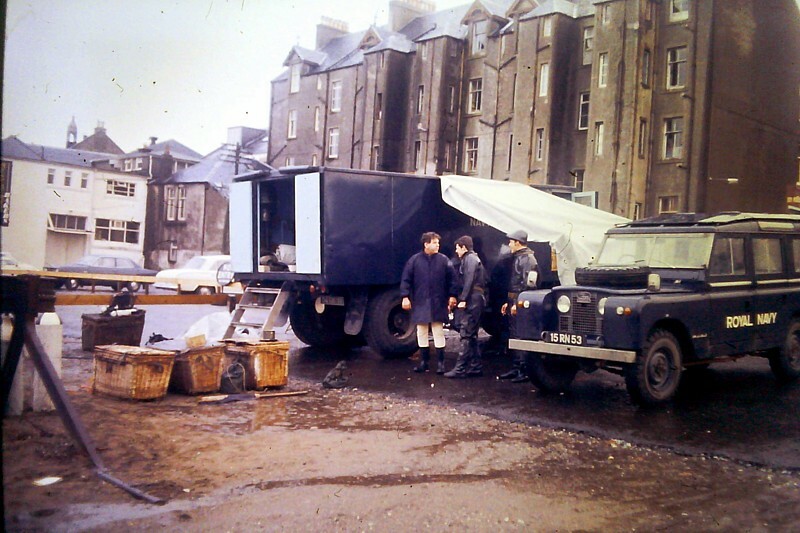 The late Arthur Checksfield telephoned Stuart almost every day and John Grattan visited him at least once a week from MoD Main Building in an effort to help. Stuart was the only man who took both deep radio and chemo therapy together, so the Ward Sister told John, and though he felt dreadful, he never lost his laughter and sense of humour. He also gave tremendous uplift to other patients although he was depressed by the number of patients who died. Having heard on the grapevine that Stuart was in the Royal Marsden Hospital, Mike Gillam also paid him weekend visits from his home in nearby Epsom. They chatted about old times and Stuart never seemed sorry for himself. Sometimes he was fine and sometimes he was heavily sedated and didn’t recognise Mike. On one occasion, Mike heard him give the order "Away, away the sea boat’s crew" in a loud voice that echoed throughout the ward. According to John Grattan, Stuart Honour overcame cancer, painted the outside of his house up a ladder on one leg, fell off a Vernon Wardroom bar stool (very hard to sit on one cheek of one's arse, he told John) before dying rather suddenly on 13 June 1977, possibly owing to pneumonia. He was only 54. The world was poorer for his going but those who knew him were enriched for ever. a] How he was blown across the Libyan desert when poking a burning, trepanned mine - this was part of the B&MD programme that earned him his MBE. b] He and I nearly coming to grief while dealing with an American bomb at Studland Bay after three boy scouts were killed there whilst playing with one of that particular stick - a sombre experience to say the least. 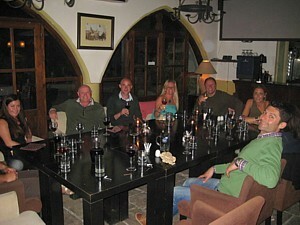 c] Our Idiots Club in Alderney - the Australian CD Tom Parker was the only other member. d] Stuart's wife Marion's heart attack when so dreadfully young and other problems on that side. 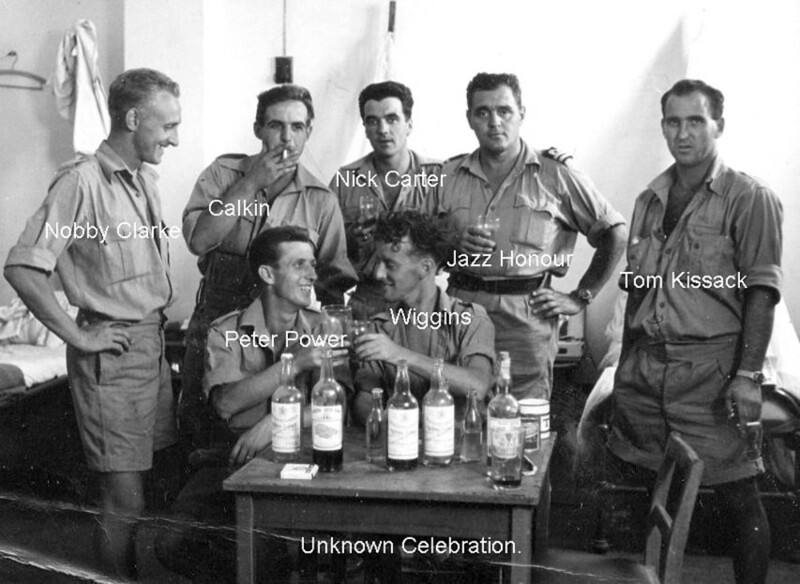 f] Losing an entire visiting US bomb disposal team - what a party. g] His heavily scarred forehead - the result of a car crash in Portland with Jim Neil. It is sad how time goes so quickly and many of the Branch now do not even know the names of the founders." 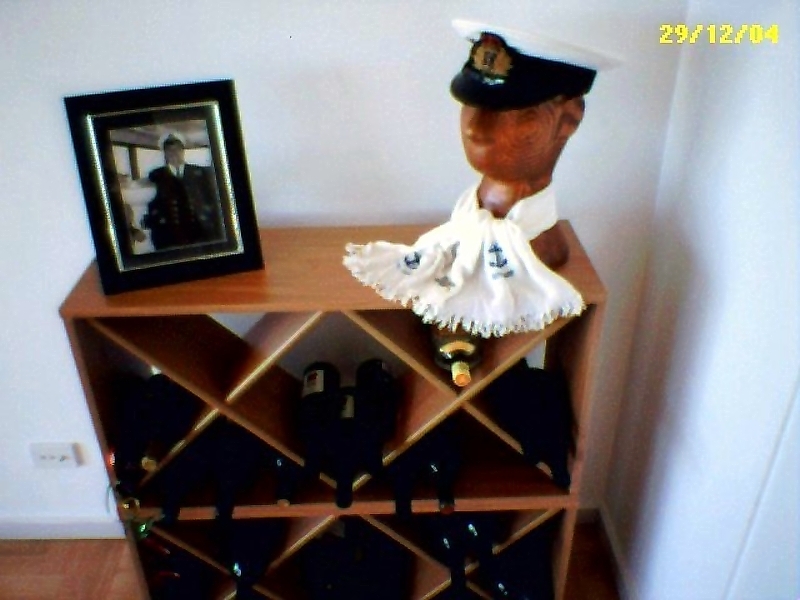 Left: Stuart Honour's cap, scarf and wine rack (including his favourite Gordon's gin). 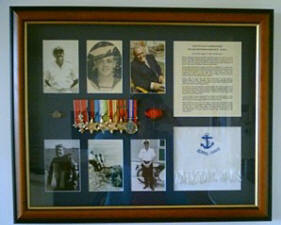 Right: Stuart Honour's medals and other memorabilia. "I heard on the radio today someone talking of people's 'role models'. It made me think - how many of us ever get round to telling the world of the marvellous folk we have met, admired and yet not said anything to anyone about? The first was when he had dressed down a senior rating of another service and was taken to task for doing so by a senior officer of that service. Stuart's reply is worth noting for posterity; it was, "Sir, what I gave that man was a naval blast and not a subject for political discussion!" The second incident was when my wife and I visited Stuart in hospital after another portion of his leg had been amputated. On my asking him, "How are you feeling then Boss?" Stuart replied, "Its a sure fire way of losing weight Ed!" A man, officer and character whom I am sure will long be remembered in the branch." 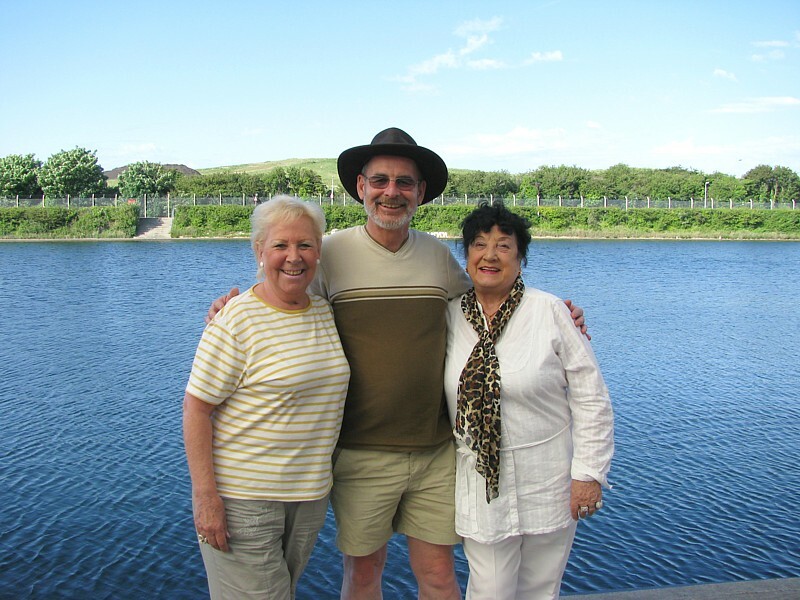 Although Stuart Honour's wife Marion died several years ago from a heart attack, I am still in touch with his daughter Louise in Australia and his nephew David in South Africa. They both follow events on the website with interest. I read through the article on Uncle Stuart over the weekend and must congratulate you on a great piece of work, it is a great memorial to a colourful person. I can give you a bit more information on his war service if you want to add it. He was serving in HMS Airedale during operation VIGOROUS involving the relief of Malta when, on 15th June 1942, the ship was bombed by Junkers 88s resulting in him ending up in the sea. He was pulled out and, as a result of having taken in a lot of oil, was sent to South Africa to recover at HMS Kongoni in Durban. On the 1st January 1943 he transferred to HMS Assegai in Pietermaritzburg where he undertook his officer training before being sent back to sea on the 24th April on board HMS Sussex. Thank you so much for such a wonderful article on my Dad. It really brought back such lovely memories of him and my eyes are still awash with tears. He really was my hero and, as was mentioned, such a large presence during his life for so many people both by his nature and, yes, that loud booming voice usually accompanied by that resounding laugh. He had such a sense of humour even in those sad times during the latter half of his long fight with cancer. 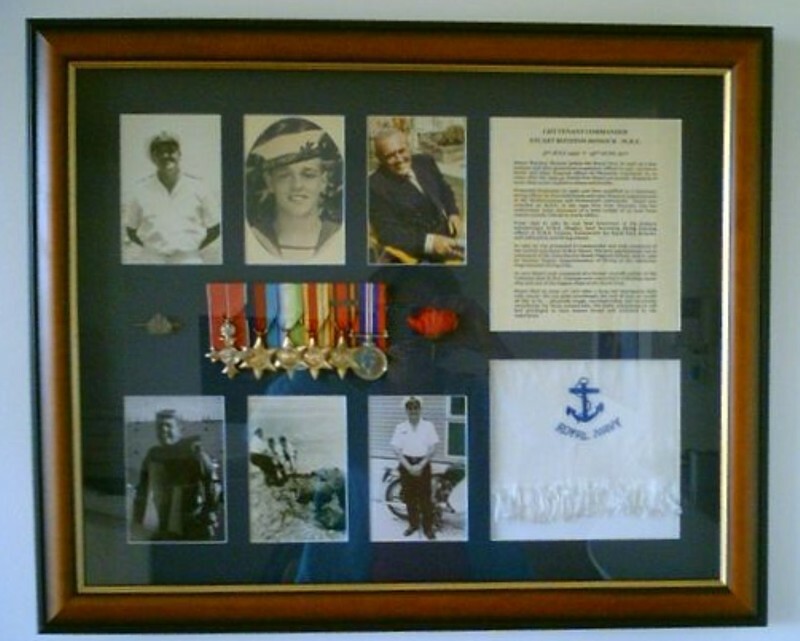 As a follow-on since the photo was published, I have applied for, and received from the UK, copies of his medals which I have duly had framed along with his Naval scarf and pin for safe keeping. I also enclosed a couple of my favourite photos of Dad, one of which was "another one" of him dealing with a mine and dragging it along with others along the sand with a lighted cigarette in his mouth!! I suppose his philosophy was if it is going to blow, then I'll go with it, lighted cigarette or not!! I have attached a copy for you. The article also mentioned that Dad didn't go for Horse's Necks as his favoured form of "liquid refreshment". As you'll remember, it was Gordon's Gin, not the other stuff which he likened to lamp oil. If you look more closely in the wine rack beneath the wooden sculpture made in his likeness, you'll notice the bottle of Gordon's kept there for him. Thanks once again for such an informative and perceptive article of Dad's distinguished career. Yesterday's Daily Telegraph contained this obituary for Hugh Clark who died on 29 April, aged 62. I was shocked to hear this news because I have fond memories of being Hugh's XO when he was the CO of the minehunter, HMS Wilton, the world's first plastic warship. In 1979, we visited Aberdeen where his father was a lecturer at the university. Hugh was a qualified Sea King pilot instructor but he was still a Lieutenant, as were Wilton's NO and GO (both graduates) and me. 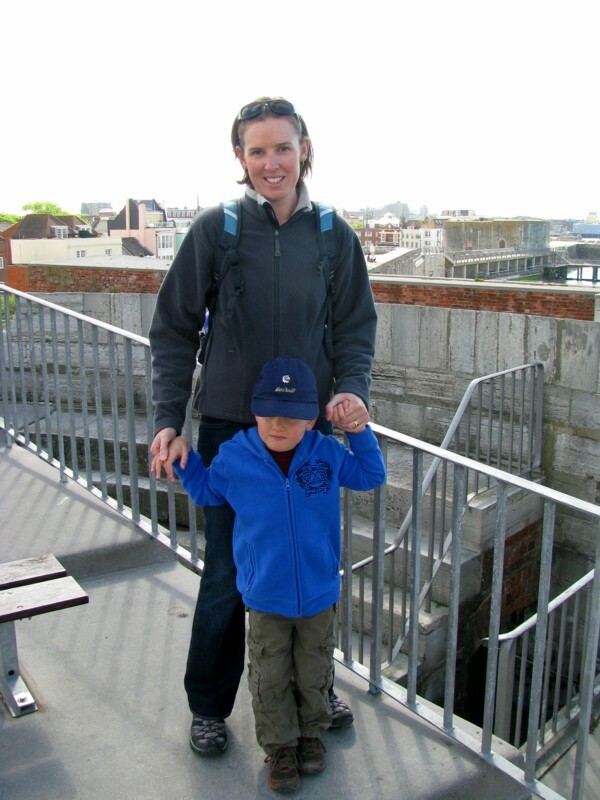 Naturally enough, his parents visited the ship and we were all having tea in the wardroom together when he asked them whether they would lend him their car so he could show us around the Granite City. I'll never forget his mother turning anxiously to his father and saying, "Do you think we really ought to?". Once a mother, always a mother. Hugh lived in a cob cottage at Breage near Helston in Cornwall and we once interrupted our passage from Portsmouth to Oban and anchored offshore to enable the non-duty watch to participate in the evening Furry Dance through the streets and pubs of the town. In 1981, Hugh organised the sword arch when he and his first wife, Jackie, attended my own wedding in South Wales. He was quite a character and a thoroughly good egg. Venerable MCDOA member 'Uncle Bill' Filer has informed me that MCDOA associate member Dr John Bevan will give a talk about diving in the Methodist Church Hall, Hight Street, Lee-on-the-Solent between 1930 and 2100 on Tuesday 22 June. All are welcome to attend. In March 1970, John Bevan and Peter Sharphouse of the RN Scientific Service (RNSS) staff at the Royal Naval Physiological Laboratory (RNPL) at Alverstoke established a new deep diving record in the Deep Trials Unit (DTU) by spending 10 hours at a simulated depth of 1,500 feet of seawater (457 metres of seawater). This dive was 300 feet beyond the predicted maximum of around 1,200 fsw (366 msw) and was described by American colleagues at the time as “a hyperbaric moon landing”. 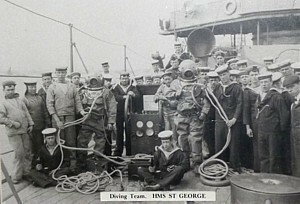 HMS Reclaim’s divers participated in the trials and later applied the lessons learned and the decompression tables developed when diving from their ship. 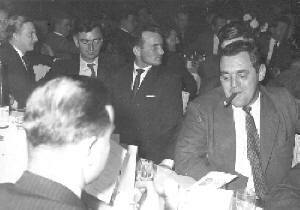 Later, John became involved in technical management and consultancy for Comex and Comex-John Brown. 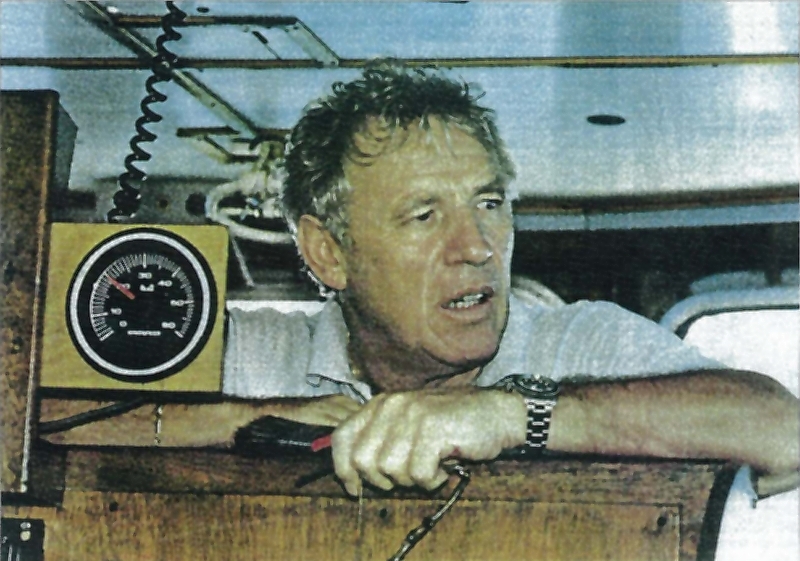 Since 1976, he has run his own very successful underwater engineering consultancy company, Submex Ltd, edited 'Underwater Contractor International' and published 'The Professional Divers Handbook'. He is the Chairman of the Historical Diving Society (HDS) and has written several books including 'The Infernal Diver' about John and Charles Deane (the true inventors of the diving helmet) and 'Another Whitstable Trade - An Illustrated History of Helmet Diving'. The wurst of times for Walney: The recent activities of HMS Walney as a member of Standing NATO MCM Group 1 (SNMCMG1). A tale of three Hunts: Recent operational changes for HMS Atherstone, HMS Chidingfold and HMS Middleton. Gulf flare: The participation of HMS Pembroke and HMS Grimsby in the Doha International Maritime Defence Exhibition and Conference. Divers dig deep: the raising of £500 for Help for Heroes by divers based at Horsea Island. The mysteries of Maryton: A letter containing a midshipman's memories of this Ton class minesweeper. 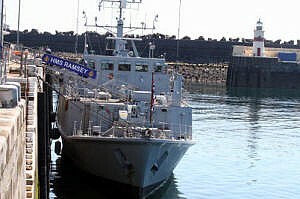 Ramsey comes to town: A home town visit to the Isle of Man by HMS Ramsey. I attended the AGM of the Association of RN Officers (ARNO) at HMS Excellent today and spent a few minutes chatting to former First Sea Lord, Admiral of the Fleet Sir Julian Oswald. 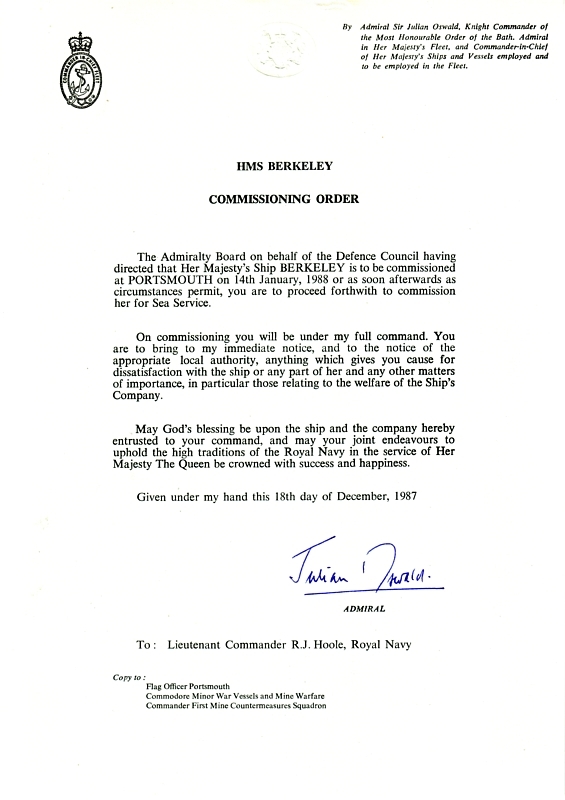 I still have a copy of the Commissioning Order for HMS Berkeley (now HNS Kallisto in the Greek Navy) which he signed as Commander-in-Chief Fleet when I was her first CO (see below). Before taking Berkeley to the Gulf in 1988 for an eight-month deployment, I accompanied former MCDOA Chairman Brian Mansbridge (then CO of HMS Cottesmore) to Northwood for briefings and Sir Julian was kind enough to come in from MOD Main Building specifically to wish us well. Today, Sir Julian was gracious enough to purchase a book of tickets for this year's Project Vernon Prize Draw and was most keen to support our worthy cause. I still have some books left if anyone would like any to buy or sell on. They are priced at £2 per ticket or £10 for a book of five and there are some phenomenal prizes this year as you can see from this page of the Project Vernon website. If interested, please e-mail me via my Webmaster address. 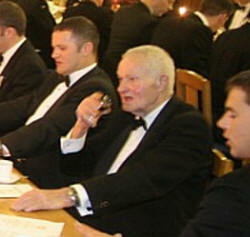 Postscript: Sadly, Sir Julian died on 19 July 2011, little more than a year after this event. His Daily Telgraph obituary can be found here. 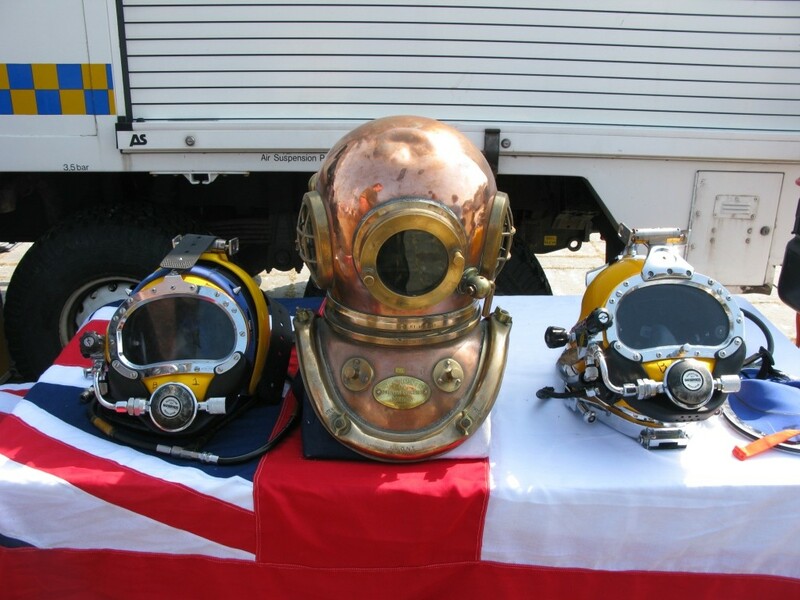 The RN website contains this article describing a recent joint-service diving exped in Cyprus. I particularly like the idea of sharing a space with "conga eels". Would they expect you to join in? 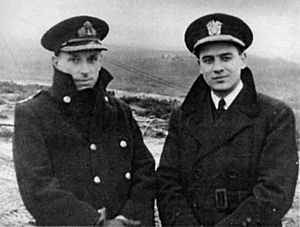 I am indebted to MCDOA members Phil Ireland and David Hunkin for informing me that fellow member Martin Mackey was on today's SASB signal listing those selected for Sea Command. Many congratulations to Martin for this well-deserved recognition of his leadership qualities and seagoing expertise. Hope all is well. Thought that you would like to know that Don Crosbie and I attended our MA graduation on Friday. We both joined an illustrious group of fellow MCDOA members who hold an MA in Defence Studies from Kings College London which we all gained during our respective time on the Advanced Command and Staff Course held at the Joint Services Command and Staff College, Shrivenham. Not much of a story really, but given that Don and I were non-grads when we joined the RN together (like most of our contemporaries) and have been good mates for the past 23 and half years, it was a great experience for us both to do the course together. Not just a couple of bone divers! P.S. Thanks for sponsoring the Salty Old Seadogs Mountaineering Team in their bid to raise £5,000 for Seafarers UK. As a reminder for others, we are doing well with raising our money, training hard and always appreciative of any amount people are willing to sponsor us for. We're at: http://www.justgiving.com/SaltyOldSeadogs." Hearty congratulations to Martin and Don on their marvellous academic achievements. Today's Sunday Express contains this article about HMS Daring featuring her Captain, MCDOA member Paddy McAlpine. The article also mentions the Captain's dining table (actually oak, not mahogany), made and donated by the Worshipful Company of Carpenters. MCDOA member Brian Dutton DSO QGM is the former Beadle of the Carpenters' Company and is now a Liveryman. Last year, he presented the Company with a framed Double Remarque edition print of 'Danger at Depth', the painting created by John Terry FCSD to help raise funds for Project Vernon. Brian's gift now hangs in Carpenters' Hall in London. A Channel 4 programme about HMS Daring, called 'Building Britain’s Ultimate Warship', will be broadcast at 1930 tomorrow. Today's Portsmouth News website contains this article describing a call-out to a bomb scare in Southsea for Southern Diving Unit 2 (SDU2). Postscript: The Portsmouth News contained this follow-up, describing the incident as a false alarm, on 31 May. I have had a soft spot for HMS Atherstone ever since her first CO, a non-MCD called John Bailey, somehow arranged for me to attend the launch of her next-in-line sister ship, HMS Berkeley (now HMS Kallisto in the Greek Navy), at Vosper Thornycroft in Woolston on 3 December 1986. This was several weeks prior to my official appointment as Berkeley's first CO. Berkeley's first XO, a certain MCD called John Murphie, had joined some time before. 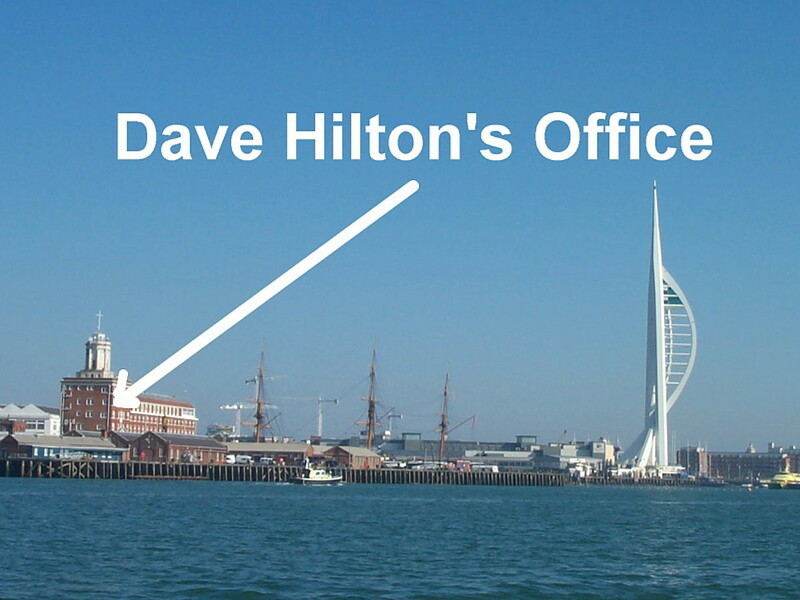 That is one of the reasons why your intrepid webmaster was on the Round Tower at the entrance to Portsmouth Harbour this morning to help welcome Atherstone back from her 27-month deployment to the Gulf. Her current ship's company (MCM 2 Crew 8) has been with the ship for the past five and a half months. 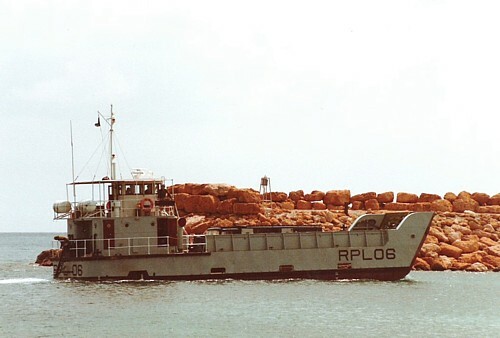 During her passage home, Atherstone stopped in Oman and Djibouti and paid longer visits to Malta and Alicante. 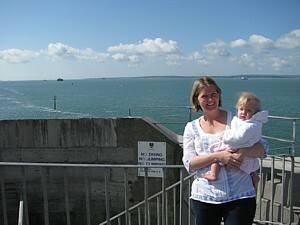 While waiting for the ship to arrive, I met Liz Kendrick and her daughter Evie. 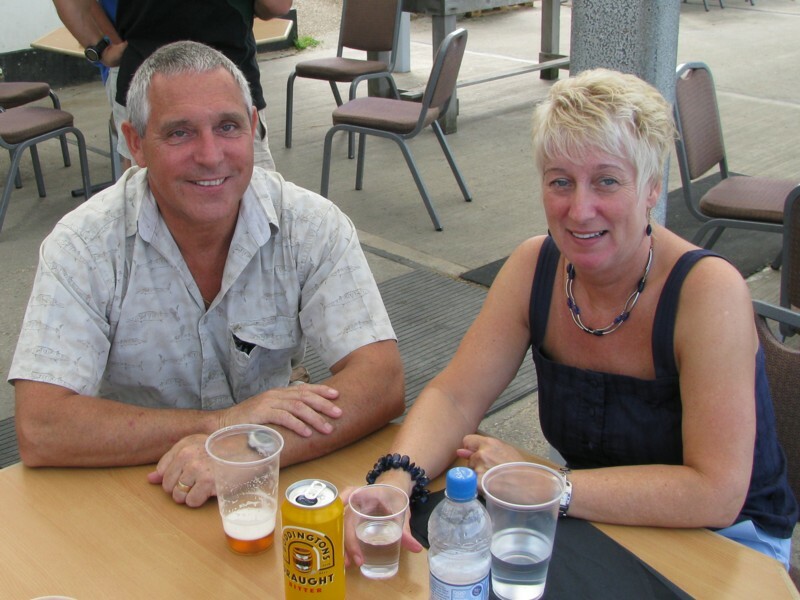 She and her WEO husband Alex are friends of Atherstone's CO, Gordon Ruddock, and his wife Jane who is also in the RN. I also met Jodie Hutchison with her son Ben. Jodie's husband, Jace, is an MCD Lt in the RAN and is currently on courses here in the UK prior to taking over as XO of a Portsmouth-based Hunt Class minehunter in September. Jace and his family (including daughter Emily who was otherwise engaged this morning) arrived from Perth, Western Australia in December and I have urged Jodie to persuade her husband to join our Association. Atherstone at last emerged from the surprisingly congested shipping channel into brilliant sunshine and very smart she looked too. As she and QHM's escorting launch passed our historic position, we waved at her before she made her way up harbour to 2 Basin for some undoubtedly joyful family reunions. Before leaving the scene, I was approached by a vaguely familiar figure who had recognised me. It turned out to be fellow Ton Class Association (TCA) member Eddie Booker who joined the RN in 1953 and later served in HMS Leverton. We had an enjoyable chat before departing our separate ways. Good to see you, Eddie. The BBC website contains this article, the RN website contains this article and the Portsmouth News contains this article with more photos of Atherstone's return. I'm sure we all wish her ship's company a thoroughly good leave and all the best for whatever the future may hold. 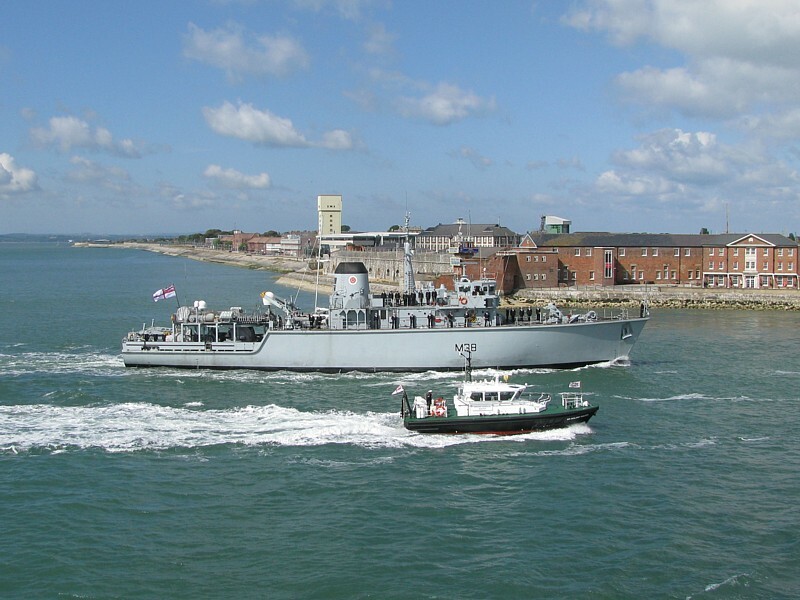 Today's Portsmouth News contains this article announcing the return of HMS Atherstone (MCM 2 Crew 8) on Friday from her 27-month deployment to the Gulf. The RN website contains this article. According to QHM Movements, Atherstone's ETA at OSB (Outer Spit Buoy) is 0930. Today's Daily Telegraph contains this obituary for ex-Royal Marine Keith Jessop who master-minded the salvage of ten tons of gold bullion worth £50m from the wreck of the cruiser HMS Edinburgh, lying in 800 ft of water in the Barents Sea, in 1981. 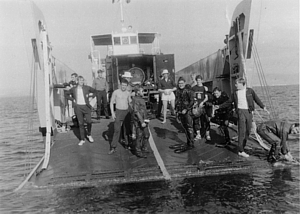 Several ex-RN divers were involved in the operation including MCDO Jim Ringrose (LMCDO '75) as Operations Director. One of the best accounts of this venture was 'The Salvage of the Century' by Ric Wharton. 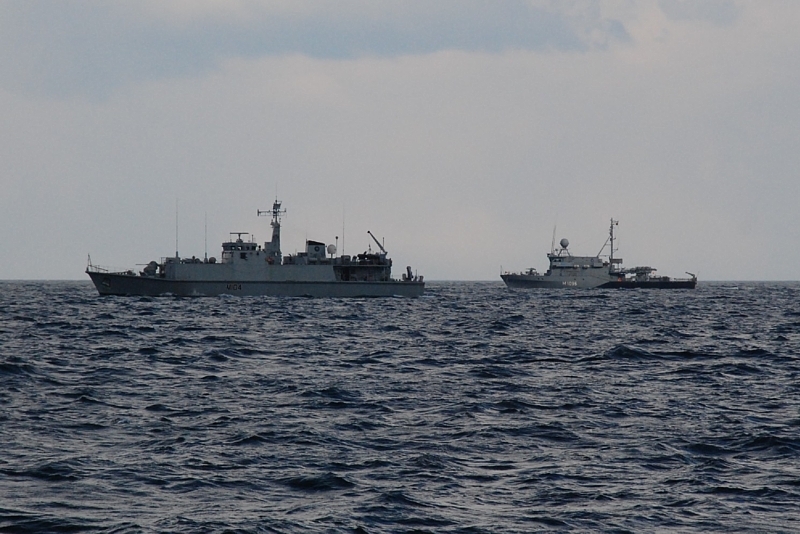 The Navy News website contains this article describing the participation of the Faslane-based minehunter HMS Walney (MCM 1 Crew 1) in Exercise BRILLIANT MARINER in the Baltic (also see second entry for 30 Apr 10 in News Archive 30). Most of us know about the volunteers from distant parts of the British Empire, chiefly Canada, Australia, New Zealand and South Africa, who rallied to the cause at the beginning of the Second World War. 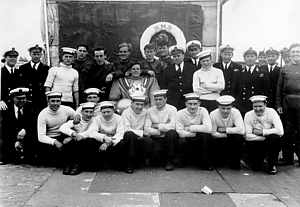 Fewer are aware of the US citizens who joined the Royal Navy long before their country entered the war. Several were trained at the Royal Naval College in Greenwich but their names were not publicised at the time because foreign military service was against US law. 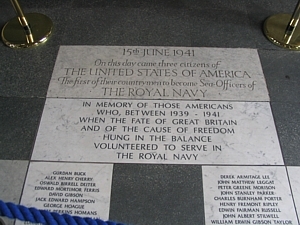 However, some time later a stone tablet was laid in the floor of the Painted Hall at Greenwich, dedicated to three US citizens who arrived on 14 June 1941 to become 'Sea-Officers' of the Royal Navy. 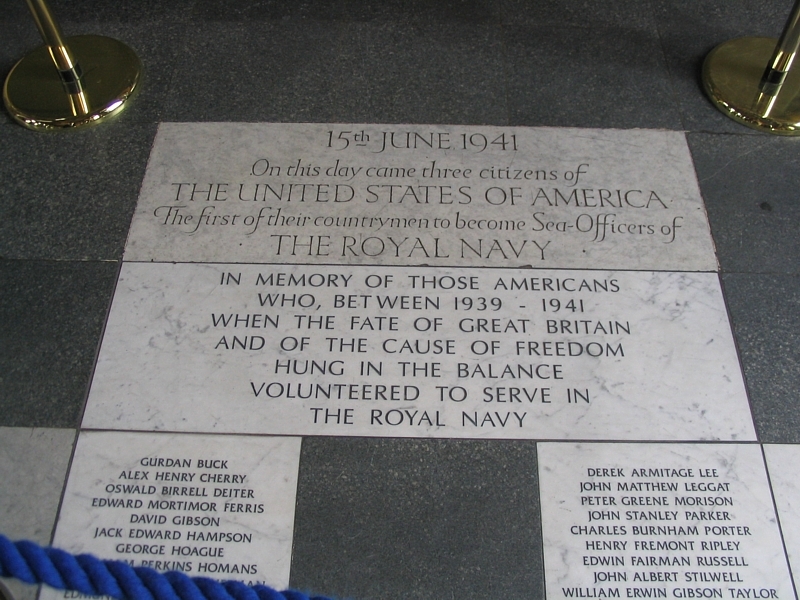 As it transpired, there were twenty-two US citizens who volunteered for the Royal Navy before the USA entered the war, some of whom had arrived in the UK long before June 1941. Five weeks after the destruction of the World Trade Centre in New York (9/11), the Archbishop of Canterbury dedicated three additional stone tablets, listing the names of all 22 individuals, in the presence of representatives of all of the volunteers' families and hundreds of guests. A Royal Marine band played 'America the Beautiful' and 'The Star-Spangled Banner'. A forthcoming book will now tell the story of these individuals. Called 'Passport Not Required - US Volunteers in the Royal Navy 1939 - 41', it is written by Eric Dietrich-Berryman, Charlotte Hammond and R. E. White and is due to be launched by the Naval Institute Press in October. 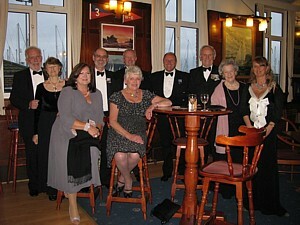 A UK launch party organised by Tim Lewin, son of the late Admiral of the Fleet Lord Terry Lewin GCB MVO DSC, will take place on board HMS Belfast on Monday 18 October 2010. Signed copies will be on sale and there will be a chance to meet the authors and some famous RN people but the launch is invitation-only. "Although bad eyesight kept him from receiving a commission in the U.S. Navy when he graduated from the Naval Academy in 1933, Draper Kauffman became a hero of underwater demolition in World War II and went on to have a distinguished naval career. Today Admiral Kauffman is remembered as the nation's first frogman and the father of the Navy SEALs. His spectacular wartime service disarming enemy bombs, establishing bomb disposal schools and leading the navy's first demolition units is the focus of this biography written by Kauffman's sister, Elizabeth Kauffman Bush. Mrs. Bush, who is also the aunt of President George W. Bush, draws on family papers as well as navy documents to tell Kauffman's story for the first time. Determined to defend the cause of freedom long before the United States ever entered the war, Kauffman was taken prisoner by the Germans when he was an ambulance driver in France. 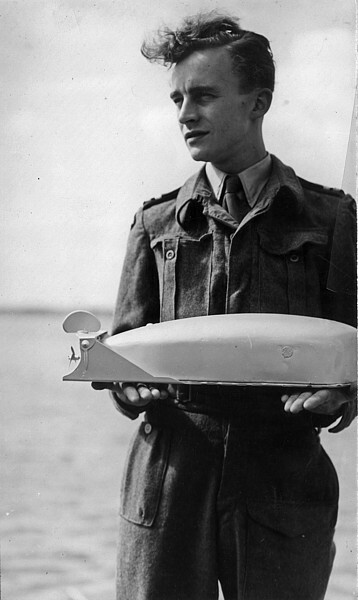 After his release, he joined the Royal Navy to defuse delayed-action bombs during the London blitz. Sent home to recover from wounds he received, Kauffman was given a commission in the U.S Naval Reserve in November 1941. Because of his prior experience, he was asked to establish an underwater demolition school at Fort Pierce, Florida where he personally trained men to defuse bombs and neutralise other submerged dangers. That team was sent to demolish the obstacles installed by the Nazis at Normandy, and Kauffman himself led underwater demolition teams at Saipan, Tinian, Iwo Jima, and Okinawa. 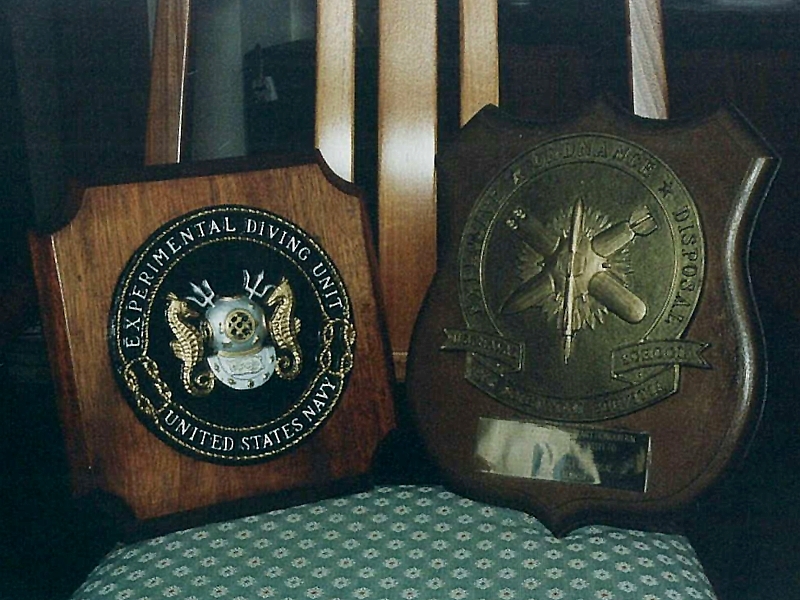 Because of the high standards he set for those who became frogmen, thousands of American lives were saved in World War II, Korea, and Vietnam. Always leading by example, Draper Kauffman established underwater demolition traditions of extraordinary courage that are carried on by Navy SEALs today. Mrs. Bush records her brother's legacy to the U.S. Navy and the details of his life with a historian's attention to detail and a novelist's flair for story-telling." Draper Kauffman died on 18 August 1979 but he will always be regarded as the founder of US Navy bomb & mine disposal and we should be grateful for the wartime contribution made by him and his fellow countrymen when Britain needed them most. After the USA entered the war in December 1941, several US Navy officers were attached to the Royal Navy for various purposes. We should particularly remember Ensign John Howard USN, killed at the age of 24 with Lt Cdr Roy Berryman Edwards DSO RN at Corton Sands near Lowestoft on 11 June 1942 while attempting to render safe a German GT moored mine. Another US Navy officer involved in RN bomb & mine disposal was Lt(jg) Eugene 'Gene' Haderlie USN. The remarkable story of this much-travelled man is related in 'Conversations with Marco Polo' by Mark Denny and Joanna Lee Nelson (Xlibris Corporation, Bloomington, Indiana, 2006) and is well worth reading. Lt Stephen Wilkinson RNVR was awarded a Mention in Despatches "for courage and undaunted devotion to duty" in August 1944. 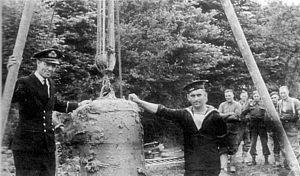 Sadly, he lost the use of his right hand after a flooder cutter exploded while he was rendering safe a German GP moored mine (one of several captured on a barge in Antwerp) at Frater Armament Depot in December 1944. He had been a concert pianist before the war. I am grateful to Lt Cdr Adam Northover RN, the Commanding Officer of HMS Brocklesby (MCM 2 Crew 2), for reporting that his ship completed her maintenance period earlier in the year and has since conducted sea trials which included deep diving off Falmouth. The ship sailed north to Faslane during the first week of April and took part in Exercise JOINT WARRIOR (formerly JMC and NEPTUNE WARRIOR) with other units from the US, Brazilian, Norwegian, Belgian French and German navies. She is now back at Faslane conducting Operational Sea Training prior to deploying later in the year. 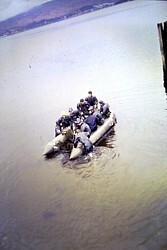 13 members of the Royal Navy Clearance Diving Branch will be carrying out an individual 10 mile swim (i.e. it's not a relay!) of Windermere on 25th September 2010 in aid of Help for Heroes and Project Vernon. We anticipate taking approximately between 5-8 hours of pain and boredom. Swimmers taking part are: John 'YoYo' Ravenhall, Mick Beale [MCDOA member], Steve Fitzjohn, Knocker Knowles, Richard 'Soapy' Watson [MCDOA Treasurer], Chris Flaherty [MCDOA member], Chris Greenaway, Jay Hogg, Matt Prosser, Rex Turnbull, Jonathan 'Chuck' Norris, Sean 'Screech' Dunstan and Steve Vernon. Please support us - this is going to be a difficult challenge for us all. 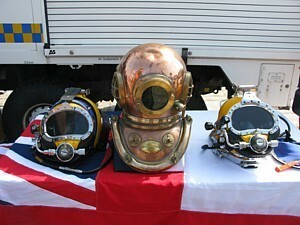 Diving Standards Officer (Royal Navy)"
These are two excellent causes so let's see the colour of your money. The Brighton Argus website contains this article describing how Southern Diving Unit 2 (SDU2) was called out yesterday to deal with a live mortar bomb handed in at Littlehampton police station. 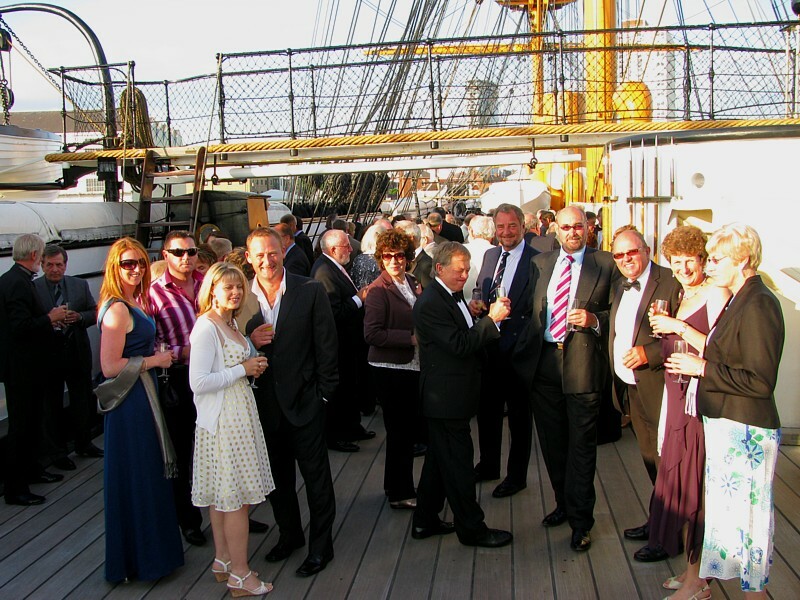 Places are still available for this year's RN Divers' Dinner, organised by the Association of RN First Class Divers (AORNFCD), on board HMS Warrior 1860 on Sat 12 June. 139 have signed up so far including MCDOA members and spouses John & Marjorie Grattan, Rob & Linda Hoole, Paul & Yvonne Jones, Paul & Liz McDermott, Mike & Monica Stewart, Richard 'Soapy' Watson and Graham 'Tug' & Annette Wilson. Other familiar Branch names include Vic Anderton, Cris Ballinger, Alan Broadhurst, John Dadd, Terry Gosling, Don 'Jimmy' Green, Paul 'Dhobey' Lines, Gabby Haines, Derek 'Maggie' Lockwood, Joe Maher, 'P' Party veteran Ray 'Brum' Maries, Harry Neave, Les Sharpe, Stew 'George' Sissons, Tim Sizer and a host of others, also accompanied by spouses or partners in most cases. Further details are available in the website's 'Forthcoming Events' section where the calling notice and booking form can be downloaded. Why not make a weekend of it and sign up for the Combined Association Barbecue at Horsea Island on Sun 13 June too? The painting should be finished by the end of June after which limited edition prints will be put on sale. Even at this stage, the overall effect and level of detail are stunning. Copies of the artist's sketches have been available for purchase since the May Bank Holiday weekend promotion at Gunwharf Quays. Yesterday's Times of Malta contained this article describing a stop-off in Malta by HMS Atherstone (MCM 2 Crew 8) en route back to the UK after her 27 month deployment in the Gulf. On Tuesday a few members of the BD Officers Club, including Maj Simon Cooke, Lt George Carroll and Capt Nobby Clark, attended a celebration of 70 years of Bomb Disposal at the RE Museum. This included a comparison of the role of the BDO over the last 70 years led by Sue Hudson, Simon and George. Following this Nobby led a tribute to those killed on operations. 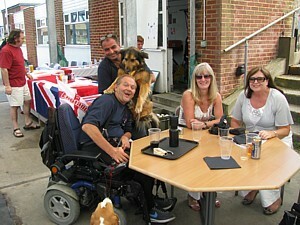 It was covered on ITV and BBR Radio Kent - links below. The item on the Dominick King show is about 1 hr 15 mins in. The event also included the launch of Sue Hudson's book 'UXB Malta'. Many thanks to Sue for setting up the event and to Simon, George and Nobby for speaking. Thanks also to Sandy [Sanderson] for representing EODTIC and John & Pete for representing the REA. Several MCDOA members and other associates rallied round to help Captain Peter Hore RN compile this obituary for Surg VA Sir John Harrison in today's Daily Telegraph. I am particularly grateful to MCDOA associate member Surg Cdre Jim Sykes, and to Surg Capt David Elliott OBE RN and his colleague Andrew Johnson, for their contributions describing John Harrison's work in diving medicine, especially with regard to dysbaric osteonecrosis (the reason so many of us underwent long bone X-rays during our annual diving medicals). The Times published this obituary on 7 May. We extend our sincere condolences to Sir John's family, friends and colleagues, especially to his two sons. Many thanks for copying me on this - Pete did a great job of the obit I thought. Many thanks for all your efforts. "Whilst many were sleeping, last week eleven members of HMS MIDDLETON's ship's company, led by the CO and XO and including personnel from all messes, rose early to take part in the monthly 5 km fun run at the local American Naval Base. The team registered for the race at 0530 ready for a 0600 start. As the race started many sprinted ahead looking to take an early lead, although it became clear that as the temperatures increased it would be difficult to continue the pace. Driven on by the incentive of a race t-shirt, everyone pushed on albeit at varying speeds! The race finished with AB Max Bumford a clear winner, although closely followed by LET(ME) Pat Rice, PO(D) Clark, PO(ET) McAllen and Lt Dave Mason." The BBC News website contains this article describing the presentation by Admiral Sir Trevor Soar, the Commander-in-Chief Fleet, of the Queen's Commendation for Bravery (QCB) to LS(D) Carl Thomas. 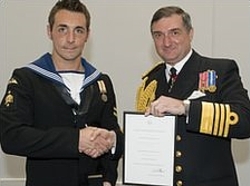 The award was made "for bravery in risking his life several times in an attempt to stop flooding of the engine room on HMS Endurance on 16th December 2008". 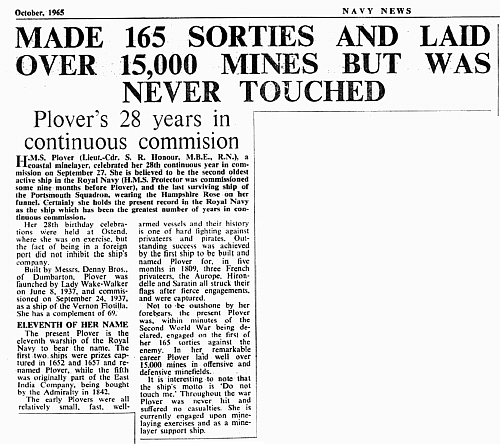 It was first announced in the Operational Honours & Awards published in March (see entry for 23 Mar 10 in News Archive 29). Postscript: The Portsmouth News published this article on 12 May. Today's Portsmouth News contains this article describing the solo passage of the Portsmouth-based minehunter HMS Middleton to the Gulf. 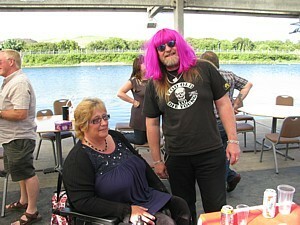 Numbers for this year's Ladies Night were well down on previous years although I am still puzzling the reason. At only £25 per head for exceedingly good company, uniquely pleasant and relaxed surroundings, drinks on arrival, a fine three-course meal with wine, and coffee & mints to finish off, I'm not sure what else we can do to make it more attractive. Is it the recession? Any constructive ideas would be welcomed. 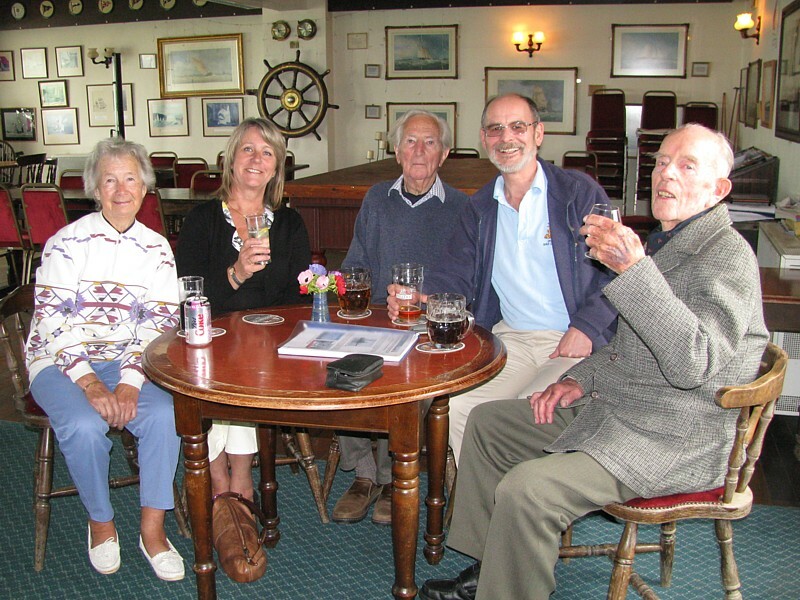 Anyway, Doug Barlow and his partner Jill Smith, Brian & Audrey Dutton, Tony & Debs Griffiths, Rob & Linda Hoole and Paul & Yvonne Jones enjoyed a wonderful evening last night at Hornet Sailing Club. The ladies all looked scintillating in their corsages. As ever, thanks to our Honorary Secretary Tony Griffiths for organising this traditional event as well as Maitre d'Hotel Joyce Longstaff and Chef de Cuisine Lisa McLean for their unstinting efforts and meticulous attention to detail. Outgoing MCDOA Chairman Paul Jones presented Tony with a bottle of single malt for all the support he has provided during his tenure. 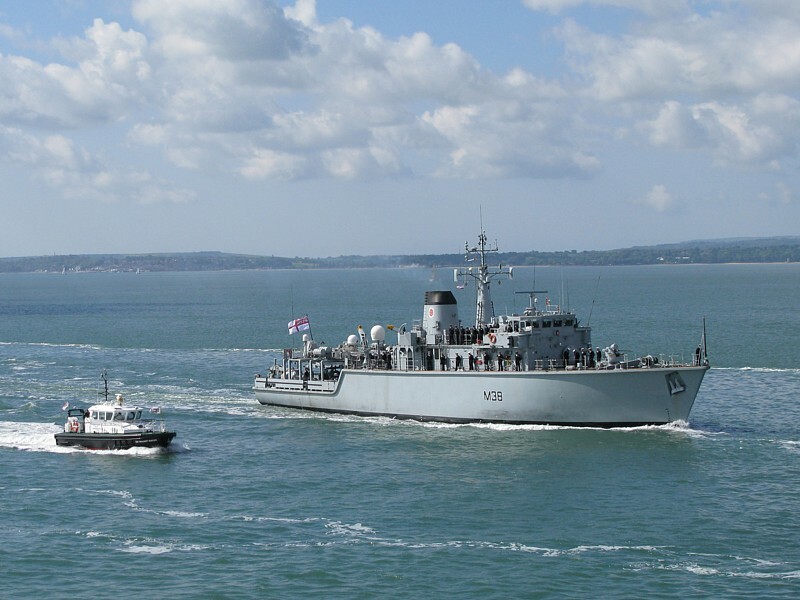 The Bournemouth Echo website contains this article announcing a visit this weekend by the Portsmouth-based minehunter HMS Cattistock to Poole, her affiliated town. HMS Cattistock's current ship's company (MCM2 Crew 5) returned earlier this year from manning HMS Chiddingfold in the Gulf for six months. The article's home town story features Cattistock's Ops Officer, non-MCDOA member Alex Scott (I'm still trying to persuade him to join us). 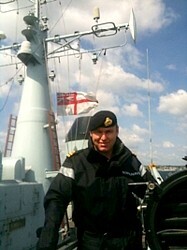 "April has been a busy month since returning from Easter leave for HMS SHOREHAM. 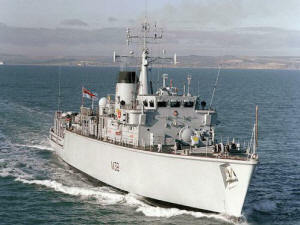 The first week back enabled the ship to conduct a Short Maintenance Period in Faslane. With the ship alongside in HMNB CLYDE, Rear Admiral Snow, Flag Officer Sea Training and Rear Admiral Surface Ships, took advantage of his visit to the base for Exercise JOINT WARRIOR 101, to pay a visit to HMS SHOREHAM. 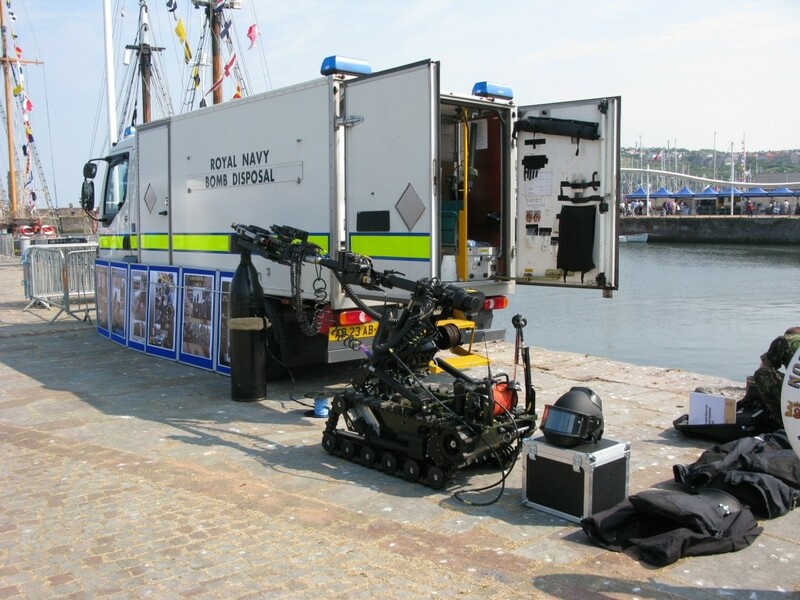 A key item on the agenda was to demonstrate the capability of SeaFox, the unmanned remote operated vehicle, capable of detecting and disposing of the mine threat. The visit was also an opportunity for Rear Admiral Snow to meet the Crew of HMS SHOREHAM and for the ship's company to challenge him on Service issues. 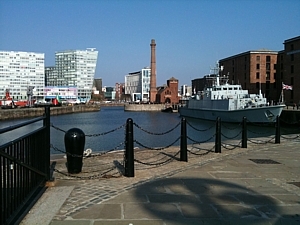 After the busy SMP, HMS SHOREHAM departed for an informal visit to Liverpool. 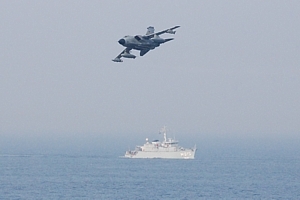 En-route, HMS SHOREHAM took the opportunity to conduct small arms Gunnery Exercise. 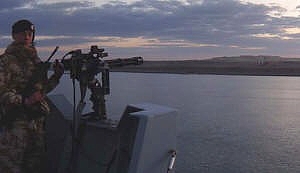 With mini-guns and GPMGs firing at a floating target under the watchful eye of staff from FOST, several members of the ship's company completed their final tasks for qualification. The visit to Liverpool was an opportunity for HMS SHOREHAM to demonstrate to the general public the Royal Navy’s vital role at home and abroad and how it is a key player in today’s areas of tension. The ship was open for a ‘Ship’s Open to Visitors’ which saw 300 members of the public taking the chance to explore HMS SHOREHAM and put questions to the crew about her roles and capabilities. 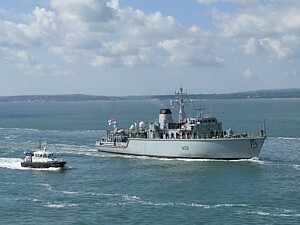 On departing Liverpool HMS SHOREHAM moved to the Irish Sea for some national tasking and exercises. HMS SHOREHAM adopted Defence Watches in order to facilitate the work, the six hours on six hours off routine is both tiring and demanding however, it does allow the ship to be ready at all times with no affect on operational capability. 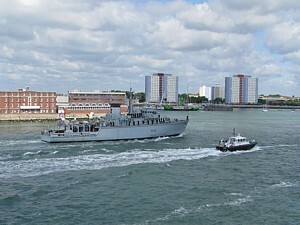 After a challenging week, HMS SHOREHAM returned back to her home port on the Clyde. During this short passage the ship's company took the opportunity to conduct important internal training such as Man-Overboard drills and Firefighting exercises, preparing in case it were to happen for real. The end of April brings a period of maintenance for HMS SHOREHAM and a chance for the ship's company to attend courses, to participate in sports or to take much wanted leave." 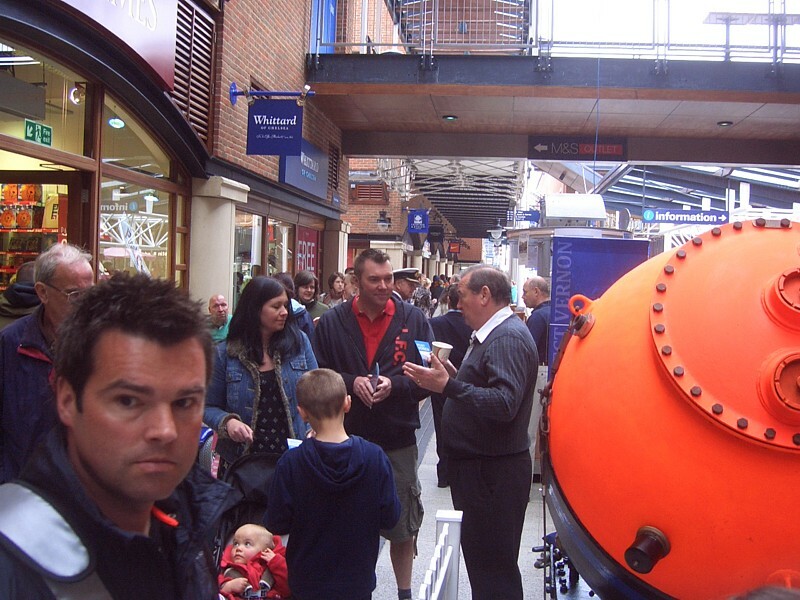 Thanks to ex-WO(MW) Dixie Dean MBE, Trustee & Head of Communications for Project Vernon, a slideshow of photos taken during the May Bank Holiday weekend promotion at Gunwharf Quays is available here. Spot the familiar faces! 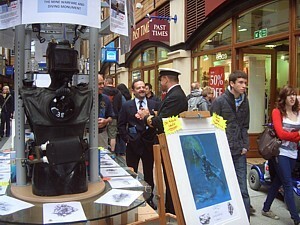 Thanks to the efforts of Paul Jones [current Superintendent of Diving and MCDOA Chairman] and David Hilton [a former Superintendent of Diving and MCDOA Chairman now working in Portsmouth Naval Base], it is quite likely that we may have an area to promote Project Vernon during Navy Days in Portsmouth 29-30 Jul and 1 Aug. The plan will be to co-locate with SDU2 and basically sell tickets for the Summer Draw, the Danger at Depth prints and hopefully the Vernon Creek prints as well as promote the project. Whilst this is still in the planning stage, the aim of this email is to gauge potential support from volunteers to man the display over the three day period and to ask if you could possibly spare some time over the three days to help out. This is a major event and will obviously require a considerable amount of commitment from us (the project) as a whole in order to make it a success. However, two or three hours from each volunteer would eat into the time needed to man the display. If you feel that you can help over the period could you please let me know so that I have some idea of how many volunteers we might expect over that period (tentative offers most acceptable). I will of course keep everyone informed and once we have a firm offer from the organisers, the planning will start with vigour albeit a lot is in place already with regards to props, banners and such like. 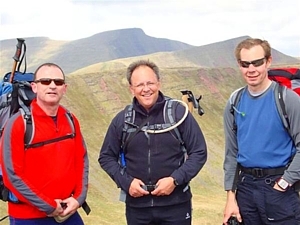 "MCDOA member Tug Wilson and former WO(D) Tim Sizer are attempting to follow in the footsteps of Alfred Wainwright by completing the Coast to Coast Walk. The walk stretches from St Bees Head in the West, to Robin Hoods Bay in the East, a total of 192 miles, taking in three national parks. The walk will commence on 16th May 2010 and the aim is to complete it in 12 days. All funds raised will be donated to Help for Heroes. As once-qualified IEDD operators, we both feel very strongly in supporting our service personnel who are continuing to be injured, far too frequently by these cowardly devices. 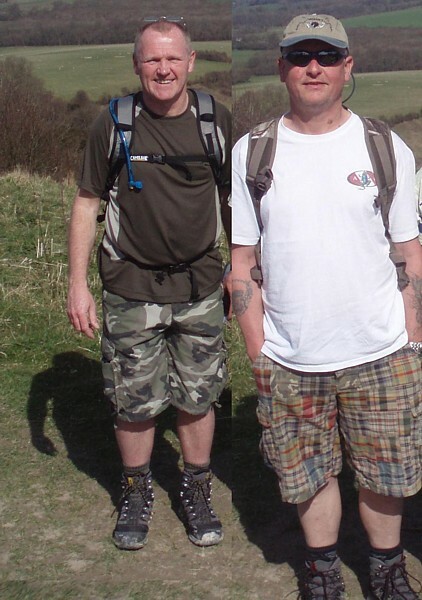 Anyone who wishes to do so, can help support us in our quest by donating online at: www.bmycharity.com/twatsC2CWalk All donations will be very gratefully received and we thank you for your support. 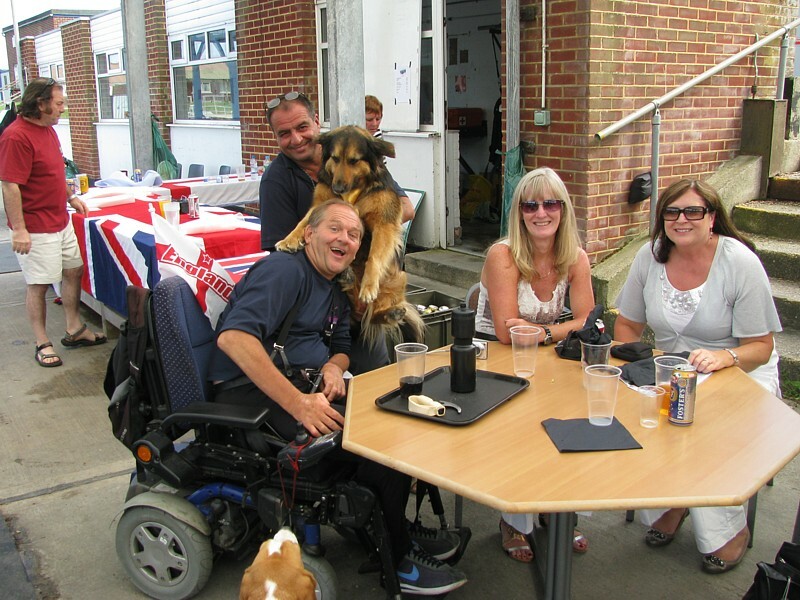 29 EOD & Search Group are organising a “Golf Day and Dinner“ charity event in aid of the worthy cause the British Limbless Ex-Service Men Association (BLESMA). This charity continues to support more injured service men and women as a result of the Improvised Explosive Device (IED). 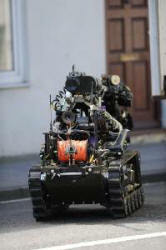 29 EOD and Search Group contribute operators directly to the location and making safe of these devices; an area of work that unfortunately contributes to the members of BLESMA. Please give this invite the widest dissemination as possible within your organisations and others that may wish to support. Your feedback and returns would be appreciated as soon as possible. HQ 29 EOD & Search Group"
All MCDOA members are welcome to participate. "Summer is nearly here and, as the great space heater in the sky gets closer, our thoughts turn to heading outdoors to gather with friends and colleagues to enjoy some fine fare, accompanied by a cool glass of amber nectar. Thankfully the perfect opportunity is again at hand with our combined Annual BBQ and Summer Social on Sunday 13th June at Horsea Island. 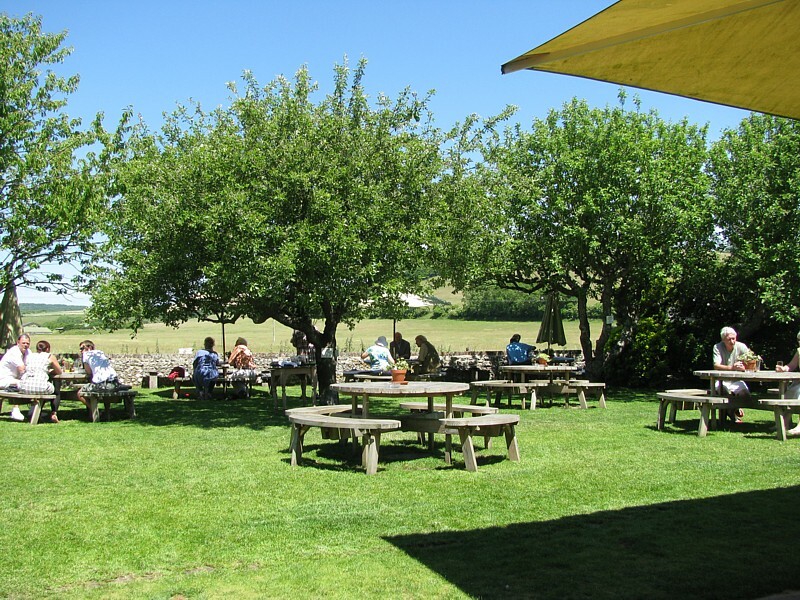 The intention is to enjoy another informal outdoor family-orientated afternoon/evening which, in addition to a good old fashioned barbeque with accompanying refreshments, will again include live music from the Zodions '60s and '70s revival band, a tombola, traditional mess horse-racing (for children - big & small) and, of course, the chance to meet-up with old friends and their families. Dress will be casual and there will be a prize for the ‘best’ t-shirt, as judged by SofD. Car parking will be available in the car park adjacent to the Training Area at the southern end of the lake. All this will be yours for the excellent price of only £10 per head, inclusive of the first drink; so come along, in your t-shirt, and have a great afternoon in the knowledge that you will also be supporting an excellent cause, with all profits raised on the day going toward the Project Vernon monument. To make sure that you don’t miss out on this once a year opportunity please contact myself, or Lt Cdr Richard Watson RN (Mil: 9383241456/Civ: 02392 224145/Email: soapy @ rsba.karoo.co.uk) at Fleet Diving Headquarters for tickets, or complete and return this proforma by 1000 on Thursday 10 June. I am a member of a Royal Navy team of mountaineers which, between us, has a combined age of 304 years and a total of 167 years service. 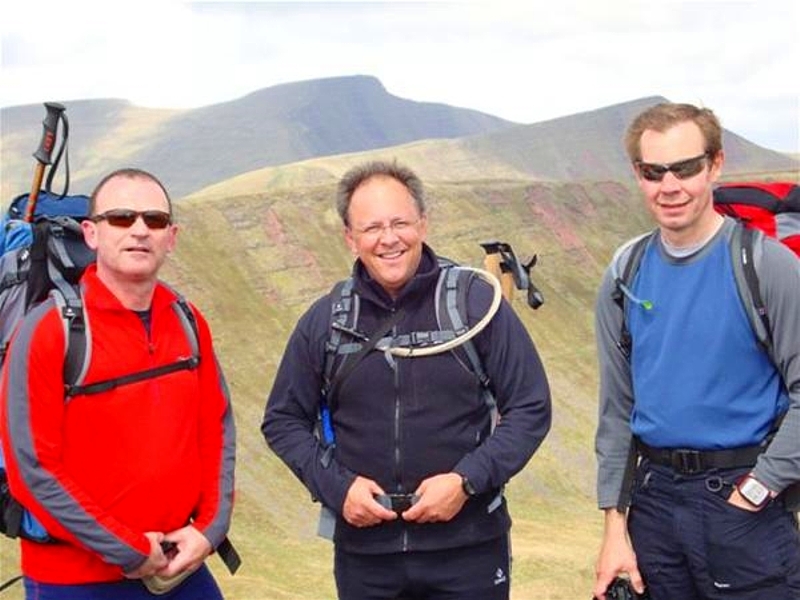 Not unsurprisingly we have called ourselves the ‘Salty Old Seadogs’ to reflect our ages and are currently preparing to undertake one of the UK’s toughest charity mountain events, the 24 Peaks Challenge, over the weekend 17-18 July 2010. To do this challenge we are trying to raise money for the Seafarers UK charity. You may not have heard of this charity, but it is the new name for what was once the King George’s Fund for Sailors. 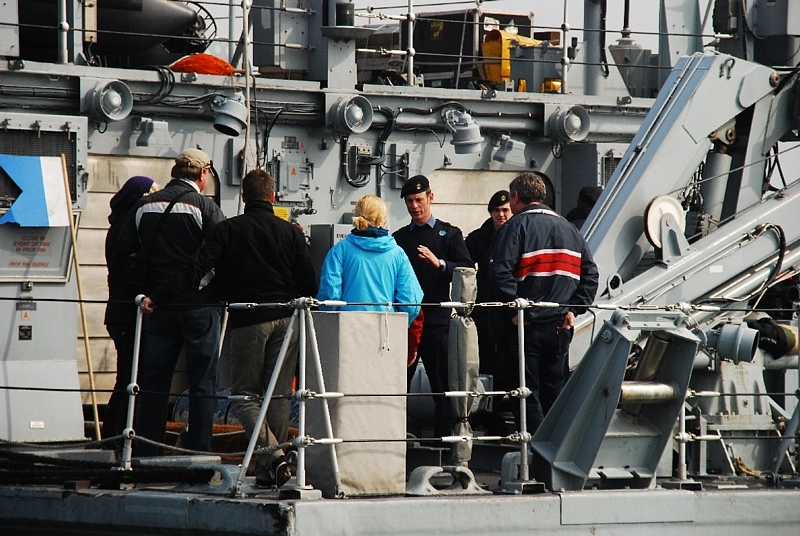 Seafarers UK provides support to a vast range of people from the Royal Navy, Royal Marines, Merchant Navy, fishing fleets and their dependants. 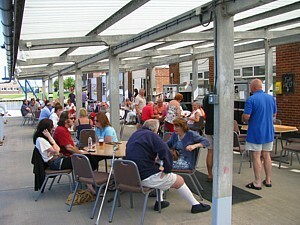 It is also an umbrella organisation that awards grants to other charities. It helps seafarers and their families cope with homelessness, poverty, debt, bereavement and serious injury, providing support to all ages from young maritime trainees to veterans of past conflicts. The call for the support they provide increases year on year and thus they need our assistance to raise funds to support those desperately in need of help. The Salty Old Seadogs support Seafarers UK and hope that you will too. We are trying to reach a target of £5,000 and we will be extremely grateful if you could sponsor us for this challenge by donating whatever you can either on line at our site: www.justgiving.com/saltyoldseadogs or by writing out a cheque made payable to: Mr M C Mackey and posting it to my home address: 1 Cosham Park Avenue, Cosham, Portsmouth, PO6 3BG. Whilst we may be going over the mountains, we are certainly not over the hill, but when we are we know that Seafarers UK will make every effort to support us and our families. This is why we, the Salty Old Sea Dogs, are putting ourselves through this tough challenge and hope that you will support us in our quest. I trust that members will give Martin and the rest of his team (Tony Quirk, Steve Sugden, Richard Pethybridge, Si Parsons, David Grindel and David Fearon) the generous support they deserve. "Ian Young. Died peacefully on 27th April. Funeral 14th May, 2.30 p.m. Portchester Crematorium. Family Flowers only. Donations to the Rowans Hospice, Purbrook." No other information or addresses are given. I don't have Ian's CV but can confirm that he had several years at RNPL [Royal Naval Physiological Laboratory] and, later, INM [Institute of Naval Medicine]. His previous affiliation was aviation and I know that he retired to that industry upon retirement. He worked at RNPL for several years on acute oxygen toxicity and the CD branch would have appreciated that, because they have a similar problem when breathing O2 (but not to fight a fire in a compressed-air tunnel!). He had not divers but the local firemen as his volunteer subjects. On one occasion he came with me to help cover an AEDU [Admiralty Experimental Diving Unit] diving trial in HMS Reclaim in Gibraltar, perhaps the one that included a memorable visit to Tangier with Peter Messervy in command. At Alverstoke, he was also on-call for Vernon's recompression incidents but then he left us to meet the medical branch's requirements for postgraduate training. Our paths rarely crossed after that and I regret that I don't have his CV. One could try the editor of the Journal of the RN Medical Service. 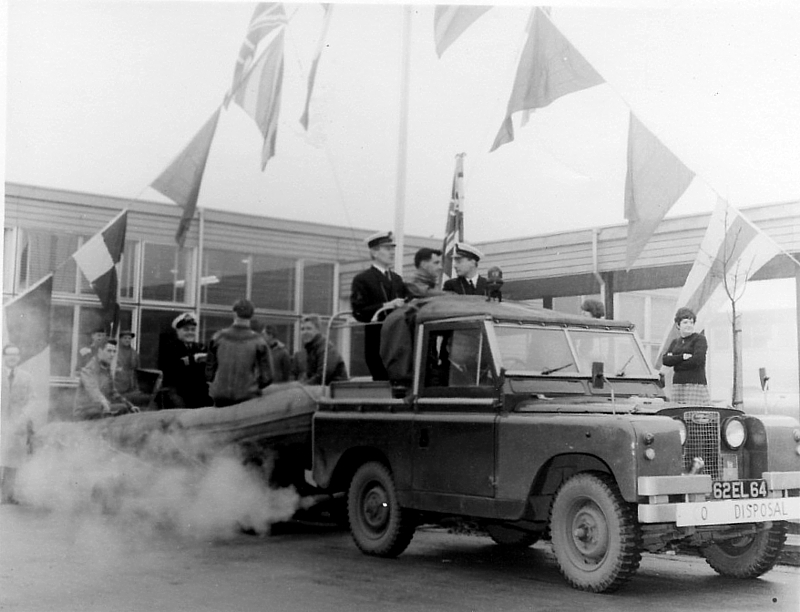 'Uncle Bill' Filer remembers Ian Young well from his time at RNPL and INM during the 1960s. Our condolences to his family and friends. Martyn also mentioned that he had met Dave Hosking's sister and Eddie 'Scouse' Kerr's new father-in-law. Promotion organiser Dixie Dean reports that sales of merchandise, raffle tickets and straight donations raised a total of £974.28 for Project Vernon after clearing expenses. Well done and thanks to everyone concerned. A special thank you to the French Horizon Class destroyer FS Forbin which donated £48.41 over and above this sum at the end of her five-day visit to Portsmouth. Members of her ship's company had spotted our promotion and organised a collection of 'shrapnel', the proceeds of which were kindly delivered by her Supply Officer, Lt Adrien Proal FN. 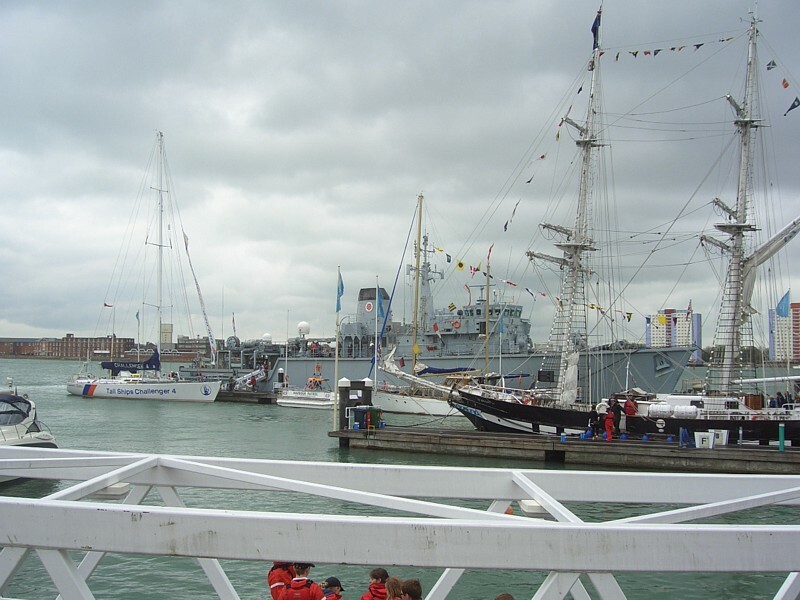 Sadly, the 150th Anniversary Sea Cadet Festival, also held at Gunwharf Quays last weekend, was marred by the death of one of the cadets who fell from the rigging of TS Royalist in Stokes Bay on Sunday night as reported in this article in the Portsmouth News. Captain Colin Welborn RN, our Honorary President, is Captain Youth and Cadets for the Sea Cadets organisation. Perhaps he would pass on our sincere condolences to 14 year-old Jonathan Martin's family for us. It is intended repeating the Project Vernon promotion during the August Bank Holiday (30 Jul - 1 Aug) to coincide with Portsmouth Navy Days. Members of Southern Diving Unit 2 (SDU2) will be demonstrating their skills in a display tank so bring plenty of fish. Tony Groom has very generously donated a number of copies of 'Diver' with an accompanying DVD to be sold to raise funds for the Vernon Monument Project. 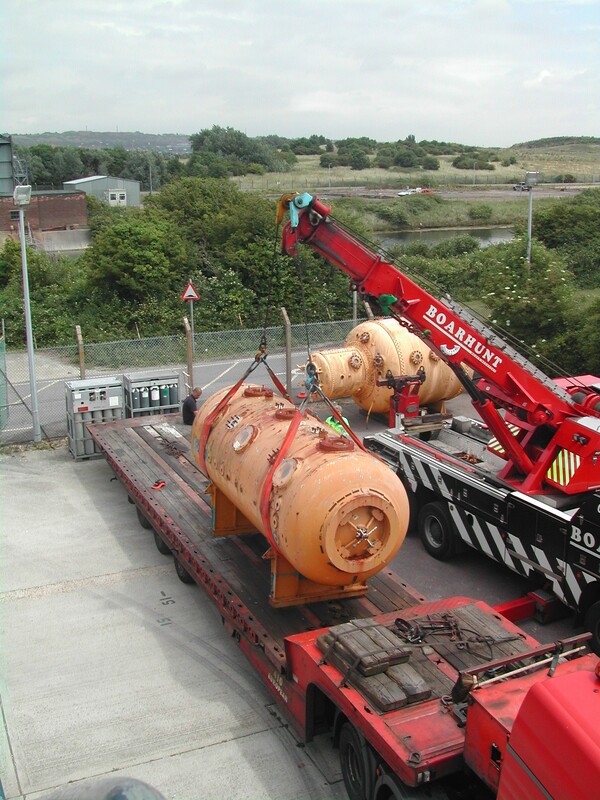 The BBC News website contains this article describing the disposal of a piece of "historic ordnance" by Faslane-based Northern Diving Group (NDG) off Campbeltown today. Today's Portmouth News contains this article following up yesterday's story about a call-out for Southern Diving Unit 2 (SDU2) in Southsea. This incident is reminiscent of these events reported in the Daily Telegraph in November 2002, which could explain the extra caution shown by the police. 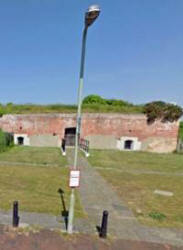 Today's Portmouth News contains this article describing a call-out for Southern Diving Unit 2 (SDU2) in Southsea. HMS Walney and her ship’s company of MCM1 Crew 1 have been continuing their commitments as part of Standing NATO Mine Counter Measure Group One (SNMCMG1). 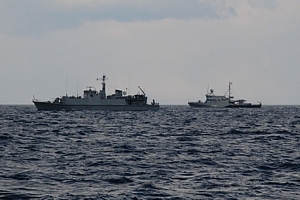 Since leaving Warnemunde, Germany the ship’s company has maintained their high readiness state, through constant exercises with the rest of SNMCMG1. After an extended visit to Warnemunde (a little longer than anticipated to conduct some repairs on the sonar), Walney sailed to rejoin SNMCMG1, and was greeted with an air defence exercise on arrival. 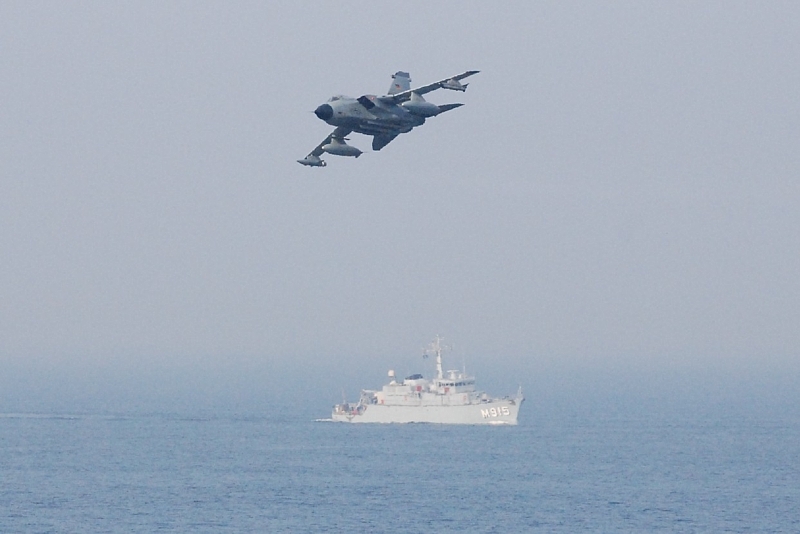 Two German Air Force Tornados kindly offered to simulate an attack, which required careful co-ordination between the force, supplemented by two German Fast Patrol Boats who assisted with their air search radars. As part of SNMCMG1, the ship’s company has taken the opportunity to experience life onboard the other ships within the group. 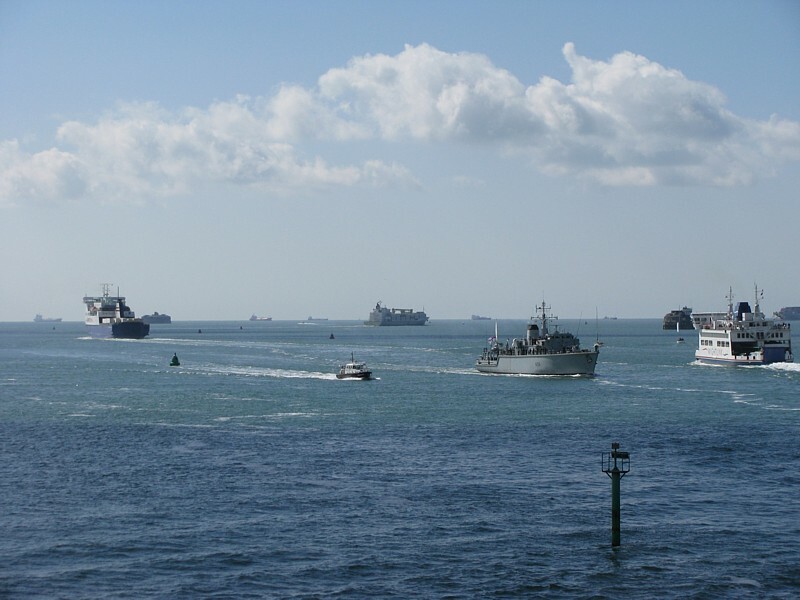 Daily ‘crosspols’ (where sailors are boat transferred to another ship for the day) with the Polish Flag Ship Orp Kont Admiral Czernicki, the Dutch ship HMNLS Middelburg, the Belgian ship BNS Aster and the German ship FGS Passau have been a resounding success. The ‘crosspols’ have been both interesting and rewarding in allowing members of the ship’s company to spend the day at sea on a different ship. This has further underlined the close cooperation and teamwork that is at the core of this NATO fleet. 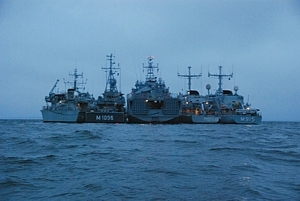 Before sailing to conduct MCM Operations in a German Exercise area, all four MCMVs rafted up to Czernicki, who hosted a BBQ on her flight deck. Although a little chilly, the event was a perfect respite in between exercises. It was a momentous day when HMS Walney sailed into Sassnitz, a small German fishing port that was once home to the Russian Navy before the end of the Cold War and has not been visited by a Royal Navy warship in fifty years. 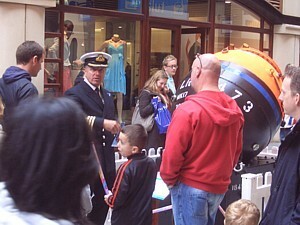 During the weekend stay, SNMCMG1 hosted a ‘ship open to visitors’ event. Although the weather was by no means perfect over 1400 people crossed Walney’s gangway to meet the ship’s company and catch a glimpse of the life onboard a Royal Navy warship. The entire weekend was a complete success, with the ship’s company also able to enjoy a relaxing Easter weekend in a pleasant, albeit quiet, German town. One of the more taxing episodes on this deployment has probably been the weekend involving two transits of the Kiel Canal within a 72 hour period. 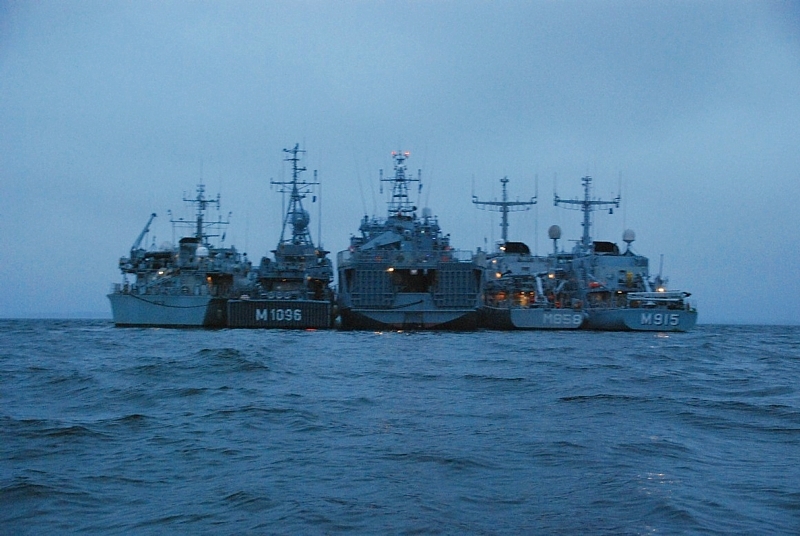 After departing Sassnitz SNMCMG1 made their way west through the Baltic Sea and the Kiel Canal into the North Sea for briefings at the German Naval Base in Wilhelmshaven near Bremen in preparation for the “Brilliant Mariner” exercise. After receiving some fresh provisions and now fully up to speed with the details of the forthcoming exercise, Walney once more headed back to the Baltic. 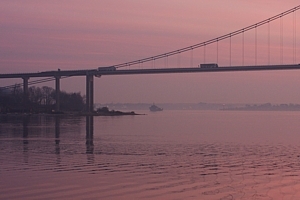 The canal is approached from the Elbe estuary, a constrained stretch of waterway heading to the German city of Hamburg. The canal itself is 53.5nm long and requires particular care and attention for the eight hour transit with the canal only 115 metres wide and with continuous traffic transiting both east and westbound. Walney exited the Kiel Canal mid morning, and commenced a short three-hour transit to the German Naval Port of Eckernforde for further briefings, this time to assess the Mine Counter Measures detail of the Brilliant Mariner exercise and to meet our Danish, French, Swedish and Norwegian counterparts who will join SNMCMG1 for the Mine Warfare aspects of the exercise. On sailing for Eckernfoerde, HMS Walney assumes her place within a task unit, dedicated to protecting the sea-lanes within the fictitious lands of Ger’mark and Tytan from the power hungry Stellaria, as part of the Brilliant Mariner exercise. This exercise involved 11 nations, 33 ships, 4 submarines and 40 aircraft, although due to the unforeseen volcanic events in Iceland the aircraft were grounded for the later part of the exercise. Walney’s tasking initially involved clearing areas around the Great Belt, and with all mines placed in Walney’s allocated area found, the Faslane-based minehunter moved into the Northern Kattegat to conduct further tasking off Fredrickshavn. There was also time before the transit north for Walney to conduct a live demolition on a ground mine, and although the weather hampered initial proceedings, the mine was detonated to the delight of Able Seaman (Diver) ‘Sticky’ Cunningham who had the pleasure of fitting the charges. The latter part of the exercise involved clearing mines and defending the ship from fast patrol boats acting as ‘Stellarian’ aggressors! On completion of Brilliant Mariner 2010, Walney made the short transit south to the Danish City of Aalborg and some well deserved rest after what has been a very busy April to date. Venerable 92 year-old MCDOA member 'Uncle Bill' Filer MBE GM invited a few friends to join him for lunch today including your humble webmaster. His other guests were fellow MCDOA member Morty Drummond, the late MCDOA member Jackie Warner MBE DSC's daughter Claire Harris, and her partner's mother Maggie. We started off with a drink in the Lee-on-the-Solent Sailing Club and then decamped to the Lee-on-the-Solent Tennis Club where we enjoyed a convivial meal. Bill is a popular stalwart of both institutions. Thanks for a lovely spur-of-the-moment occasion, Bill. The MCDOA's 'Not Quite the Last of the Summer Wine' trio of Doug Barlow, Martyn Holloway and Rob Hoole was back afloat yesterday for its first foray of the season. 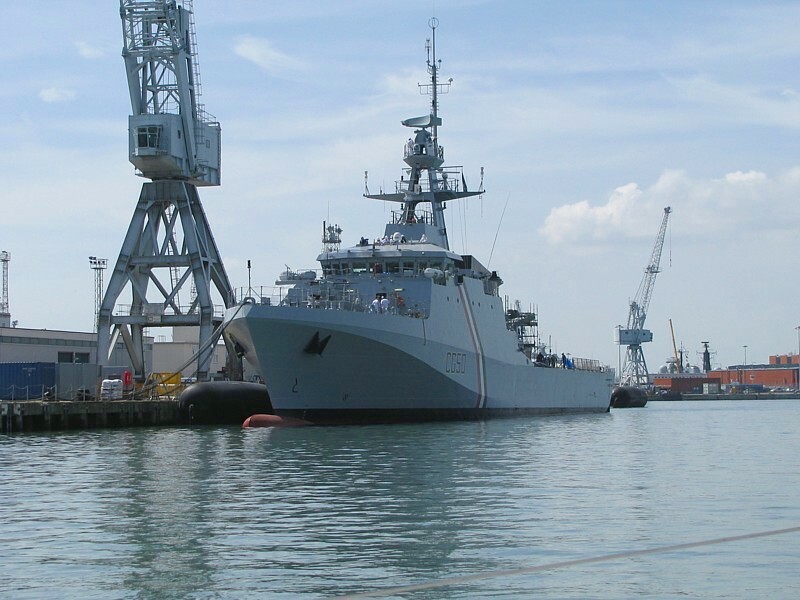 During our leisurely sail down harbour from Whale Island to Hornet Sailing Club in Haslar Creek, we passed the new Trinidad & Tobago Coast Guard vessel 'Port of Spain', built at Portsmouth by BAe Systems and launched on 18 November 2009. In accordance with longstanding tradition, I called MCDOA former Chairman Dave Hilton as we passed the Semaphore Tower and he leaned out of his window to wave us on our way (I think that's what he was doing). Despite the light airs, a strong spring ebb tide was running and 'Dougout', resplendent in her new paint and varnish, delivered us fairly swiftly to the former MTB base where we secured alongside an old gaffer undergoing restoration. At Hornet, we enjoyed a pleasant meal in the club house and noticed that MCDOA member Geoff Goodwin's name appears in gold leaf on one of the display boards as the club's current Vice Commodore. 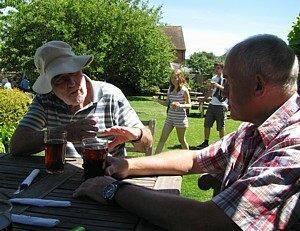 We also chanced to meet Derek Parkinson, another old friend from Vernon days. 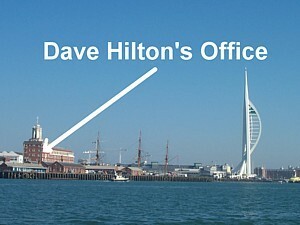 He was an establishment engineer officer when HMS Vernon was still an independent command and re-appeared as the OIC of the site when it was HMS Nelson (Gunwharf), shortly before closing its gates for the last time in 1996. After sharing a meal with us, he showed us his own impressive yacht in its cradle and then joined us for cofee back on board 'Dougout'. Our return to Whale Island was uneventful although we had to resort to the 'donk' owing to the absence of wind and the still-ebbing tide. 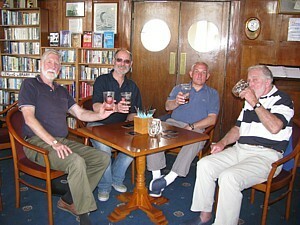 Watch this space for further summer exploits of the MCDOA's 'Three Men in a Boat' a.k.a. 'Gentlemen Who Lunch'. 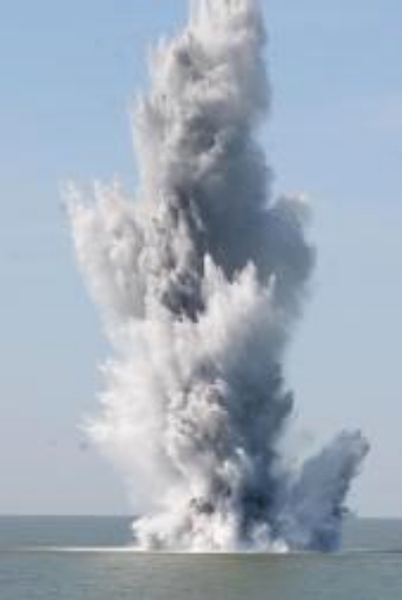 Today's Portsmouth News contains this article describing two EOD incidents tackled at Eastney and on Hayling Island yesterday by Portsmouth-based Southern Diving Unit 2 (SDU2). 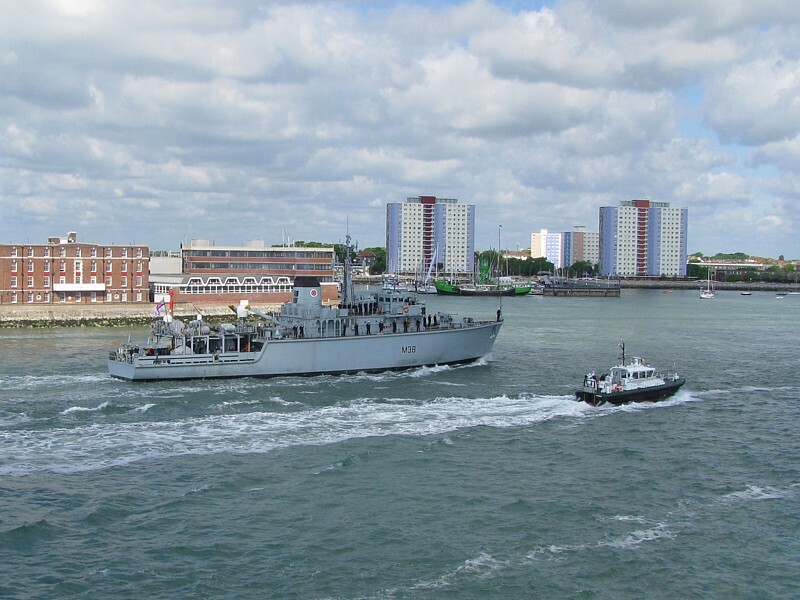 Today's Portsmouth News contains this article describing Friday's disposal of a mine off Margate by Portsmouth-based Southern Diving Unit 2 (SDU2) in conjunction with the offshore patrol vessel, HMS Mersey (see entry for 24 Apr 10). The Navy News website contains this article describing the recent operations of HMS Atherstone and HMS Chiddingfold in the Gulf. Also see entry for 30 Mar 10 in News Archive 29. My name is Dickie Barrett. Qualified CD2 on course DCD 64, February 1969. I am sure, with all the old members that read this website, the grey matter will come up trumps. 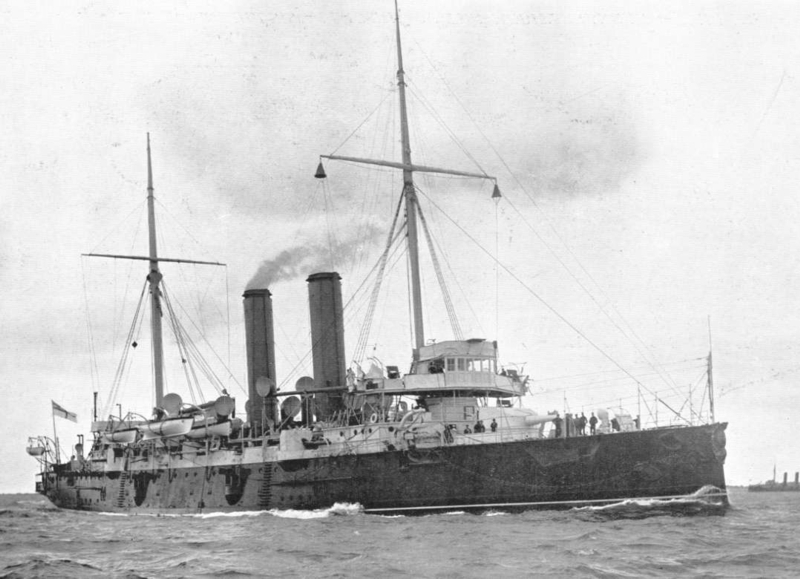 The most likely ship called HMS St George was a steel copper-sheathed 1st class cruiser of 7,700 tons laid down at Earle, Hull in April 1890 and completed in October 1894. She was commissioned at Portsmouth in October 1894 as the flagship of the Commander-in-Chief of the Cape of Good Hope and West Africa Stations and wore the flag of Rear Admiral Harry H. Rawson C.B. 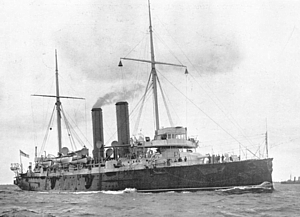 She then served as Boys Training Ship in the 4th Cruiser Squadron until May 1906 when she entered reserve at Devonport. In 1909, HMS St George was converted at Chatham and re-commissioned as a depot ship for the 3rd Destroyer Squadron at the Nore in March 1910. In June 1910 she suffered some damage after grounding off Sheerness. She then served with the 6th destroyer Flotilla 1912 - 1913 and then the 9th Destroyer Flotilla 1913 - 1914 based variously at Chatham, in the Firth of Forth and at Immingham. During the early months of the First World War she served as part of the Humber Patrol. In 1917, she was converted to support submarines and accompanied the 2nd Submarine Flotilla to Mudros, Corfu and Salonika in the Aegean until July 1919. She paid off on her return to the UK and was scrapped in July 1920. 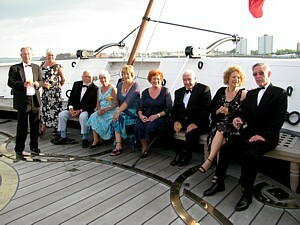 The photo certainly looks as though it could have been taken on the quarterdeck of this ship. If anyone can shed any further light, please e-mail me via my webmaster address. I would put it somewhere around 1900. The helmets are 12-bolts so it has to be pre-1905-ish, when the 6-bolt helmet was introduced. The kit looks unused, so it could be 1894-1900. Congratulations to the Faslane-based minehunter HMS Ramsey on being granted 'Freedom of Entry' to Ramsey in the Isle of Man yesterday as described in this article on the BBC website and this article on the Manx Radio website. 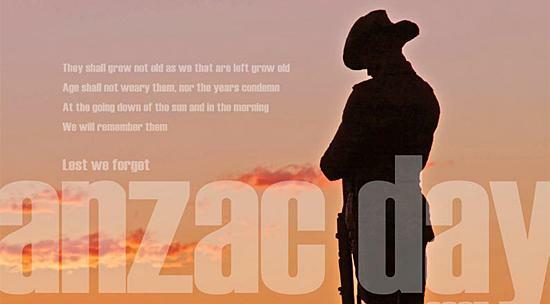 Our warm respects to all our Aussie and Kiwi friends on this, their special day. The Allied Gallipoli casualties included 21,255 from the UK, an estimated 10,000 dead soldiers from France, 8,709 from Australia, 2,721 from New Zealand, and 1,358 from British India. News of the landing at Gallipoli made a profound impact on Australians and New Zealanders at home and 25 April quickly became the day on which they remembered the sacrifice of those who had died in war. 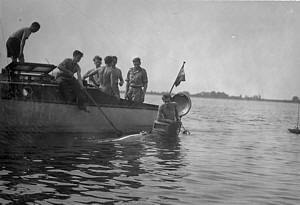 Nor should we forget the men in the minesweepers who braved heavy artillery, searchlights and mines while attempting to force a passage through the narrow Dardanelles during the same campaign. This operation was conducted by slow and unwieldy trawlers with inexperienced civilian crews owing to a lack of fleet minesweepers. The trawlers came under fire from forts that had not been destroyed, which greatly hindered their progress with what was already a difficult job of sweeping against the current. Churchill became impatient and on 13 March 1915, he complained, "I do not understand why minesweeping should be interfered with by fire which causes no casualties. Two or three hundred casualties would be a moderate price to pay for sweeping as far as the Narrows... This work has to be done whatever the loss of life and small craft and the sooner it is done the better." Postscript: See how RAN CDs marked the occasion this year here. 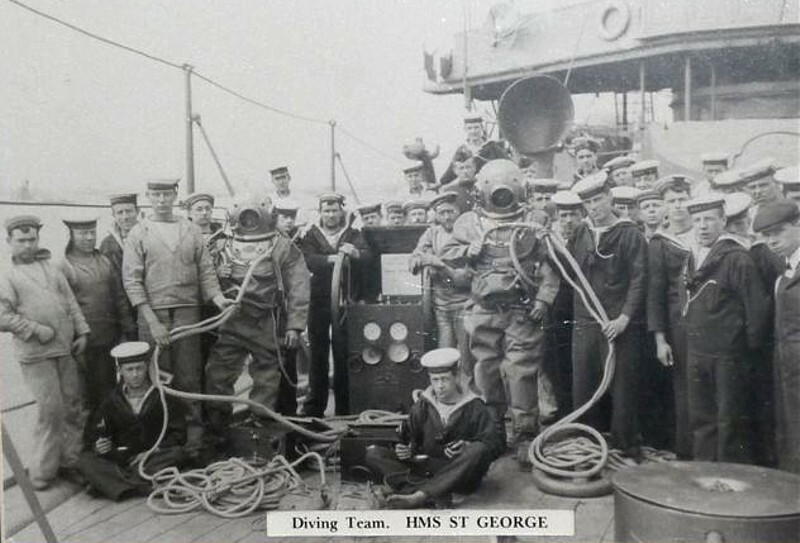 The 'This is Kent' website contains this article describing yesterday's disposal of a German wartime mine off Ramsgate by Portsmouth-based Southern Diving Unit 2 (SDU2) in conjunction with the offshore patrol vessel, HMS Mersey. Don't forget to visit the Project Vernon stand at the Sea Cadet Festival 2010 at Gunwharf Quays in Portsmouth over the weekend of 1 & 2 May as described in the entry for 13 Apr 10. 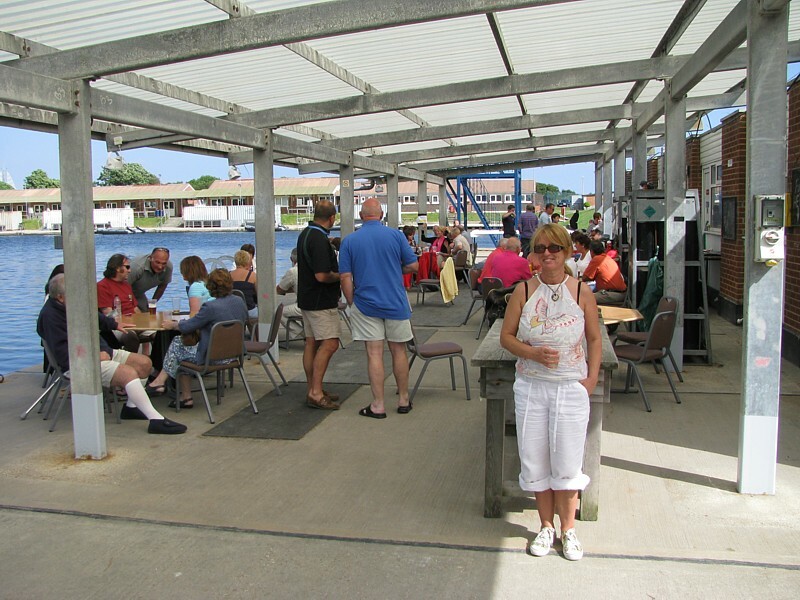 Time is running out to reserve places at this year's MCDOA Ladies Night to be held at Hornet Sailing Club (HSC) on Saturday 8 May. Download the calling notice and booking form via the 'Forthcoming Events' page. MCDOA members are also welcome to attend the RE Bomb Disposal Officers' Club (REBDOC) 70th Anniversary Spring Lunch at Catford on Saturday 15 May. Download the calling notice and booking form via the 'Forthcoming Events' page. Although this year's Northern Dinner at Faslane has been cancelled owing to unavoidable circumstances (see below), our main Annual Dinner at HMS Excellent on Friday 19 November is very much on track. I am delighted to announce that Paul Jones, our Chairman, has managed to secure Major General Garry Robison RM as our Guest of Honour. As Chief of Staff (Capability), General Robison is responsible within the Navy Command Headquarters for RN and RM force and capability generation. 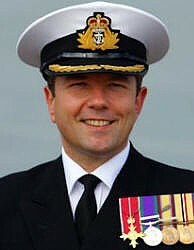 He was Commandant General Royal Marines (CGRM) & Commander UK Amphibious Forces (COMUKAMPHIBFOR) from 2006 to 2009. His impressive CV is available here. As is our custom, we will dine out MCDOA members leaving the Service; please advise Tony Griffiths, our Honorary Secretary, if you qualify and wish to attend. We will also mark the 25th anniversary of the appropriate MCD courses. The relevant courses this year are LMCDO '85A (Course Officer: Steve Field; Course Instructor: Buster 'Heart Attack' Brown; Students: John Bainbridge, Adrian Cassar, David Griffiths, Mike Leaney, Tom Russell and Alan Trevarthen) and LMCDO '85B (Course Officer: Steve Field; Course Instructor: Buster 'Heart Attack' Brown; Students: Angus Crampton-Smith, Stuart Hayes, Andy Johnstone-Burt, Graham Landrock and Mark Warlow). Further details will be announced in due course. Check the 'Forthcoming Events' page for news of this and other functions. Bad news I am afraid. 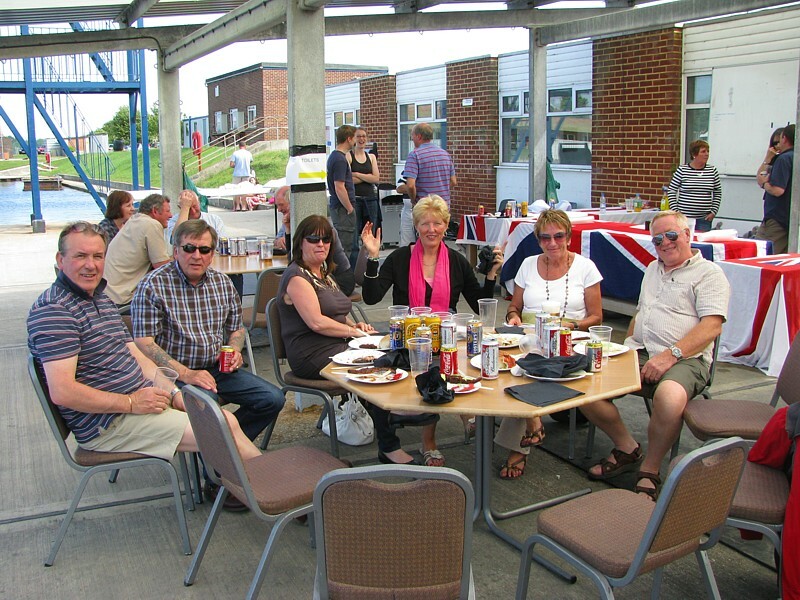 The mess in Neptune can no longer support our planned dinner owing to the recent new build of the wardroom and issues they are having with boring problems like PAYD. 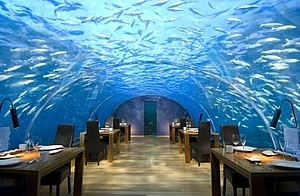 They have offered to look further ahead for us but, in all honesty, with summer leave and other factors we have decided to cancel and look to next year's dinner instead. We are very sorry it has come to this but hope to make next year's dinner a night to remember! Thanks for trying, Matt. Better luck next year. Around 250 people attended the service of thanksgiving for the life of MCDOA associate member Cliff Hares at St Mary's church in Alverstoke today (see entry for 9 Apr 10). Apart from family, friends, work colleagues and business associates, attendees included members of the RN and former RNSS diving community such as Gavin Anthony, Dr John Bevan and his wife Ann, Roger Davies, Mick Fellows, Stu Harper, Nick Harrington (actually Army), Martyn Holloway, Yours Truly (Rob Hoole), Martin Jenrick, MCDOA Chairman and RN Superintendent of Diving Cdr Paul Jones in uniform (nice one Jonesy! 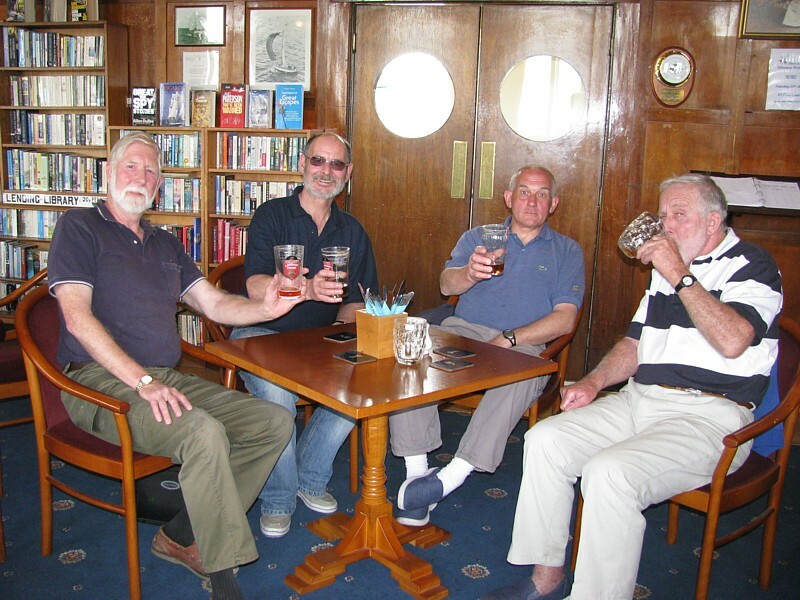 ), Steve Marshall, Stew 'George' Sissons, Stan Standley and John Towse as well as members of the Historical Diving Society and Southsea Sub Aqua Club, several of whom were involved in the excavation and recovery of the Mary Rose. The service was conducted by Canon Ted Goodyer, the Rector of St Mary's, and commenced with his welcome address after the casket had been borne to the altar. The congregation then sang 'Abide with Me' with organ accompaniment provided by Paul Pilott. Cliff's eldest son Alan, also an associate member of the MCDOA, then gave a moving tribute which included several amusing anecdotes about his father. He revealed that Cliff had been an RAF National Serviceman for two years in West Kirby before becoming a salesman. 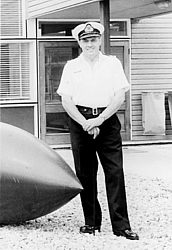 On the early death of his second son, Cliff was spurred to establish his own diving business, initially making wet suits and filling air tanks from a compressor in his garden shed. 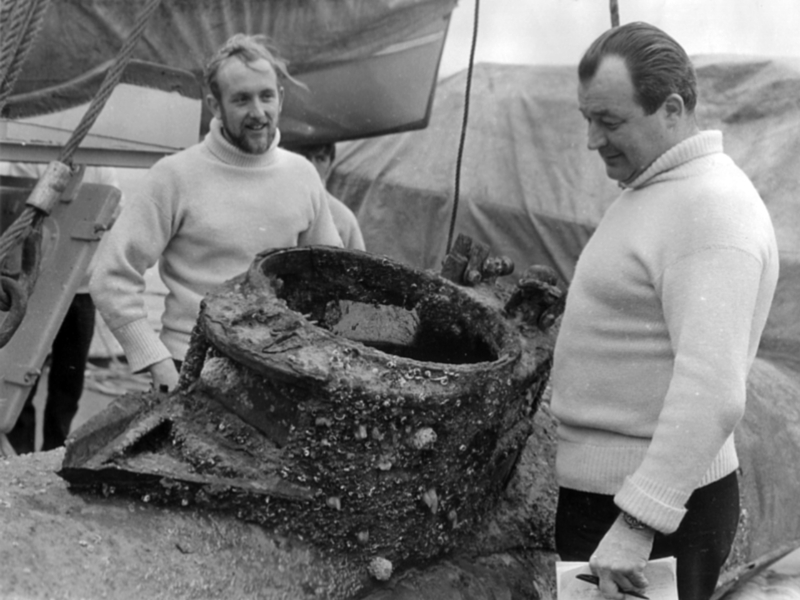 This eventually led to him founding Solent Divers in Portsmouth, winning many contracts for diving kit for the Royal Navy and catering for commercial and recreational divers' needs. Alan went on to relate that Cliff remained an avid diver into his early 50s and enjoyed diving during family holidays in Cornwall and at Weymouth where he was prone to surface with a lobster in each hand before anyone else had even donned their diving gear. He later helped rehabilitate the disabled with hydrotherapy sessions. 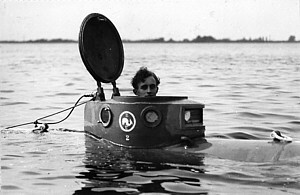 Alan recalled several examples of Cliff's impish humour including the time he had two members of the West Midlands Police Underwater Search Team 'arrest' Alan and drive him to a remote spot for 'questioning'. Alan emphasised Cliff's indomitable spirit, his dedication to his work, his care for his staff and his devotion to his family and friends. Cliff carried on working right to the end and passed Alan the only hint that he was ailing when he rang him on Maundy Thursday to say that he was leaving the shop early because he felt tired. He died on Good Friday. The congregation then listened to an organ recital of 'Danny Boy' before Canon Goodyer gave the reading ('In my house are many dwellings' which he likened to bus stops rather than residences) and the address. This was followed by the congregation singing 'Morning has Broken' and prayers. Cliff's youngest son Paul then read 'The Diver's Prayer'. The final hymn was 'Jerusalem' after which Canon Goodyer uttered the Commendation. Cpl Bugler Jim Christopher, shortly to join the RM Band Portsmouth from instructing at the RM School of Music, then gave a robust and note perfect rendition of 'The Last Post' which was followed by a minute's silence before he sounded 'Reveille'. Like many others, I complimented him after the service and was introduced to his wife Emma. The casket was borne out of the church for a cremation at Portchester attended by family members before the rest of the congragation left to the sound of 'Nimrod' from Elgar's 'Enigma Variations'. 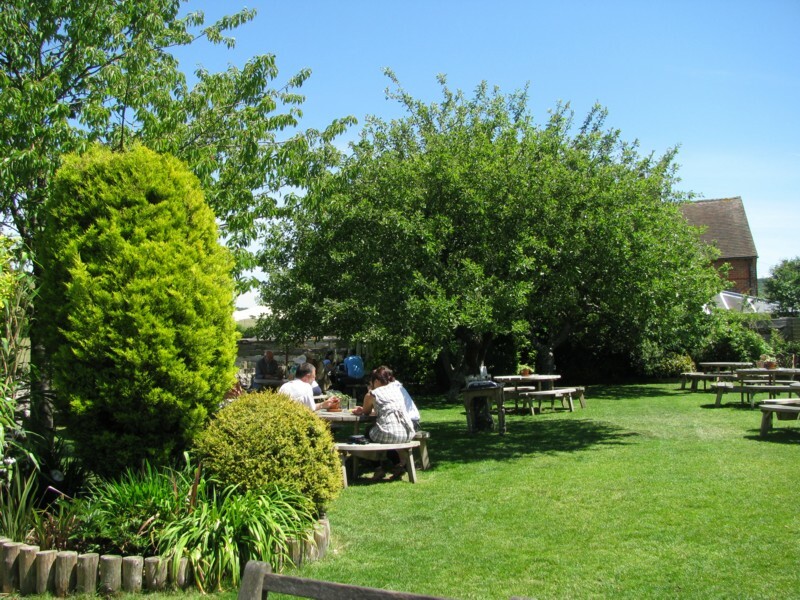 Many of us went on to the Cormorant in Portchester where I took the opportunity to pass our condolences to Cliff's brothers Dai and Victor, his widow Val and their sons Alan, Neil and Paul, and their respective families. "The pic you have on record of Jimmy Holmes in a Welman is my Dad! I have an album of other pics that could be scanned and sent on. I have several pics of life at Station IX of the Special Operations Executive (SOE) at the comandeered Frythe Hotel. Who was Jean Maitland, either at The Frythe or at Scapa Flow .. a friend of Lt Col John Dolphin Royal Engineers designer of the Welman? Is Dolphin alive or any of his descendants accessible? 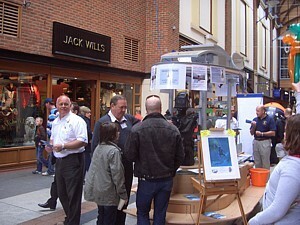 James was referring to the photo in the second entry for 7 Mar 09 in ‘News Archive 25’ of the MCDOA website. It shows Lt James Francis Lind Holmes RN who, according to the London Gazette of 18 April 1944 (Page 1777), was awarded the DSC "for bravery and resource in a hazardous operation", i.e. Operation BARBARA, the attack on shipping and the huge Lakesvaag floating dock at Bergen in Norway in November 1943. Thank you for your e-mail. I would appreciate any other photos with a view to putting some on the website. I have forwarded this to Mike Jones who, as mentioned in the MCDOA website article, has been researching a book about the Welmans. Perhaps he can answer some of your questions. I have gotten to the bottom of what my dad actually did in Welmans. It's well written up here in Wikipedia. 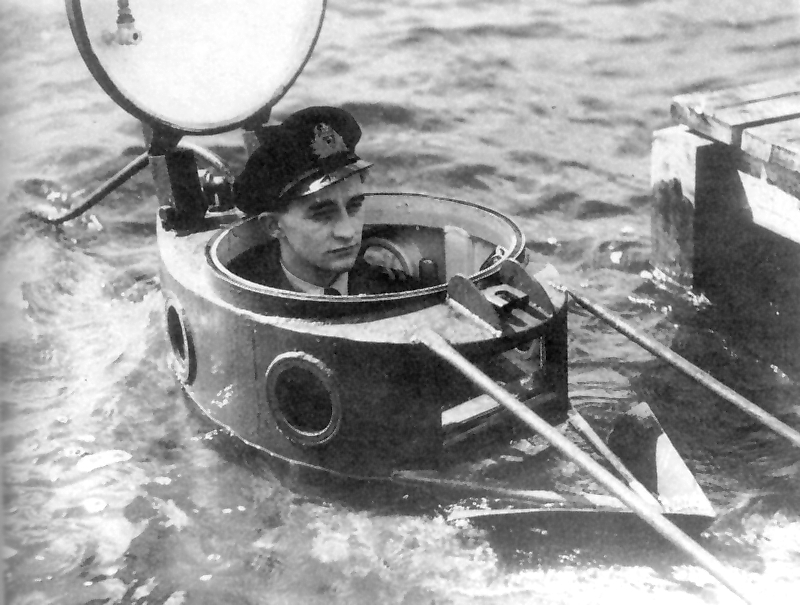 I have established a Facebook group for "X-Craft, Welman Submersibles, Sleeping Beauties, Chariots of WW2" and posted a few photos, including some of Marris, Holmes, Pedersen and Johnsen and others "chilling". Can your mate confirm the pic of Major Dolphin? Thank you Rob for forwarding this email to me. 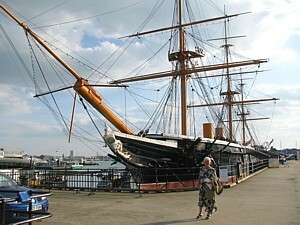 I have yet to visit the National Maritime Museum (NMM) and see it. If I get a copy of it, would you be interested? I'm unaware of any family members; I'm sure there must be some around. If you like, with your permission I can apply and try to get it released under the Freedom of Information Act. I have managed to get two other personnel files released so it shouldn't be a problem. If and when they get released, I can get them copied for you when I'm next at Kew and send them to you. I may already be telling you something you already know, but I take it that you are aware of your fathers involvement with the only operation that ever took place involving the Welman? It was to attack the shipping in Bergen Harbour in Norway. Unfortunately, the operation wasn't successful and your father along with the others scuttled their Welmans and spent over two months evading capture before being 'rescued'. One of the Welman operators, Lt Pedersen, was captured and the Germans took his Welman to Berlin for analysis. I can send you copies on what I have so far and can copy the others on my next visit. I have a copy of an account that your father wrote about the attack and an account from the others that went on the run with your father during their escape. I take it that you are also aware that the Welman on display in the Marinemuséet in Oslo, Norway (see Rob's web page for photos) is W48, the craft your father used for the attack and, if I'm led to believe correctly, it was raised from the harbour in about 1970. I also take it that you know your father went to train the Services Reconnaissance Department (SRD) in Australia? I would be very grateful if you would be kind enough to send me a copy of the scanned photos you have of Station IX, SOE The Frythe. This is obviously an area that I'm interested in and I can compare them to the ones I have and see if you don't have some that I do. The photos of your father in the Welman were taken here and the metal rails that can be seen in other photos of the Welman being lowered into the reservoir, are still there. Look here for some nice high resolution 'location shots' of the Faslane-based Sandown Class minehunter HMS Shoreham entering Liverpool yesterday. MCDOA member Bob Hawkins was recently in Cyprus overseeing the transfer of HMS Dasher and HMS Pursuer from Cyprus to Faslane - more on that at a later date. He was lucky enough to meet up with the Red Arrows display team at RAF Akrotiri and enjoyed a few socials in the mess with them. 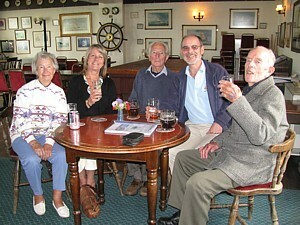 On discovering that they were spending a few days with their wives and girlfriends in Kyrenia and, by coincidence, Bob Hawkins was due to spend a few days with MCDOA Chairman Paul Jones and his wife Yvonne at their holiday villa in the same place, the RN/RAF combo got together and had a great dinner (it was actually to celebrate one of the RAF wives' birthday) and a (very) late night ensued in Kyrenia Town. Hawkins and Jones wish the 'Reds' all the very best for the season ahead (particularly 'Planky', 'Monty', 'Horse' (don't ask) and Andy). with Jones (SOD Leader) fifth from the left. making sure the Red Arrows listen to his dits and can't escape. 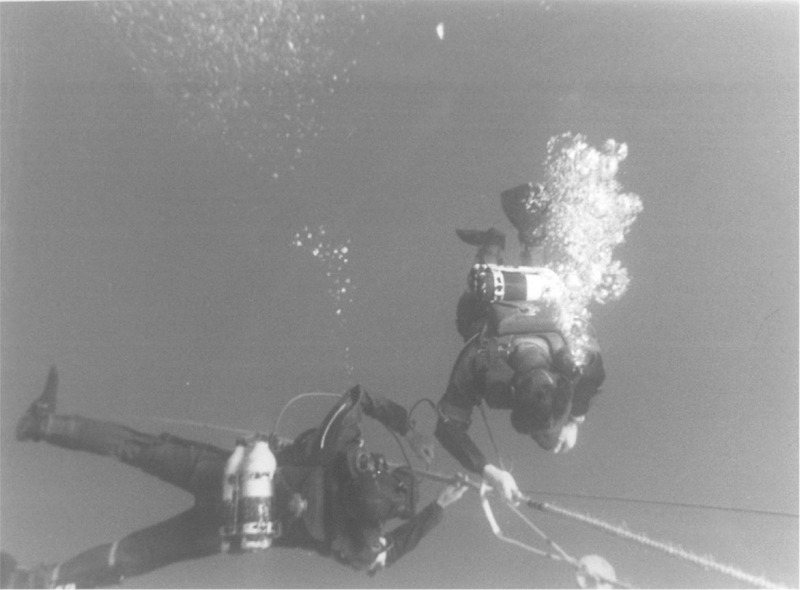 There was a time when the Plymouth CD Team (PCDT) practiced its flyaway capability as back-up to the Fleet Team by conducting the occasional deep diving work-up in Cyprus. This involved completing myriad multi-coloured forms and complying with all sorts of rules and regulations but it was worth it. 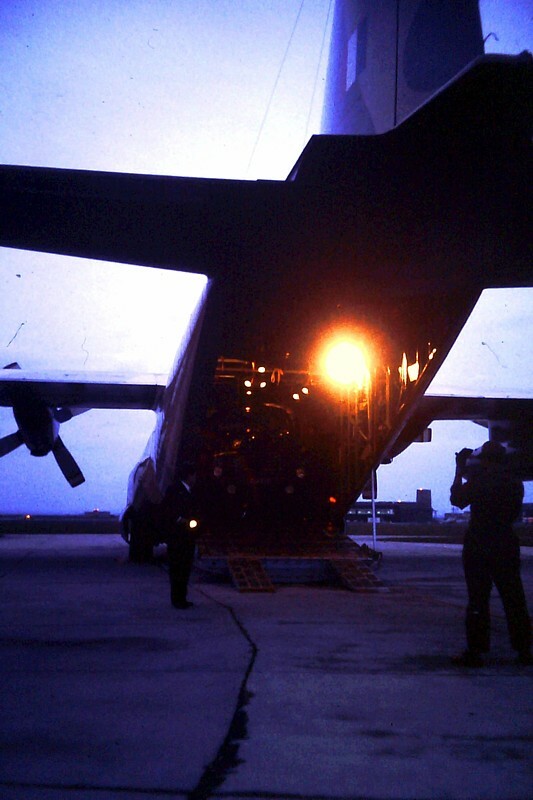 In January 1982, we stayed at RAF Akrotiri and drove the Bedford TK lorry (containing the one-man compression chamber and air bank) on to an RPL (Ramped Powered Lighter) belonging to 10 Port Sqn RCT each day. This craft then proceeded out of the little harbour until it found a suitable depth and anchored before lowering its ramp to form a convenient ‘beach’. We also conducted EAD swims in various locations and I particularly enjoyed diving on the wreck of an Italian torpedo boat off Dhekelia. 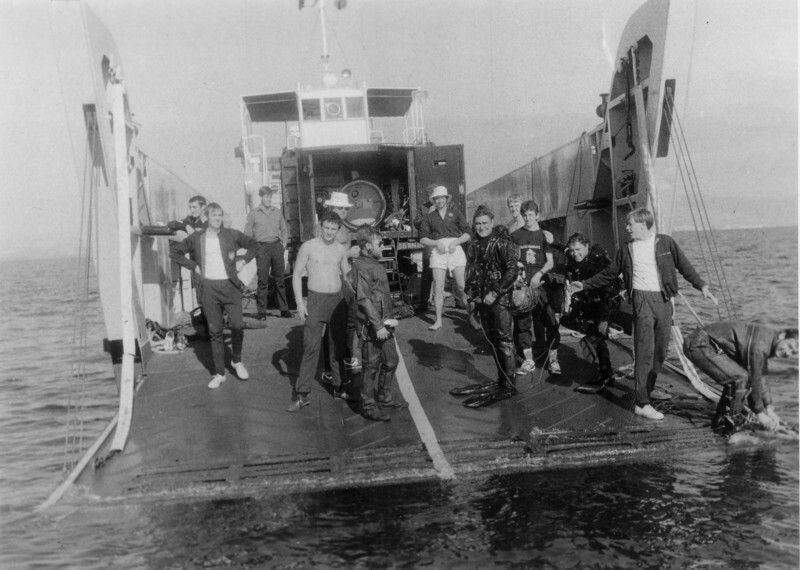 after 54 metre dive in 'old-type' CDBA off Cyprus in Jan 1982. 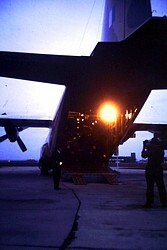 Right: PCDT Landing Crafters off Cyprus - Yours Truly rinsing out proto canister on far right. I’ll never forget the sight of divers wearing foulies while skiing (in the loosest sense of the word) in the Troodos mountains. Then there was the wonderful food: a meat meze for £2 and a fish meze for £1, both including a bottle of rough Cockanelly (sp?) red wine. 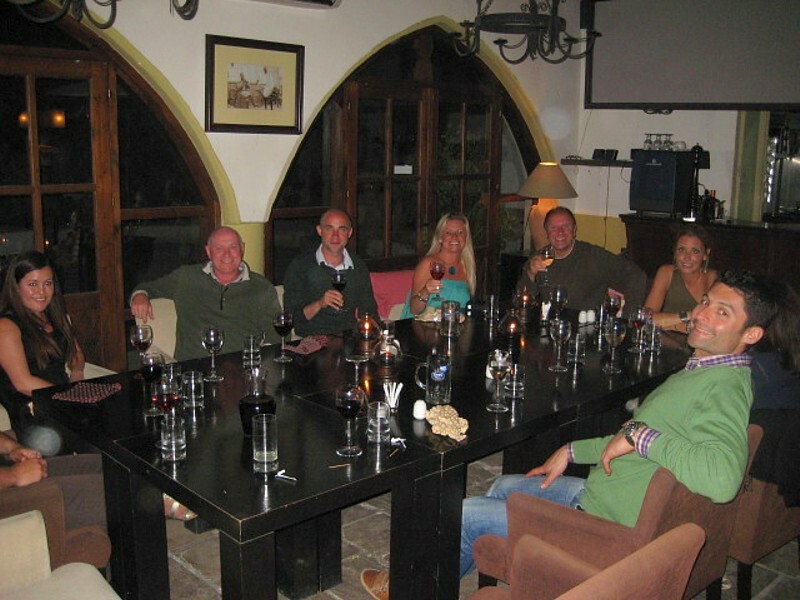 A favourite venue was a cliff-top restaurant at Paphos overlooking a statue of Aphrodite. One sunny afternoon, a few of us were sitting outside a bar in a remote village when we were joined by Joe Brown of ‘Joe Brown & The Bruvvers’; he recorded one of the first records I bought, a so-called Golden Guinea release because that was what it cost. 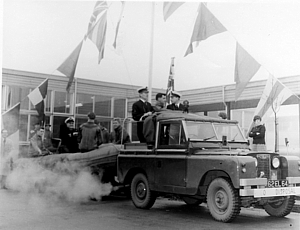 We also drove around the island unaware that the battery of our red-wing Land Rover had been drained at RAF Lyneham before being loaded on to the C-130 and not topped up again on our arrival at Akrotiri. We only found out when it was time to leave Akrotiri and the movers could only find the odd drop of acid to remove for the return flight. So much for daily vehicle checks! 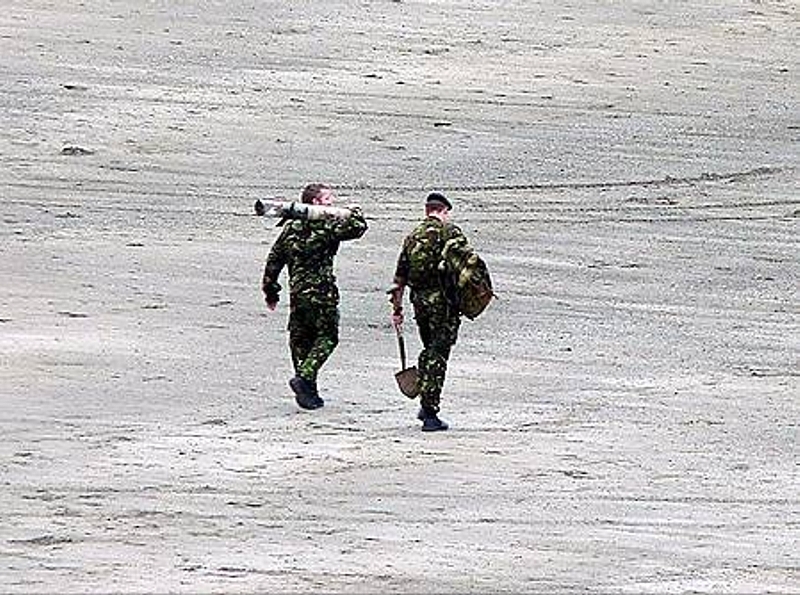 Today's Plymouth Herald contains this article describing the disposal of a pyrotechnic at West Looe by Plymouth-based Southern Diving Unit 1 (SDU1). "After the service, members of the congregation are invited to attend a reception at the the Royal Naval Club and Royal Albert Yacht Club, 17 Pembroke Road, Southsea at 1345. However, in order that numbers are known for the caterer, will people who intend to go to the reception please let me know and I will collate the list. Names by no later than Sunday 18th April. I have the following names to date: Brian and Audrey Dutton, Ron and Beryl Childs, Doug Barlow and Jill Smith, Ian and Elma Morton, David and Dorothy Bartlett, Fred Davenport, Roy. 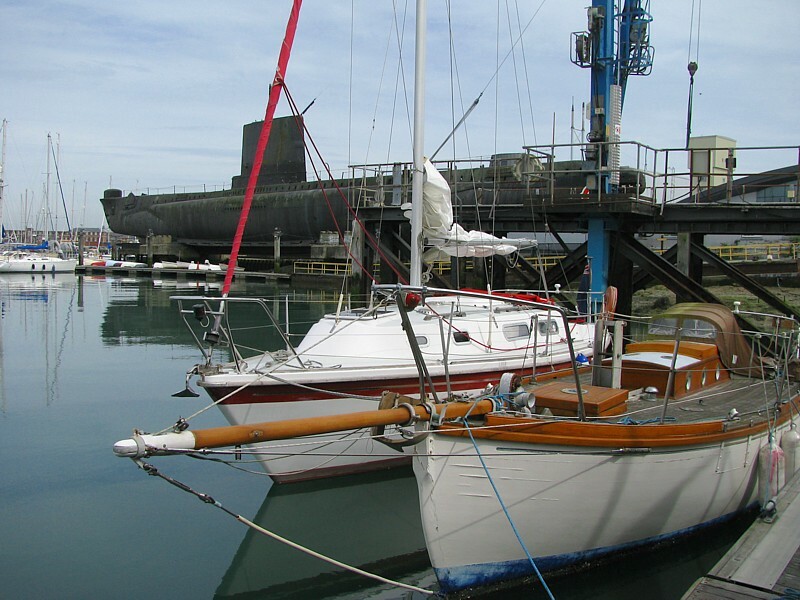 MCDOA Hon Treasurer Richard 'Soapy' Watson informs me that HMS Hurworth is due to be alongside at Gunwharf Quays (the former site of HMS Vernon in Portsmouth) during the Project Vernon promotional weekend 1 & 2 May. This is probably the first time an MCMV has been alongside 'Vernon' in any of its guises since it closed in 1996. Hurworth will be present to support an exciting Sea Cadet Festival celebrating the 150th anniversary of the formation of the Cadet movement in which our Honorary President, Capt Colin Welborn RN, is currently a key figure. Facebook users (I've just become one) may wish to know that Project Vernon has its own Group here. The membership includes some familiar names. I should have realised that someone would know better . With reference to the above article on the MCDOA website, you state that "This is probably the first time an MCMV has been alongside 'Vernon' in any of its guises since it closed in 1996." I am sad to say this is incorrect as HMS Bangor was alongside at Gunwharf two or three times as we practiced for the Queen's visit during her Golden Jubilee Review of the Fleet in 2002. 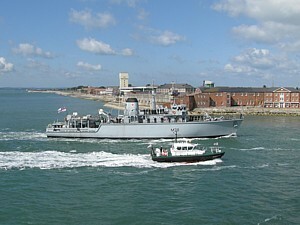 Bangor was used to transfer the Queen from the Naval Base to Gunwharf Quays. The CO was Lt Cdr Gerry Woods with Lt Alan (Dolly) Parton MCDO as XO and Lt John Bainbridge MCDO as Ops. Thanks for setting the record straight, Bob. 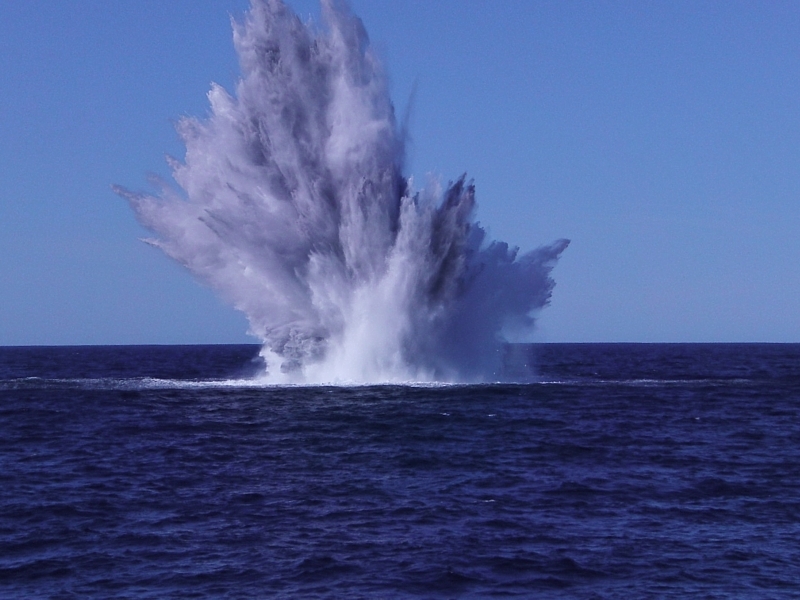 The big bang practice: The recent activities of Fleet Diving Squadron (FDS) units and personnel. ExCeLent show for Cattistock: An appearance by HMS Cattistock at the ExCeL centre in London. Rumours of my demise...: Proof that Defence cut victim HMS Walney is still alive and kicking. 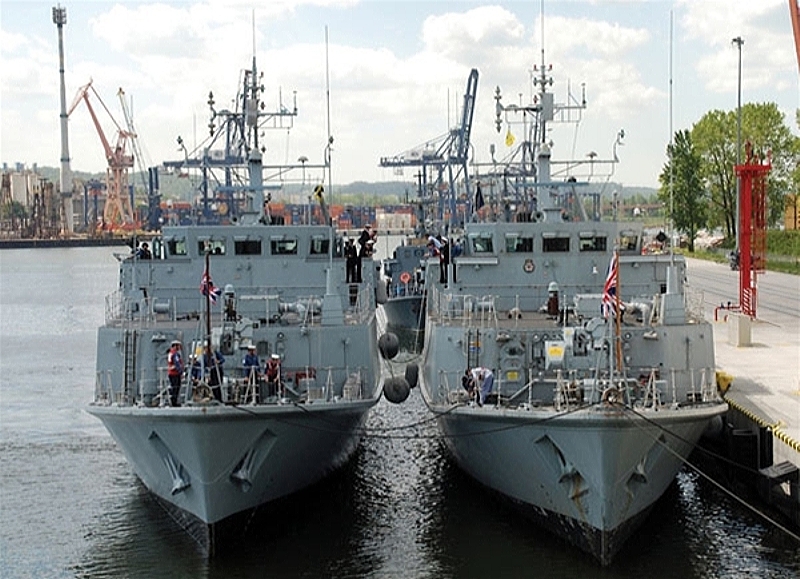 Middle watch: 'Ships of the Royal Navy' feature about HMS Middleton. 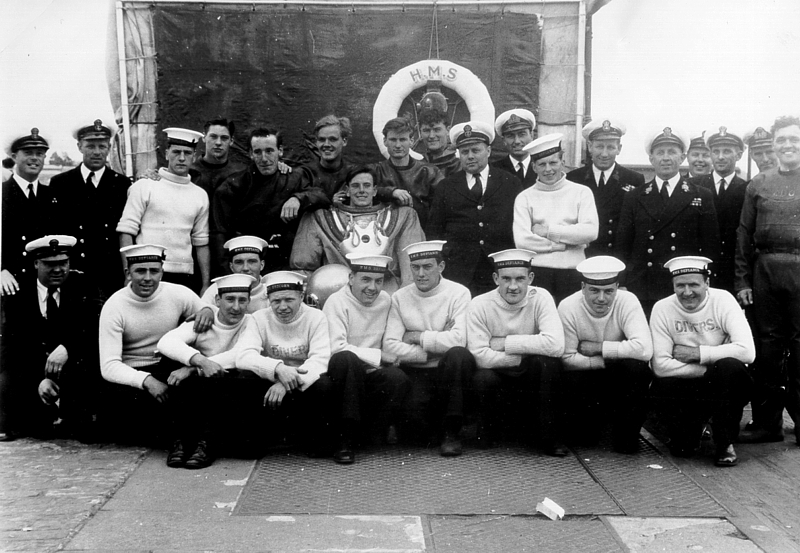 A'huntin with the Quorn: A letter from a crew member of HMS Quorn's ill-fated WW II predecessor. £50 PRIZE PUZZLE: This month's competition features a Ton Class minesweeper. 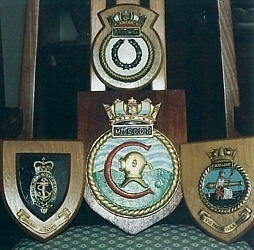 Operational honours: List includes ex-MCM2 Cdr Henry Merewether (QCVS) and LS(D) Carl Thomas (QCB). Pressure rises as medical unit opens: Opening of new Hyperbaric Medicine Centre in Chichester. "Mary's funeral will take place on Wednesday 21st April 2010 at 1230 at Portchester Crematorium. No flowers please by request but donations can be made to The Rowans Hospice. Arrangements are being made for a light reception afterwards and the details will follow. However, in order that numbers are known for the caterer, will people who intend to go to the reception please let me know and I will collate the list. Names by no later than Monday 19th April. Yesterday's Portsmouth News contained this article describing the granting of planning permission to erect the monument at Gunwharf Quays in Portsmouth to commemorate the minewarfare and diving heritage of HMS Vernon which previously stood on the site. 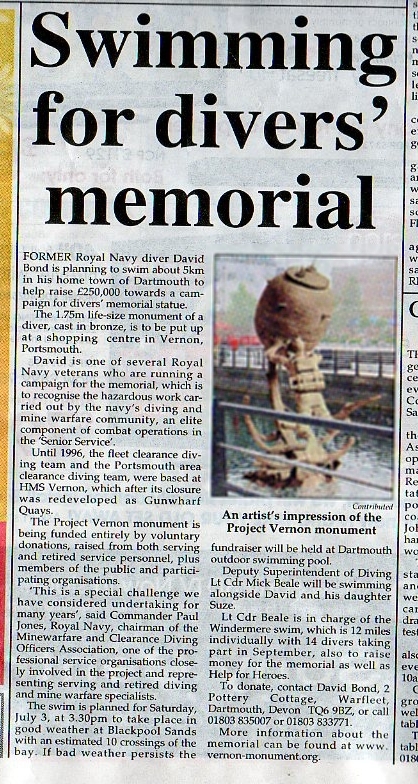 Despite the headline, the monument is intended as a tribute to everyone involved in naval minewarfare, diving and EOD. 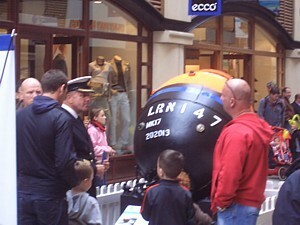 This will include the crews of MCMVs and minelayers of every description; personnel involved in the design of mines, mine countermeasures and diving equipment; bomb & mine disposal personnel; deep divers, clearance divers, ships' divers and SAR divers, etc., all of which will be explained in detail on an accompanying display. If you feel half as passionate about this impressive statue as I do, then you will not begrudge digging deep, both now and in the future, to see it reach fruition as a unique and permanent reminder of the work of our very special community. Although we have already made considerable progress, seeing this ambitious project to its conclusion will be a marathon, not a sprint. As such, it will rely on your unremitting support throughout the campaign. Please make regular donations online via the Project Vernon website, continue to buy the merchandise and raffle tickets, and support the promotion at Gunwharf Quays on 1 and 2 May. 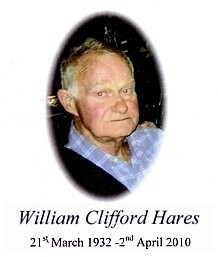 It is my extremely sad duty to inform you of my dad Cliff's sudden passing at home last Friday 2nd April. It has come as an enormous shock to us all. My mum, brothers and I, and our families have taken great comfort in the vast outpouring of grief, kind words and tributes from so many of dad's friends and business associates. Dad has left a massive hole in our lives, which perhaps only the passing of time will heal. A funeral service is to be held at St Marys Church, Alverstoke, Gosport at 11.30 am on Wednesday 21st April. Please contact me should you or any other members of the MCDOA wish to attend. This will be followed by a private cremation at Portchester attended by family only at 1pm. 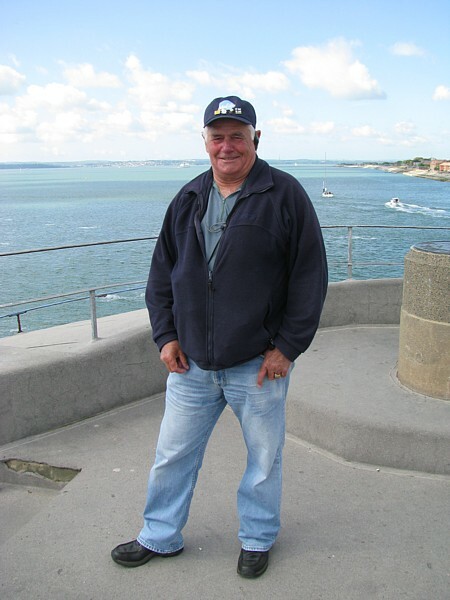 Those attending the church service are then invited to celebrate Cliff's life at The Cormorant pub in Portchester. An outwardly gruff character with an impish sense of humour and a heart of gold, Cliff Hares founded Solent Divers in Lake Road, Portsmouth and continued to run it long after most people would have retired. The family business was his life; he rarely took a day off and seldom went on holiday. 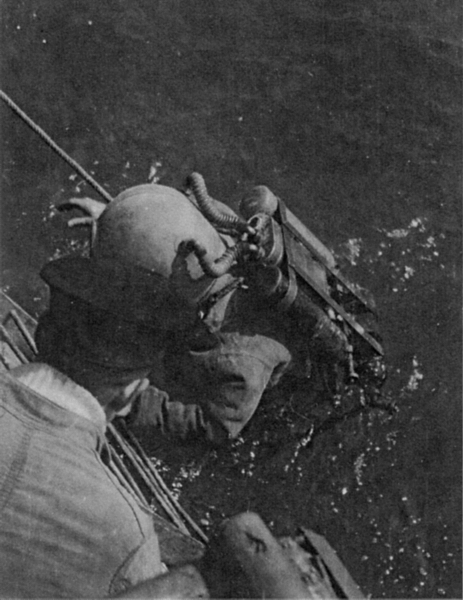 He and his staff provided made-to-measure drysuits and wetsuits for many a naval diver. A staunch supporter of RN diving, he was granted associate membership of the MCDOA in recognition of his marked contribution to the Minewarfare and Clearance Diving community and the welfare of its members. 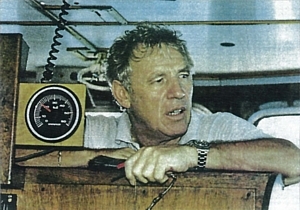 As a prime example, he cut through red tape when supplying non-freezing Conshelf Supreme demand valves for the Aquarius air diving sets used in the Falklands conflict in 1982. 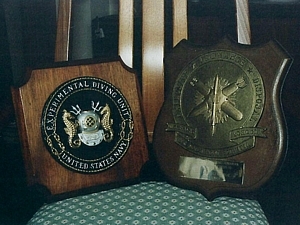 He attended most MCDOA functions with his sons and insisted on donating the inscribed glass mines and divers presented to members of the Association on their retirement from the Service. He was also a staunch sponsor of the annual RN Divers' Golf Championships at Southwick and he and his family threw themselves into it and the ensuing social evenings. 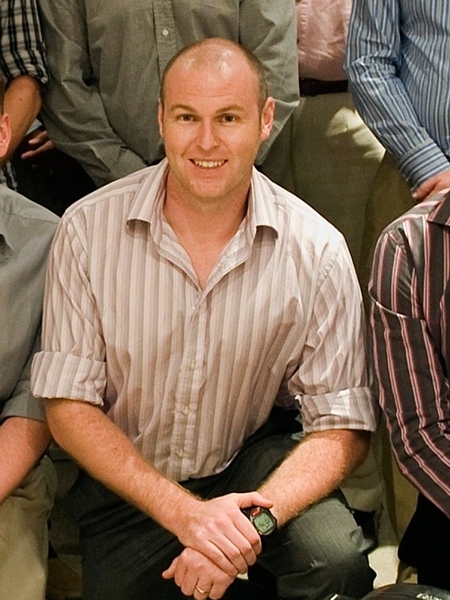 We extend our heartfelt condolences to Cliff's family, work colleagues and friends. "In addition to the contribution that Cliff made when obtaining the diving equipment from the US during the Falklands war, he and Elaine King (who subsequently went to Oban and worked for Northern Divers) worked round the clock, often sleeping in the work place whilst making the diving suits for use down south. That was his introduction into supplying service equipment and went from strength to strength. 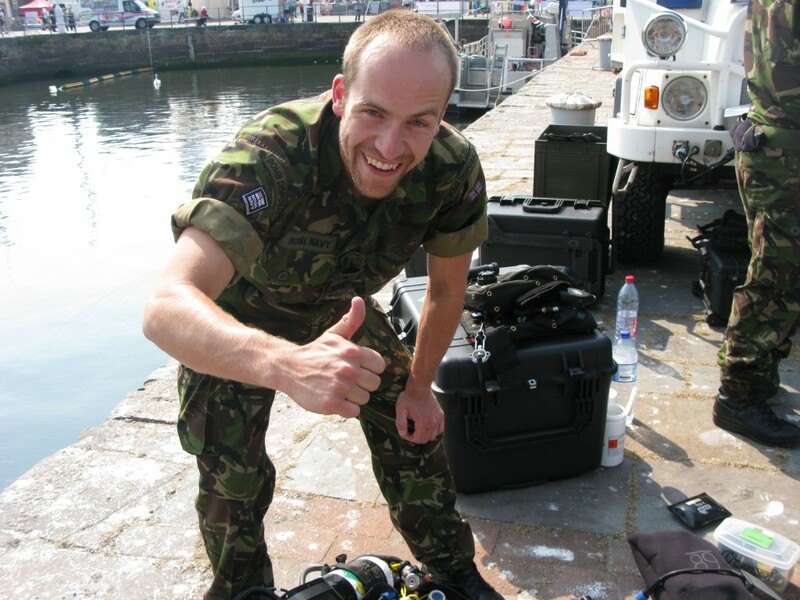 He was a rough diamond with a heart to match who served us all very well and thoroughly enjoyed his association with the service diving fraternity. "To all of Cliff's family, my sadness and thoughts go out to you. 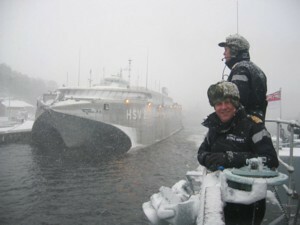 I am away working in the Baltic at present and will not be able to attend on this sad day. My thoughts will be with all of you. Sorry to hear the very sad news of Cliff's passing. Couldn't agree more with both your and Jimmy Green's comments: he was a loveable rogue, whose wise words and wicked sense of humour, I will certainly miss. Athough it pales into significance when compared to his support for the Diving Branch, he was a staunch sponsor of the RN Divers' Golf Championship. Especially, with his hate of the game! My lasting memory of him will be, as a WO(D) on the Guzz Team, delivering his favourite Ivor Dewdney pasties to his grand house in Alverstoke. I know how busy you will be on the day, but if you can pass on my condoleneces to Alan and his family, it would be much appreciated. I will certainly raise a glass of his favourie tipple to his memory. Keith Riches is retiring but he has a plan! MCDOA member Keith Riches informs me that he is finally retiring from his job with a certain defence manufacturer on 30 April. However, he is not ready for his rocking chair quite yet. 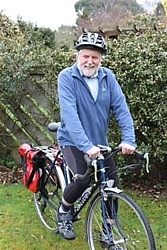 He intends cycling from Land's End to John O'Groats in aid of Motivation, a charity that improves the mobility and quality of life of disabled people in the developing world. If you wish to sponsor the old goat for this worthy cause, his Just Giving webpage is available here. 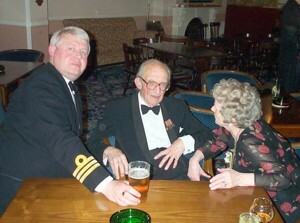 Anyone who remembers the late MCDOA associate member Jimmy James (see entry for 25 Apr 2004 in News Archive 6), erstwhile Wardroom mess manager at HMS Vernon, is likely to remember his diminutive but indomitable and fun-filled wife Mary. Sadly, MCDOA member Brian Dutton has informed me that Mary passed away peacefully at Queen Alexandra Hospital near Portsmouth late on Sunday (4 April) after a long illness. 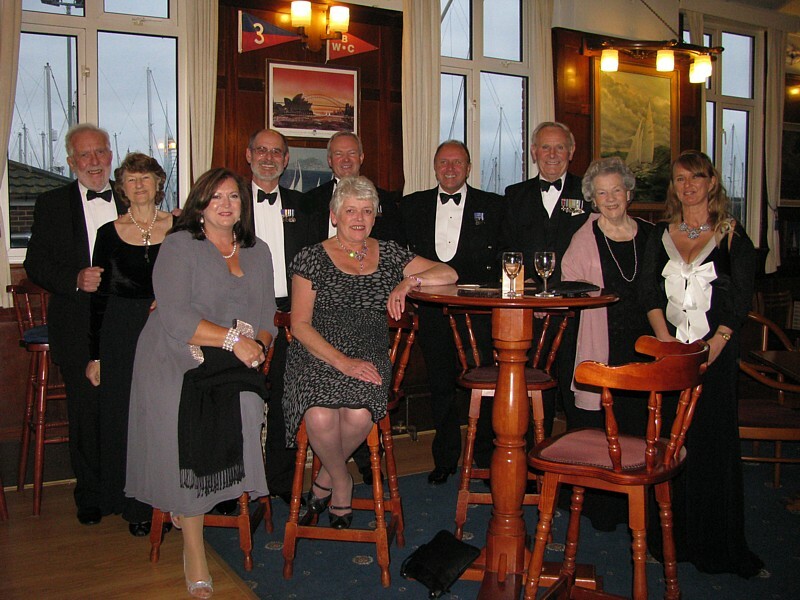 After Jimmy's death, Mary was supported by members of the MCDOA and Portsmouth Retired Naval Officers' Association (PRNOA). She continued to attend monthly lunches in HMS Nelson's wardroom and other service functions until fairly recently. I am sure that everyone will join me in extending our sincere condolences to her family, particularly her daughter Rowena, son-in-law Peter and their children. I have asked Brian to keep us informed of any funeral arrangements. "Sad news indeed, Mary was a lovely lady and part of a wonderful double act. She had the ability to light up a room just by being there. 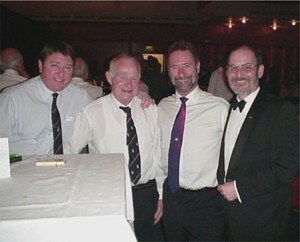 Robin Bennett, Honorary Secretary of the RE Bomb Disposal Officers' Club (REBDOC), informs me that the club's 70th Anniversary Spring Lunch will be held in Catford on Saturday 15 May 2010. MCDOA members are most welcome to attend at a cost of £25 per head. I hope to attend and would welcome the moral (or even immoral) support of fellow MCDOA members. The calling notice and booking form are available for download here. Today's Portsmouth News contains this article describing the handing over of a cheque to 'Help for Heroes' by MCDOA member Tom Russell, the recently esconced CO of the Defence Diving School (DDS). Unfortunately, as in the hard copy version, the heading of the website article shows a figure half the true amount mentioned in the text. Plans are being drawn up for the construction of an underwater dining facility at the Defence Diving School (DDS) on Horsea Island near Portsmouth. 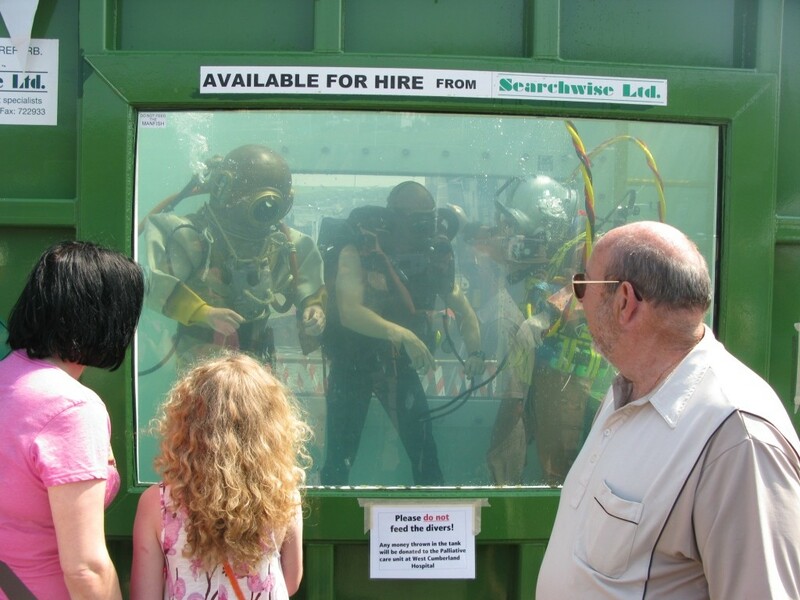 The totally transparent structure will be fabricated ashore by Royal Engineer trainee divers under the watchful eye of their instructional staff before being sunk into position in Horsea Lake by their Royal Navy counterparts. "We are really excited about this concept. 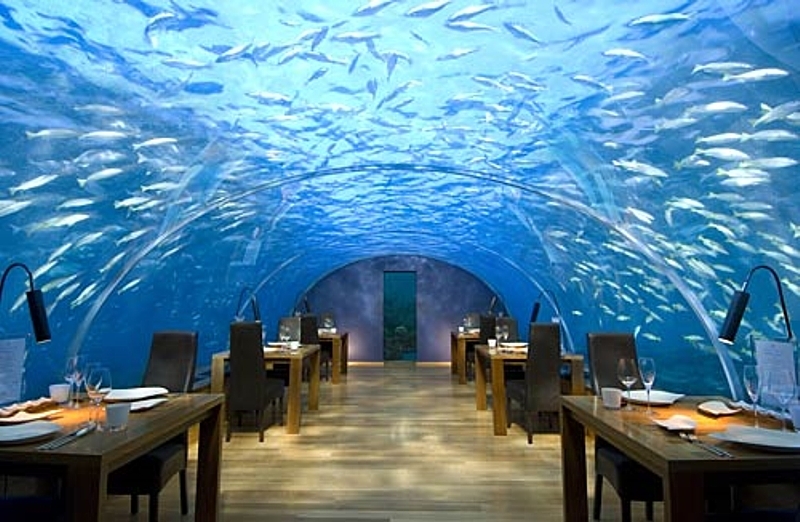 We try to engender water confidence in our RN and Army trainees and this facility will enable them to feel thoroughly at home in an underwater environment, even when eating their meals." For health and safety reasons, each meal will be followed by two hours of theory instruction before students are allowed back into the water. Fortunately, the depth is too shallow to require decompression in order to avoid getting 'the bends'. The structure will use lightweight composite materials including clear polycarbonate panels and a carbon fibre framework but will be pressurised to around 15 psi to withstand the external force of water. Users will enter through an airlock and remove their diving suits and equipment before being permitted to take their seats. Prepared meals will be delivered from a galley ashore via a smaller airlock and kept hot until required. An initial prototype module will be available for officers to trial this summer but the complete facility won't be operational until the first of April next year. More ground-breaking computer generated images of the planned construction are available via this link.